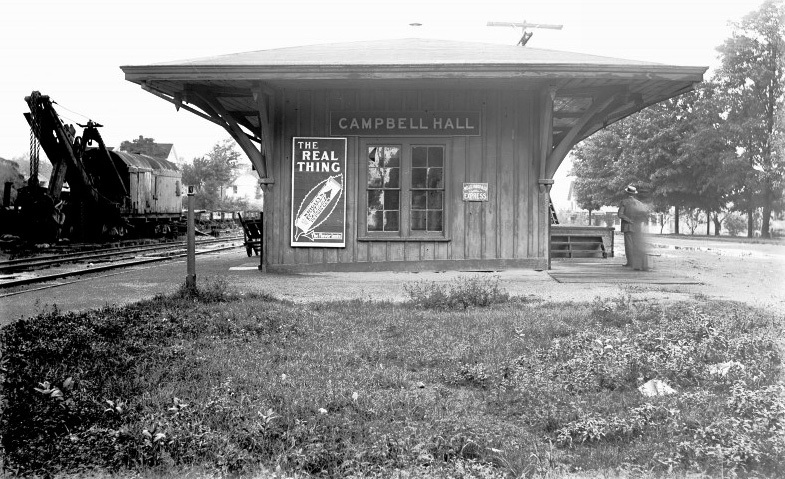 Early 1900’s views of the Erie’s Campbell Hall station, which was on the Montgomery Branch. 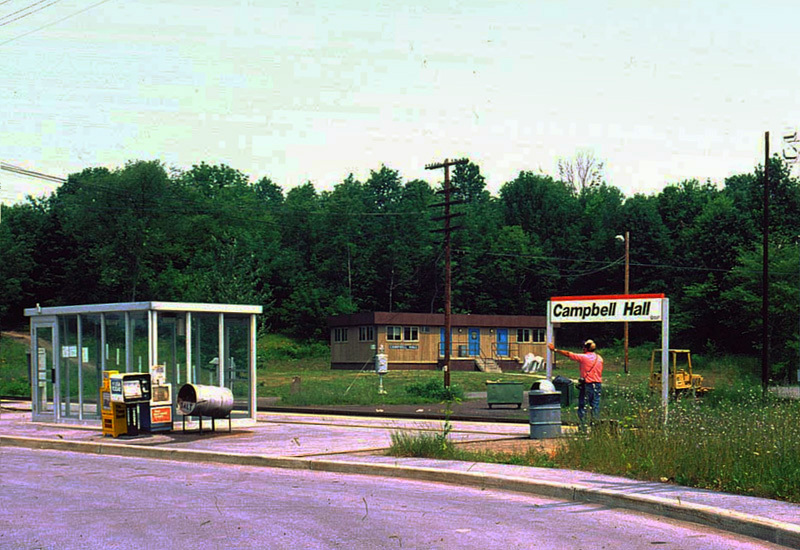 The current Campbell Hall station is now located on what was the Graham Line. 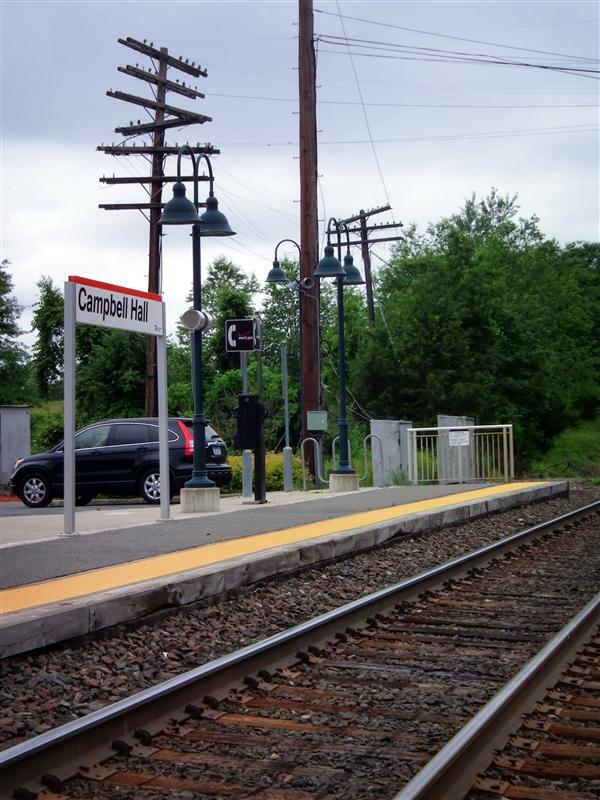 As we continue our tour of the Port Jervis line, the next stop we arrive at is Campbell Hall. 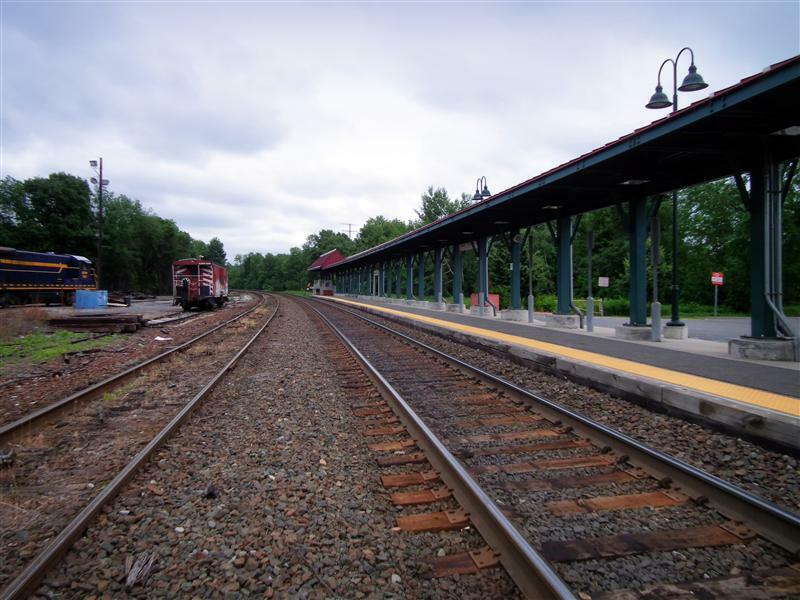 While the Metro-North facilities here are rather dull, there is a little bit of interesting stuff that does go on at this station. 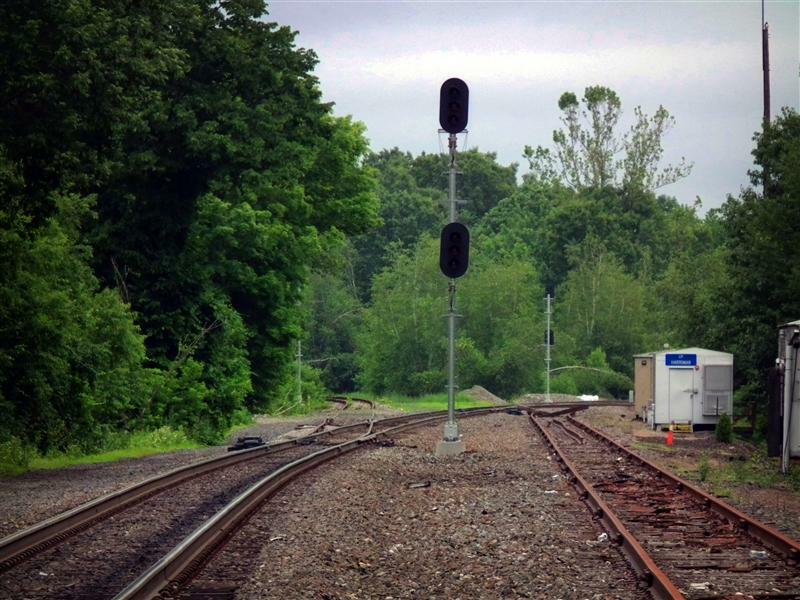 What you’ll immediately notice are the multiple tracks – since the majority of the Port Jervis line is single-tracked. 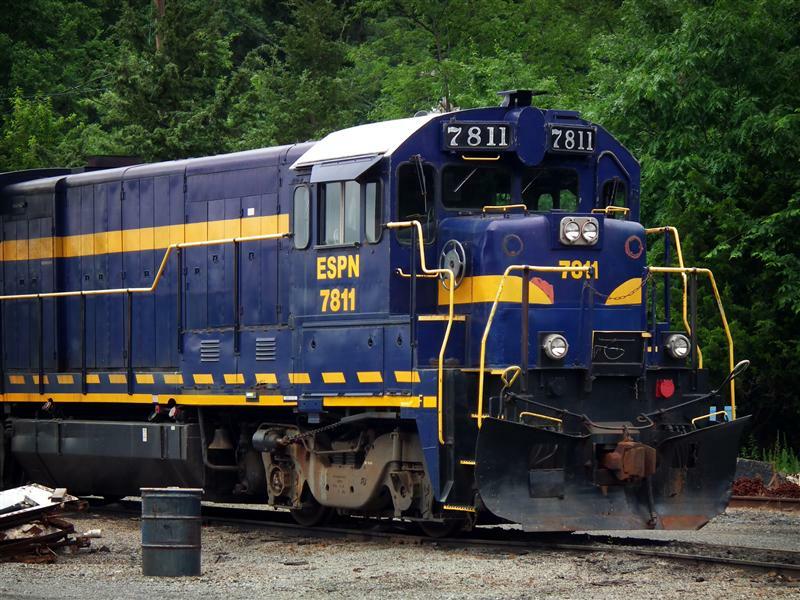 Stowed on a few of the tracks are various train cars, and maybe if you’re lucky you’ll see a locomotive. 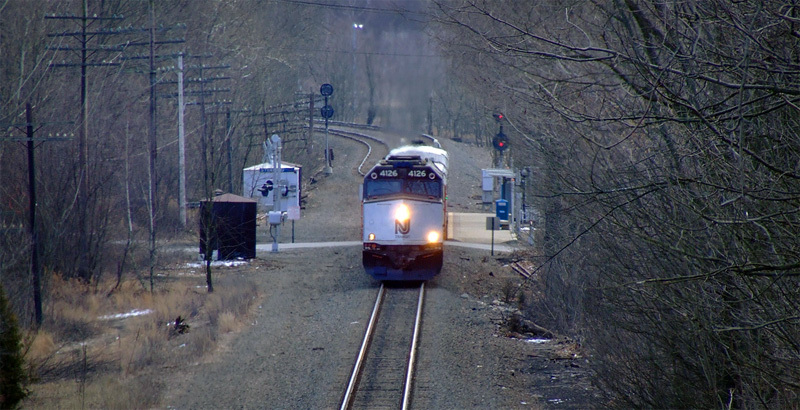 Though a few of them might belong to Metro-North or New Jersey Transit, the majority probably belongs to the Middletown and New Jersey Railroad, which operates through Campbell Hall. 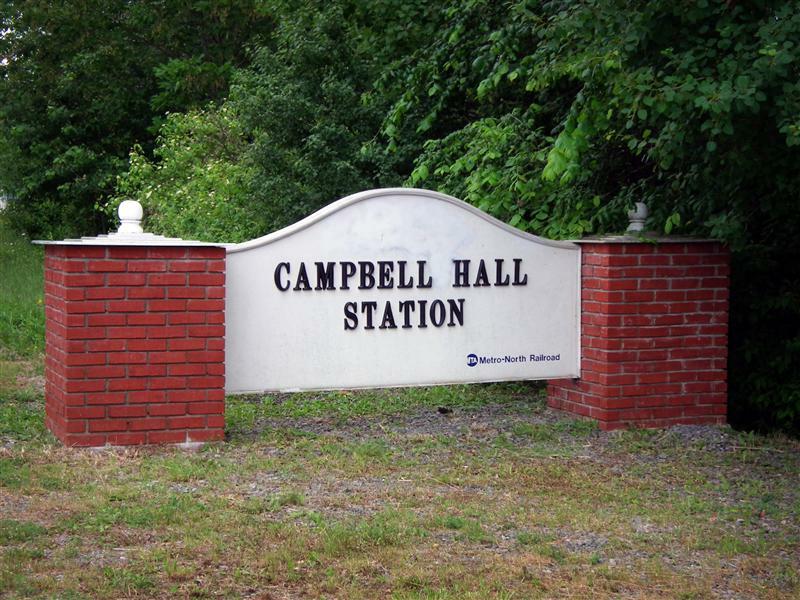 Though the Erie did have a station at Campbell Hall, it was not located along this line. 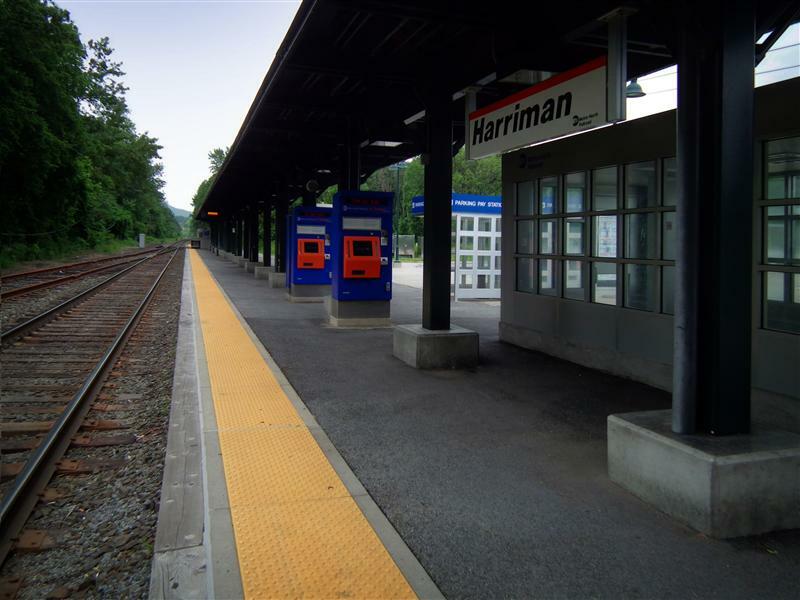 When Metro-North took over operations in the 80’s, a small facility was established here, as there were no stations on the Graham Line previously. 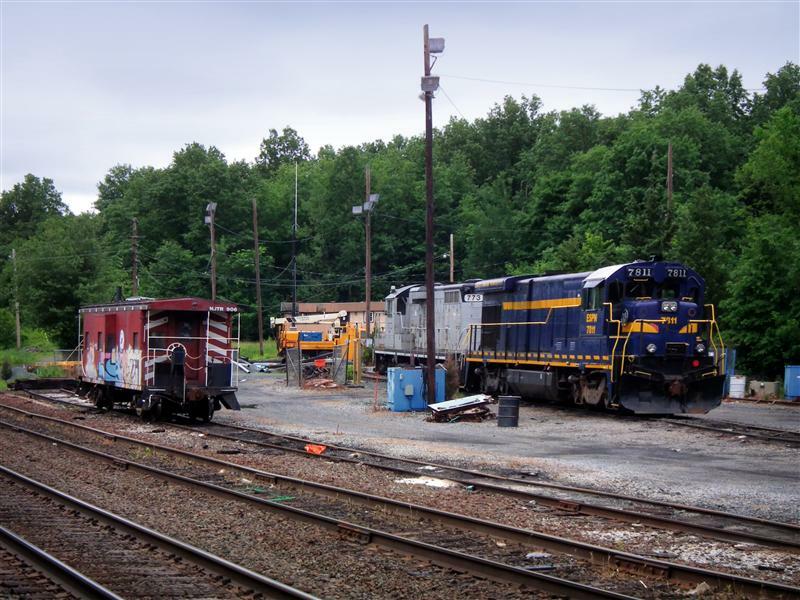 Like many of the other Port Jervis line facilities we’ve seen, there is not too much here. 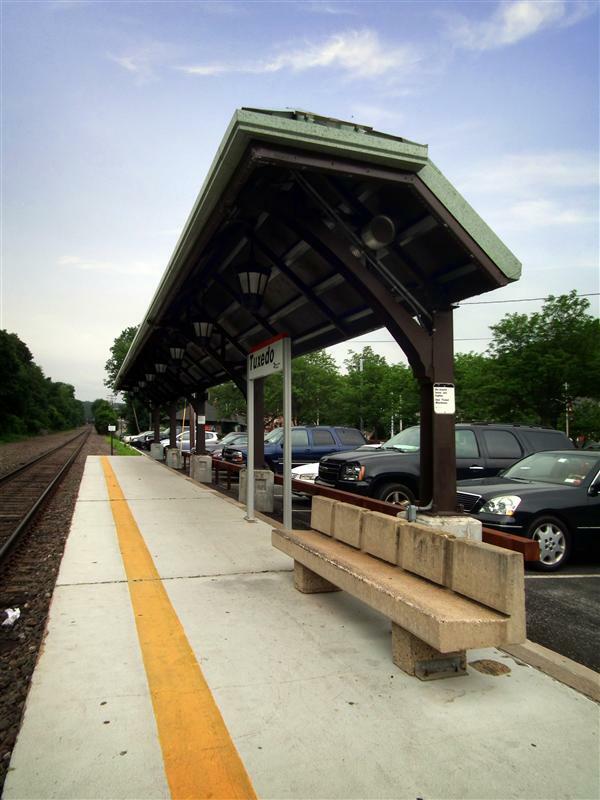 The low-level platform is partially covered by a canopy, and there is a small shelter to protect riders from the elements. 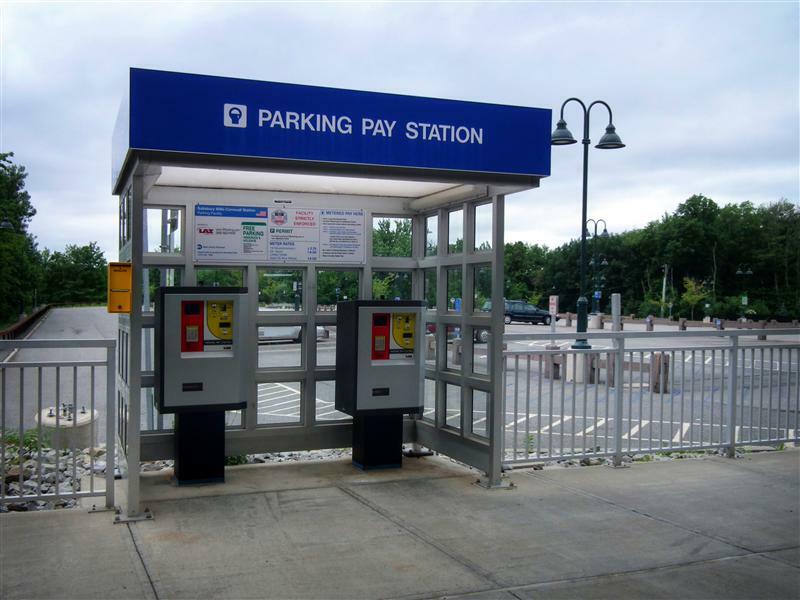 Located inside the shelter are two New Jersey Transit ticket vending machines. 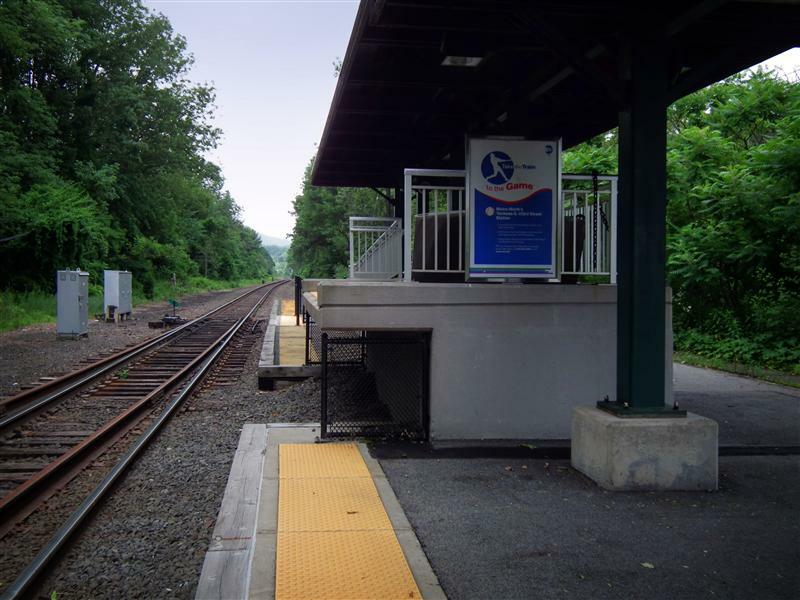 The station has a small high-level platform section to accommodate riders in wheelchairs, but is not considered a fully ADA accessible station. 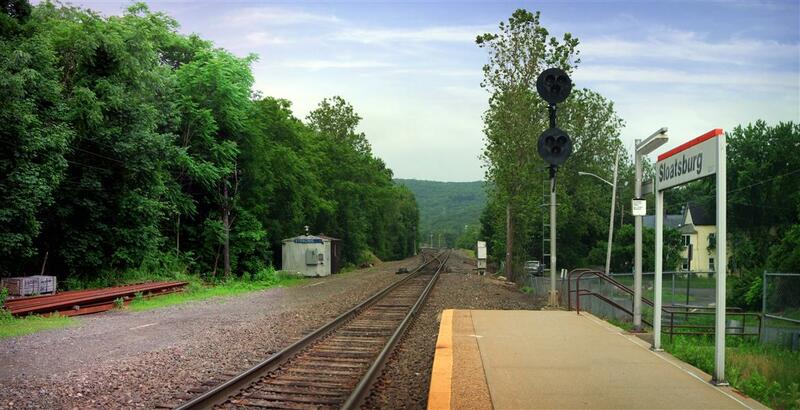 Dispersed along the platform are a few planter boxes containing trees… which would probably be a nice touch anywhere else, but we are pretty much located in the wilderness already. 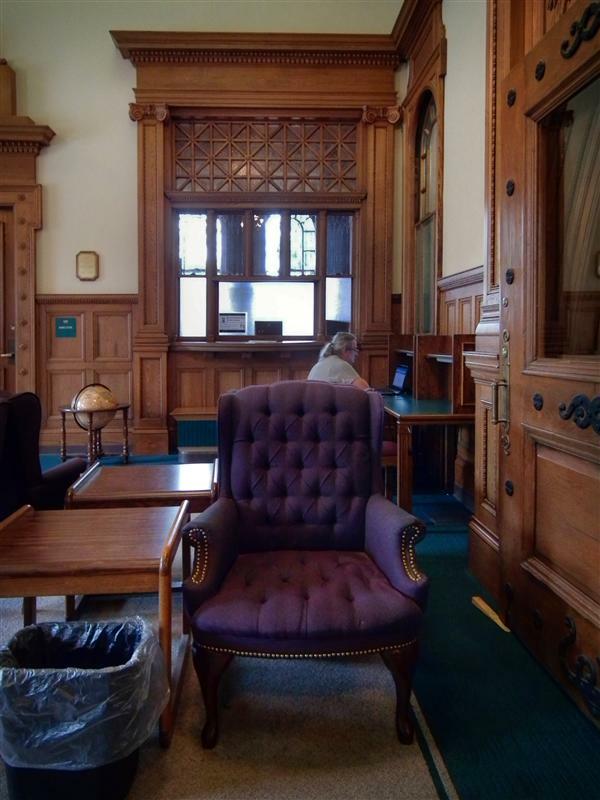 Wilderness case-in-point. 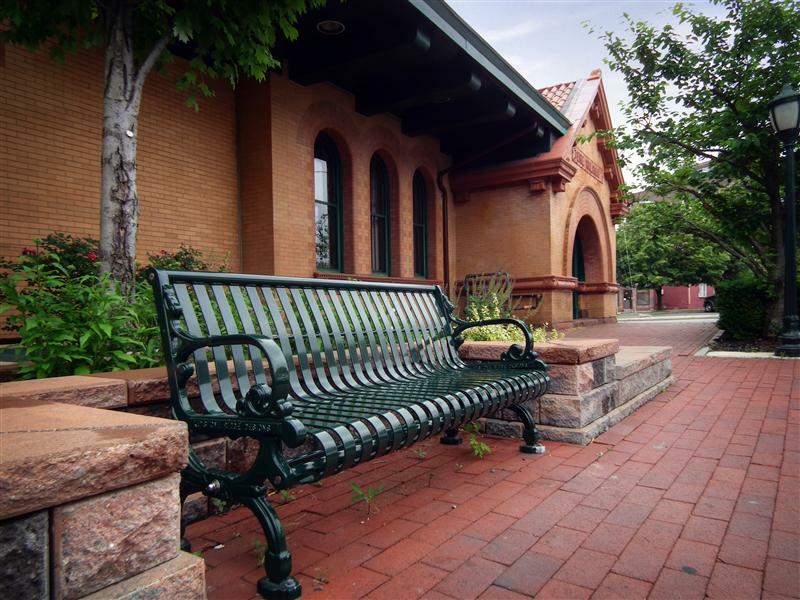 You can photograph both trains and wildlife at Campbell Hall. 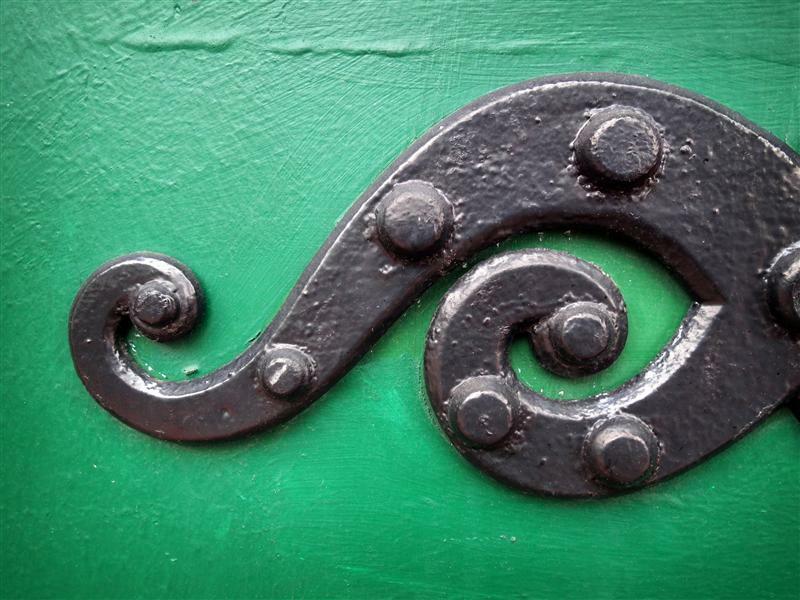 I’ve named this little fellow Paulo coelho. 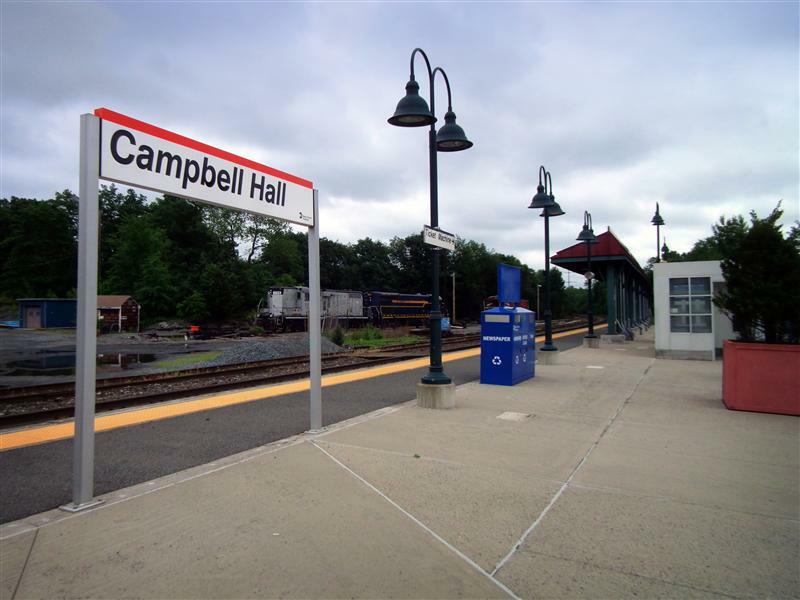 Campbell Hall was certainly a lot more interesting in the past, with several railroads passing through the small hamlet – but today it is just serviced by Metro-North’s commuter trains, and some occasional freight. 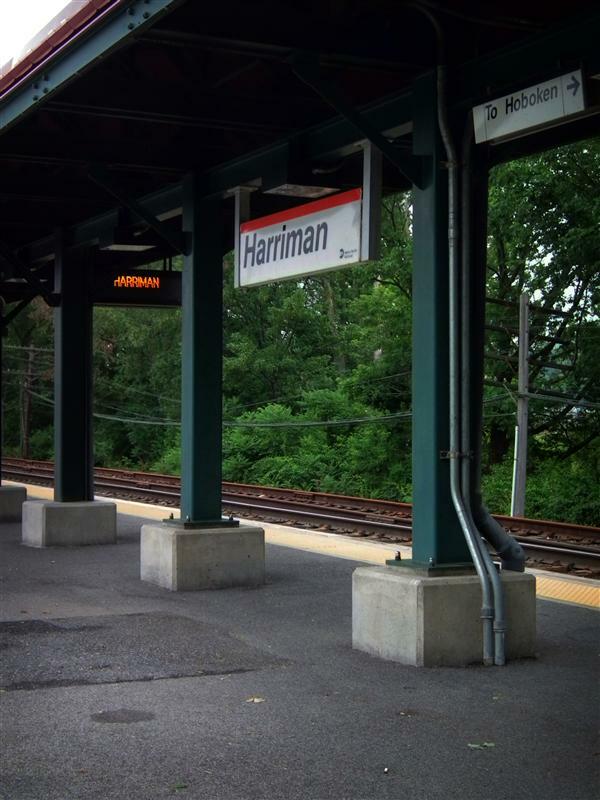 On the commuter side of things, a ride from Campbell Hall to Penn Station in the city will take you slightly less than two hours, and to Hoboken about an hour and a half. 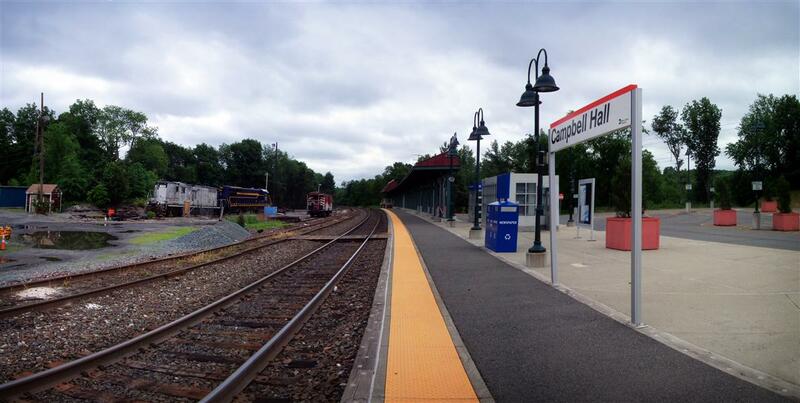 Though my stormy-day photographs of Campbell Hall are hardly spectacular, thankfully they are not the worst photos ever taken here – I bestow that honor upon Metro-North itself. 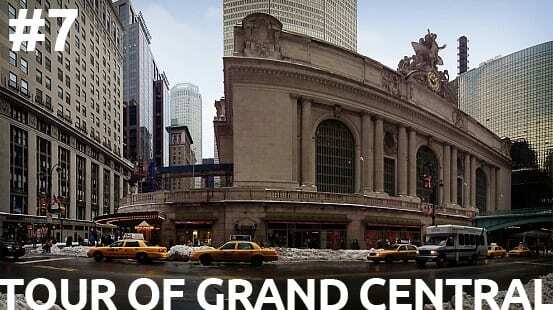 One of these days they are totally going to update their site, so it doesn’t say that Campbell Hall is “65.6 miles to Grand Central Terminal” – but that day probably isn’t today. 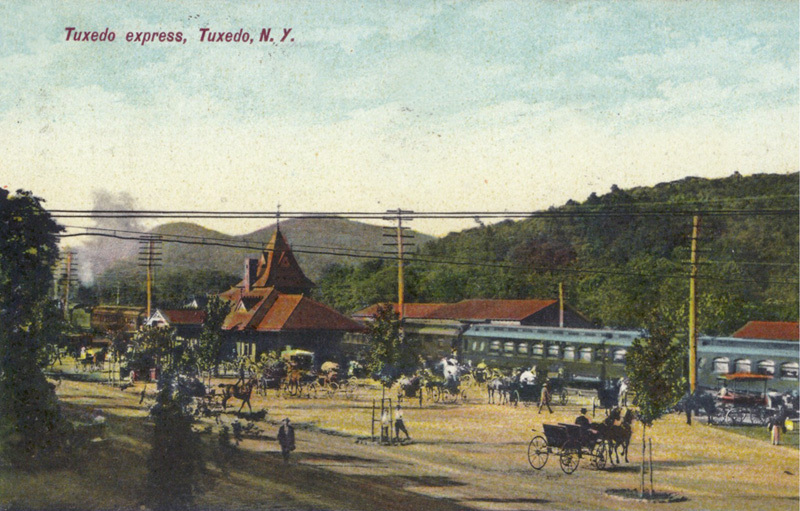 Postcard views of Tuxedo, from the collection of Steve Swirsky. 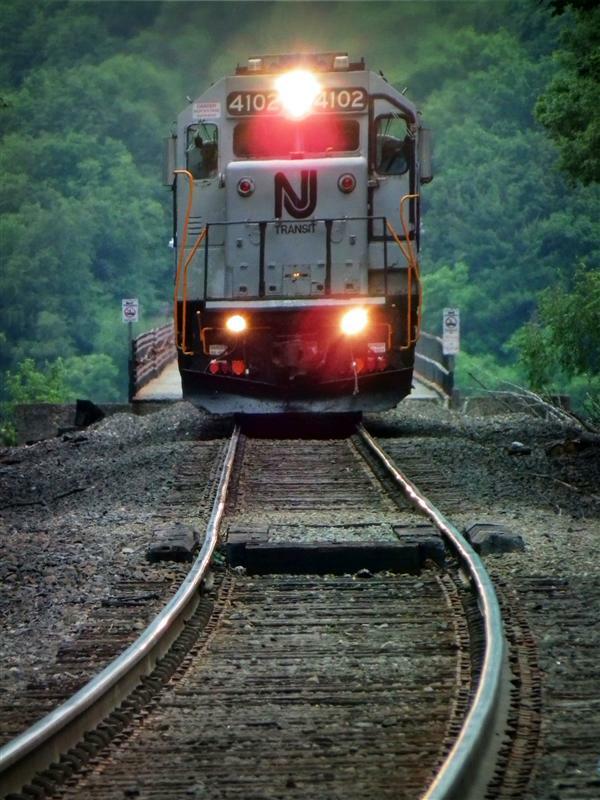 While taking a ride on the Port Jervis Line, you will travel through Metro-North’s most rural territory. 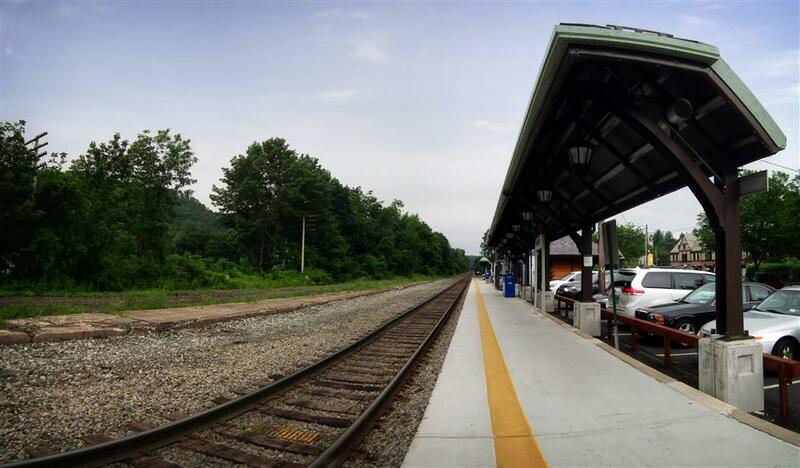 Although the trees and greenery along the route can be quite scenic, the stations along the line are rather rudimentary, bare-bones facilities. 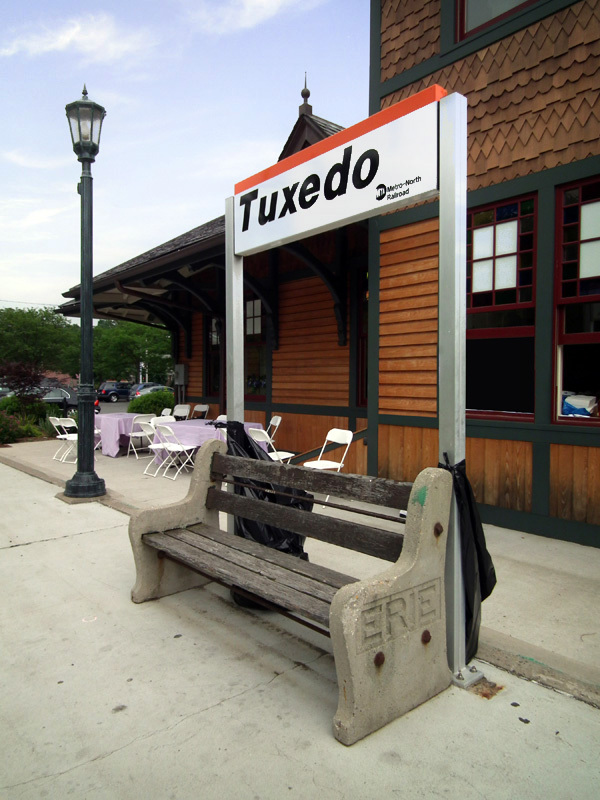 The only exception to that is Tuxedo – today’s stop on our tour of the Port Jervis Line. 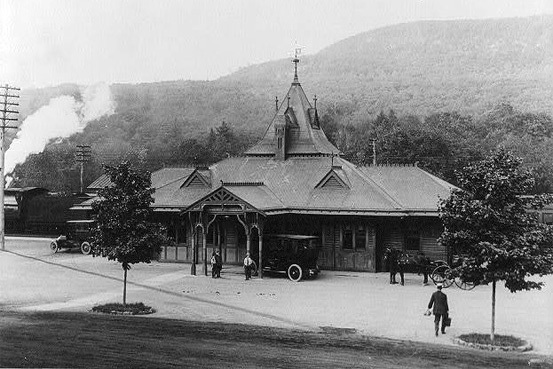 Tuxedo is the only station on the line that has its historical station building still standing, and at the same site of the current station (Metro-North’s Port Jervis station was relocated, about two-tenths of a mile past the original station). 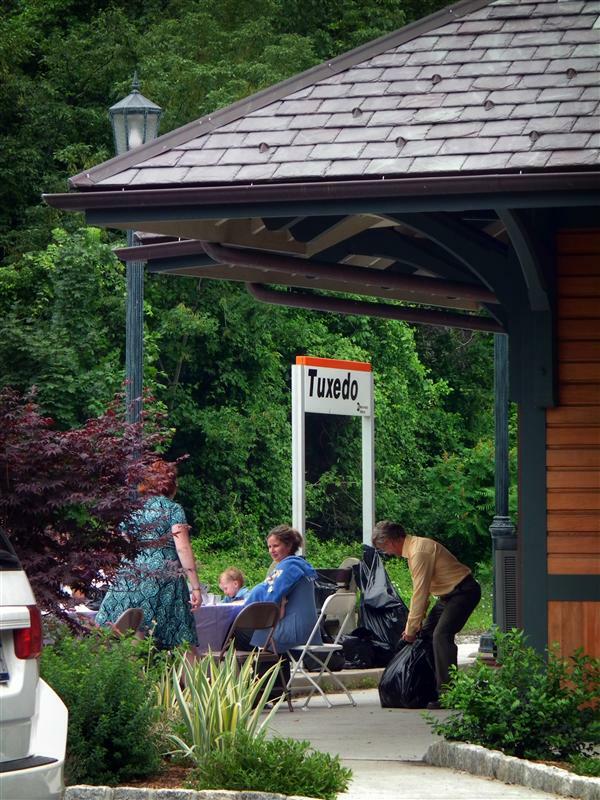 For this reason, you could probably say that Tuxedo is the nicest station on the Port Jervis Line. 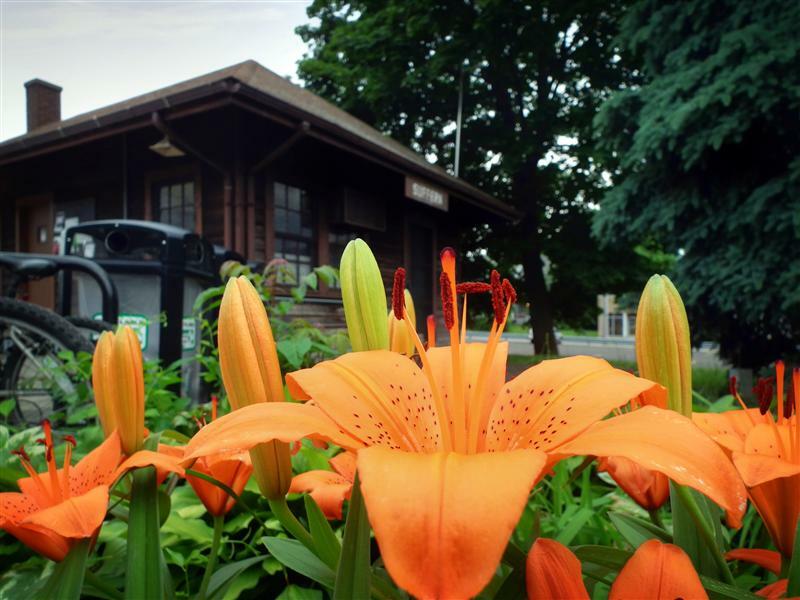 Though the building is owned by the town and is no longer used for any railroad-related purpose, it is a gorgeous old station that certainly gives the place a little character – something that is really absent at other Port Jervis stations. Tuxedo Park – the village where the station is located – is a nice little area with a bit of history behind it. 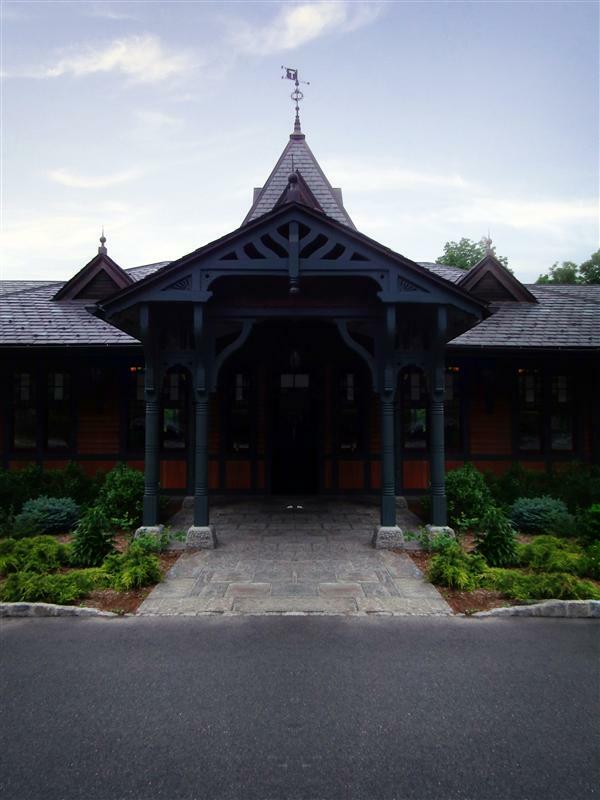 Originally founded as a resort community for the rich, Tuxedo Park was conceived by Pierre Lorillard IV and designed by architect Bruce Price. 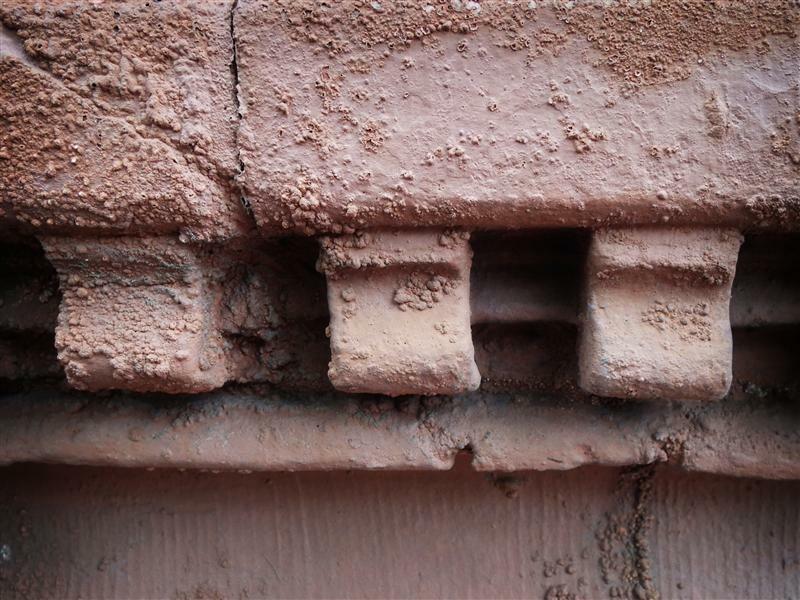 Work commenced on this planned village in 1885 and took eight months, with the labor of 1800 men. 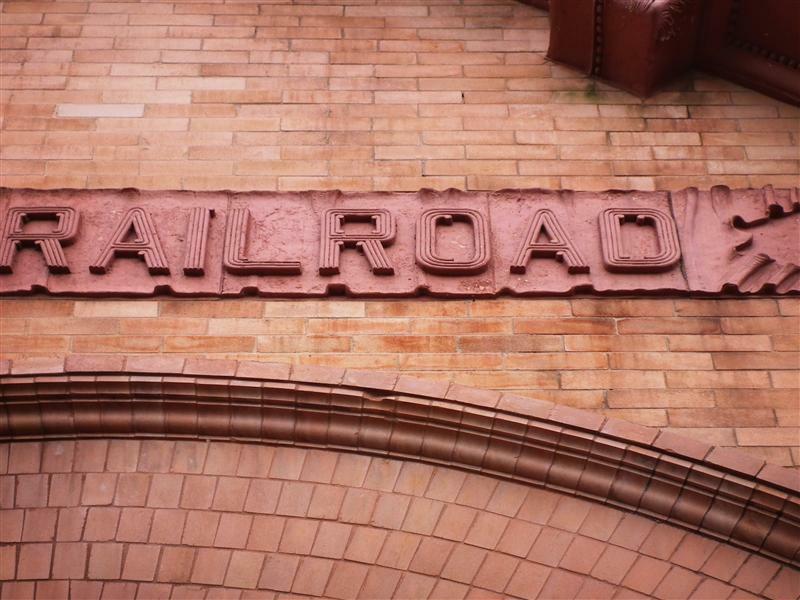 As we’ve seen in many of the places we’ve visited, the placement of Tuxedo was deliberate and influenced by the railroad. 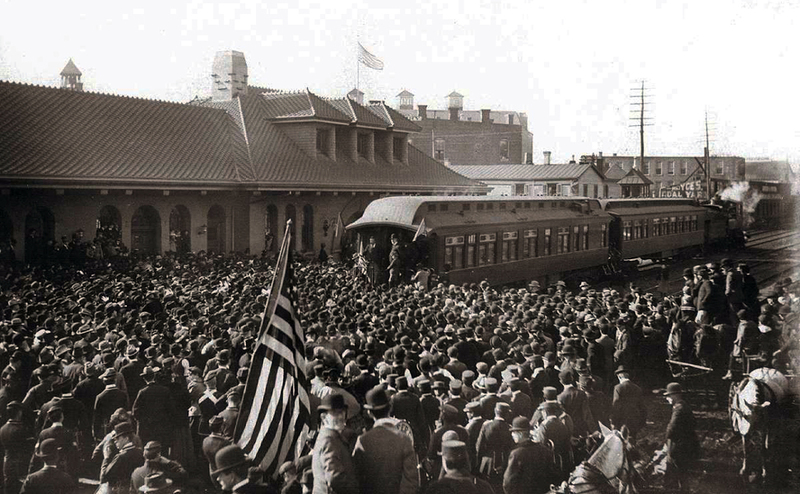 Founder Lorillard hoped to create an exclusive community, attracting the well-to-do businessmen and socialites of New York City. 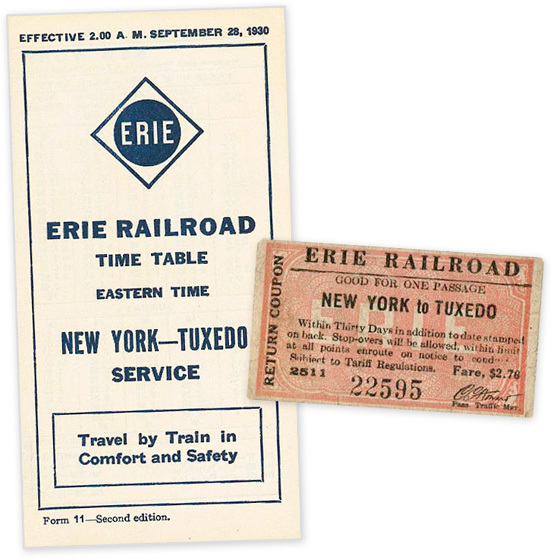 The fact that Tuxedo was linked by the Erie Railroad to the city, in about an hour’s time, was certainly an important factor. 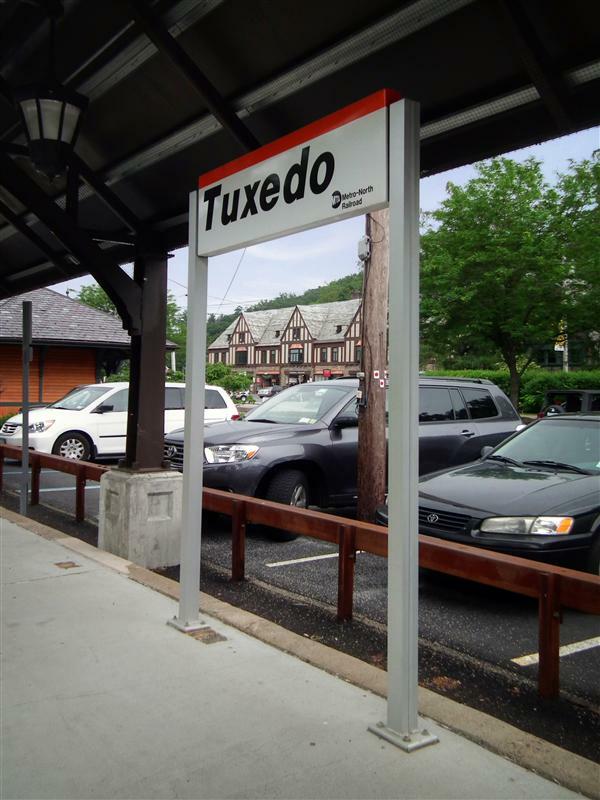 Though certainly known today for its charm as a beautiful community, Tuxedo does have a few claims-to-fame. 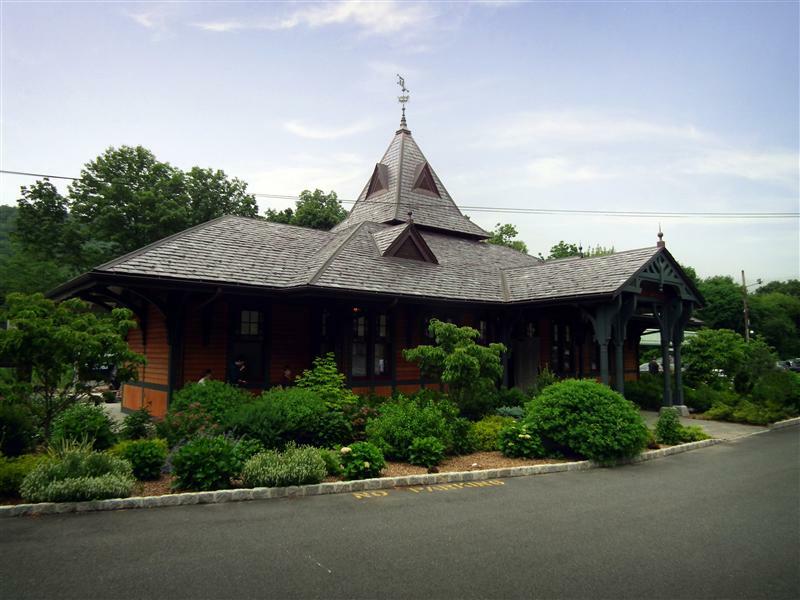 One could consider it the “birthplace” for American etiquette, as author, socialite, and Tuxedo resident Emily Post (daughter of architect Bruce Price) wrote several bestselling books on proper etiquette. 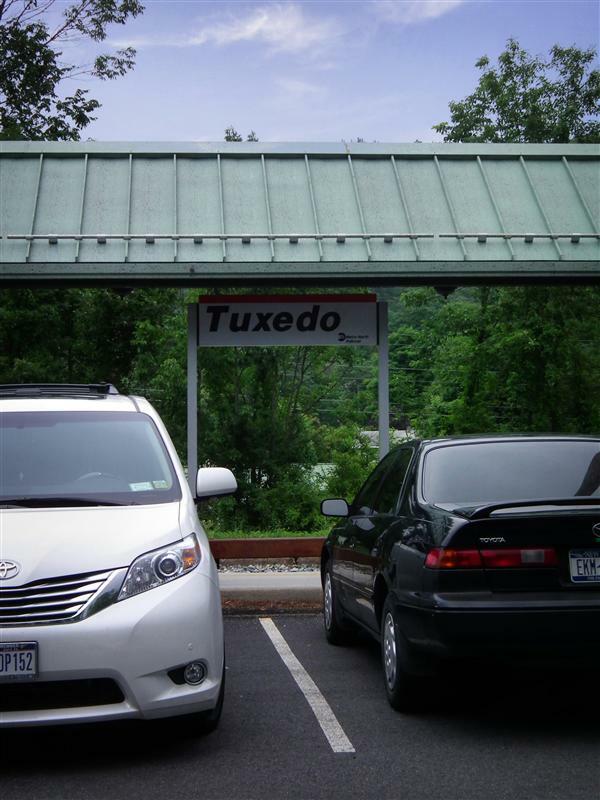 And although the origins of the term are not entirely agreed upon, the word tuxedo (as in men’s formal attire) perhaps originated here, a name that derived from the clothing men would wear to the Tuxedo Club. 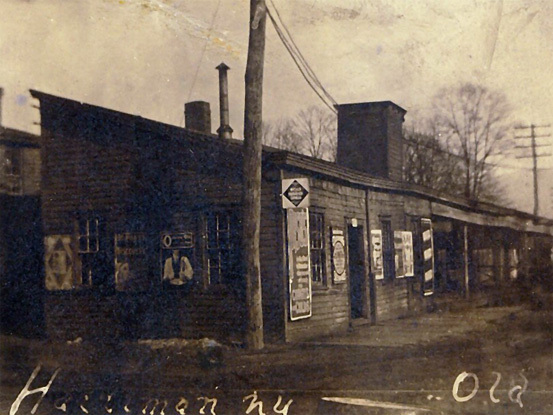 Early 1900’s view of Tuxedo station. 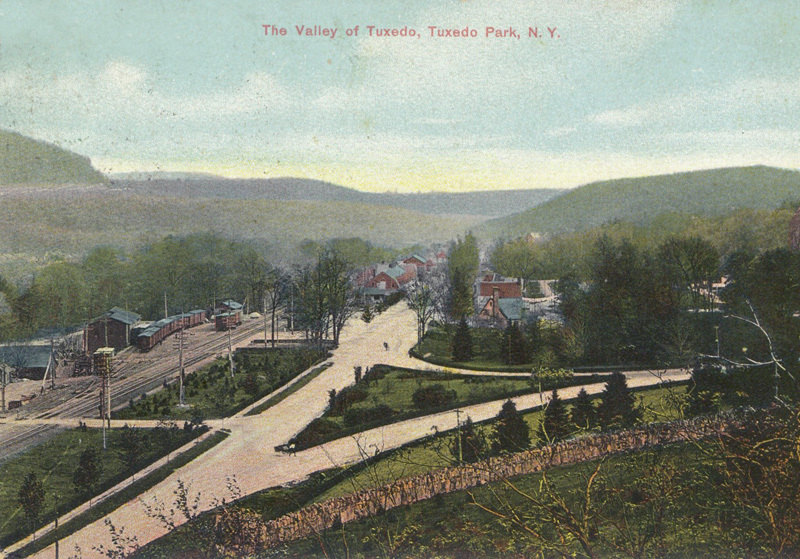 Photo from the collection of the Tuxedo Park Library. 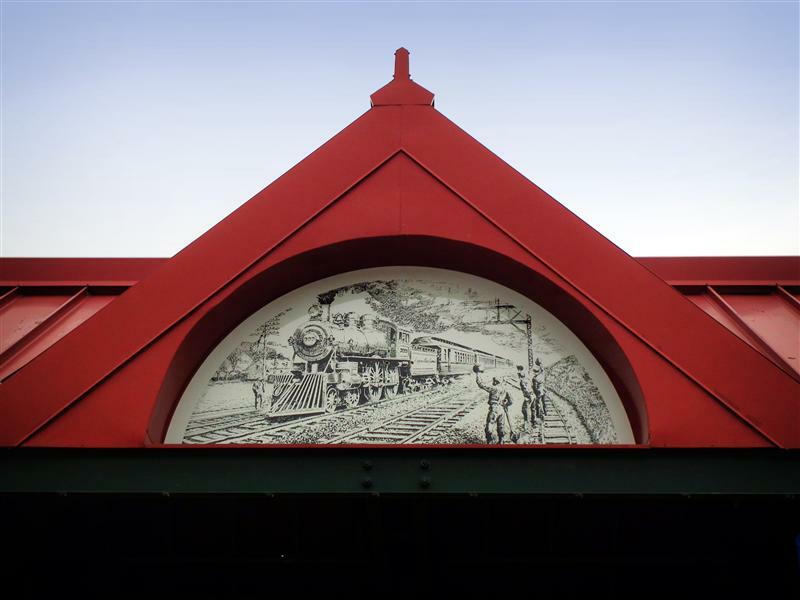 Although the architect for the station in Tuxedo is not definitively known, it is assumed to be designed by Tuxedo’s architect Bruce Price. 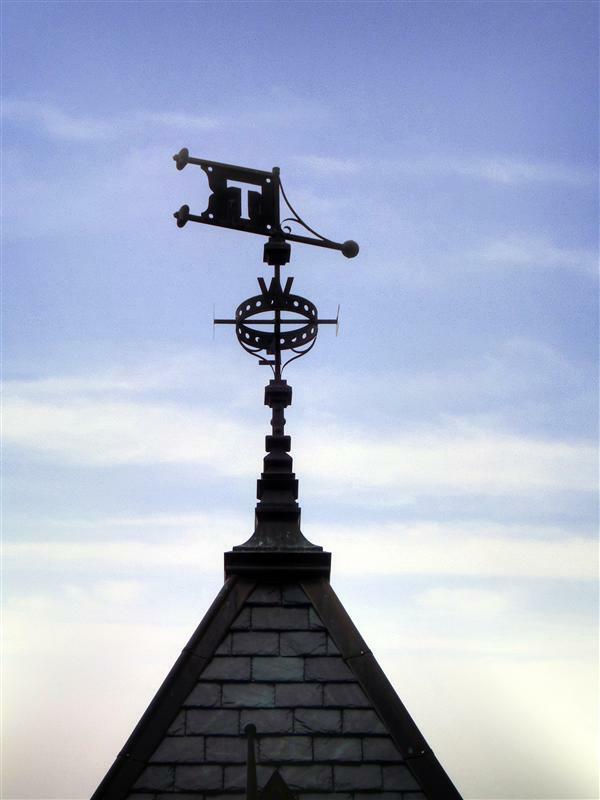 The Tuxedo Club, as well as twenty-six residences in the village were all designed by Price. 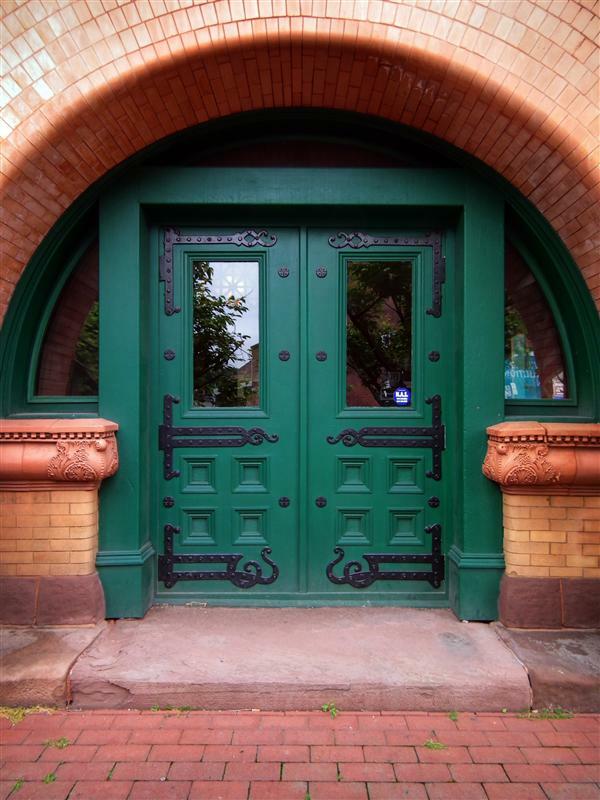 In order to lend an air of exclusivity, the community was gated, and included a large stone entrance-way, also designed by Price. 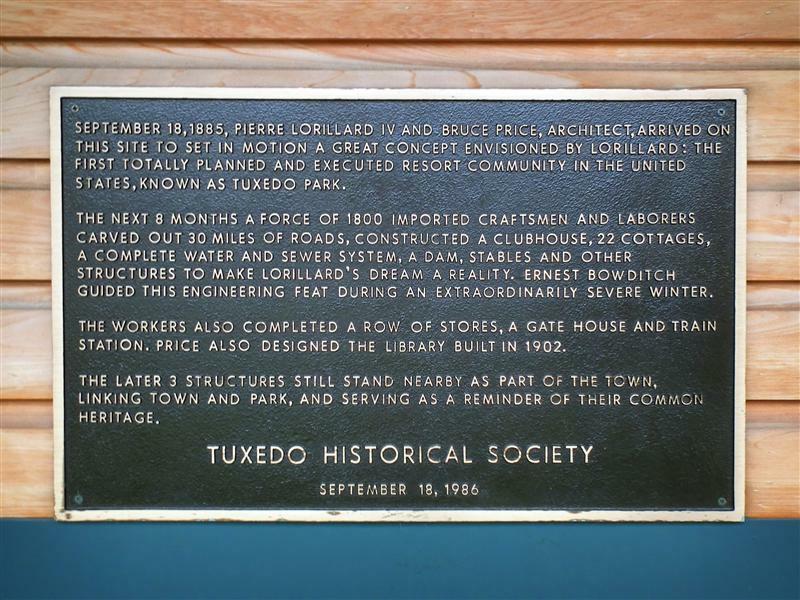 Although Tuxedo is certainly one of Price’s notable works, his most well-known achievement was the American Surety Building, one of Manhattan’s earliest skyscrapers. 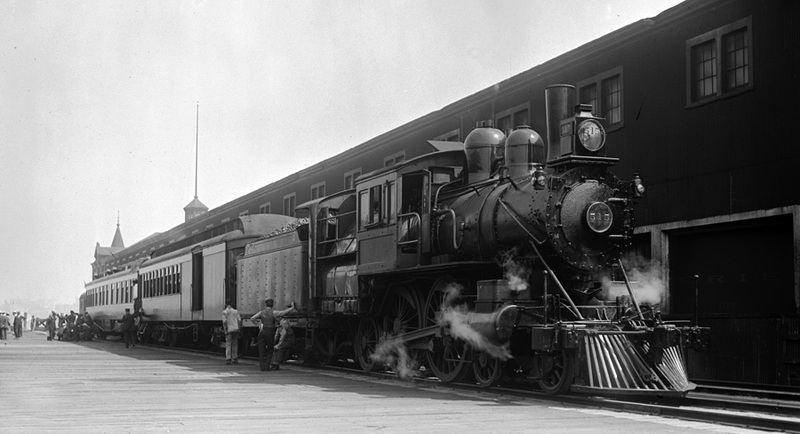 Price also did work for various railroads, including the Pennsylvania Railroad, the Boston and Albany Railroad, and the Canadian Pacific Railway. 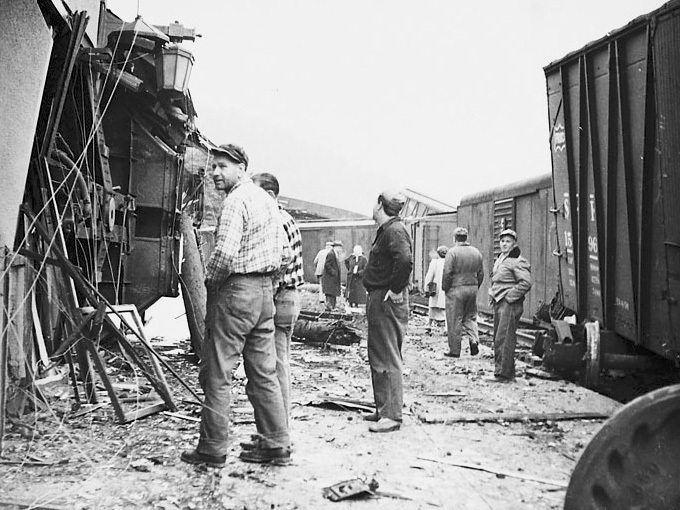 Photographs of a train crash at Tuxedo in 1951. 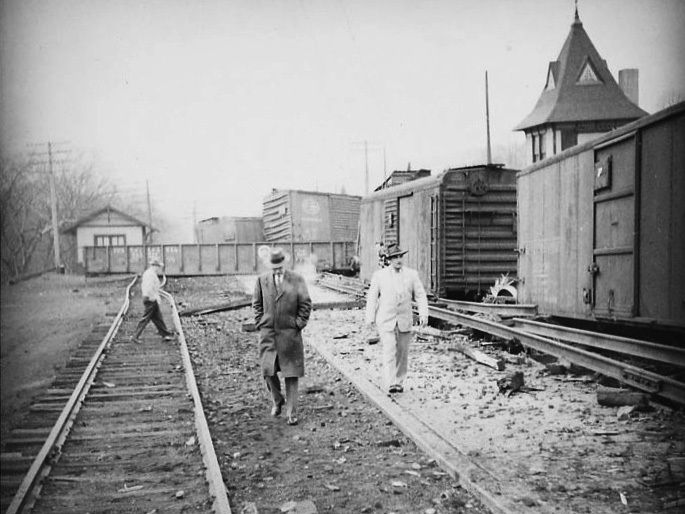 According to one Tuxedo Park resident, one of the freight cars was filled with oranges that spilled all over – many young children at the time collected these oranges and brought them home. 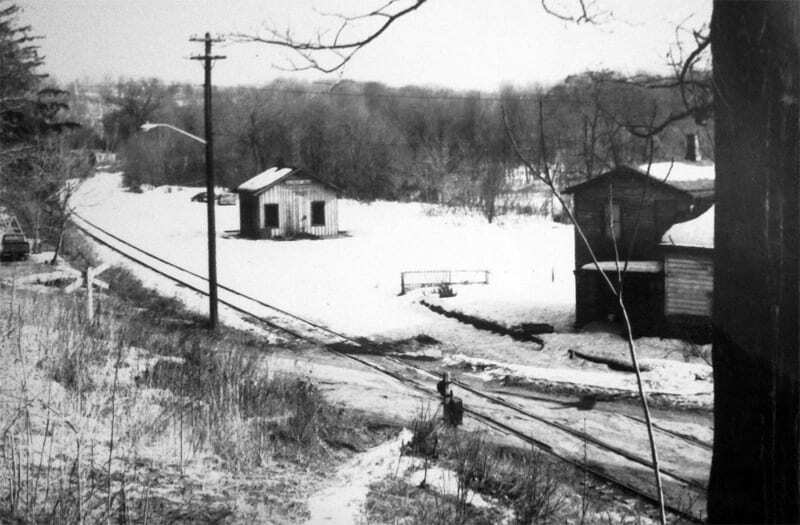 Photo from the collection of the Tuxedo Park Library. 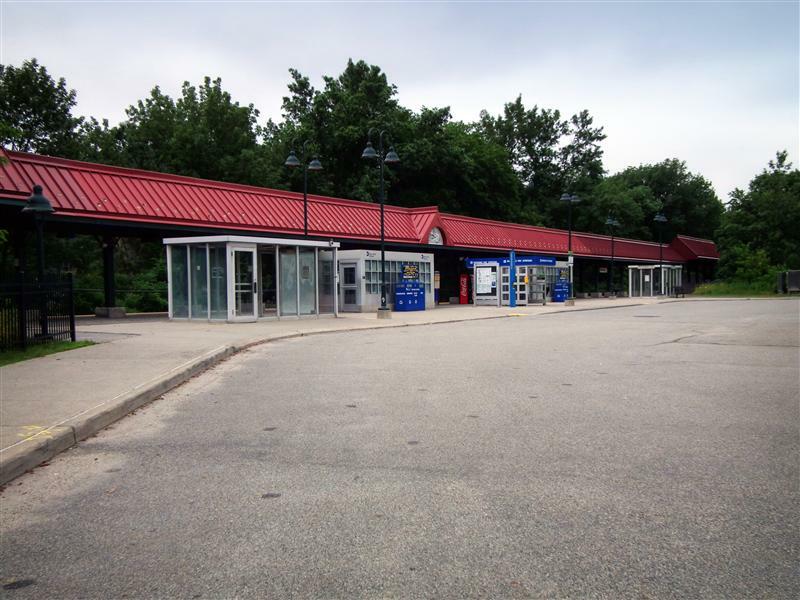 When I visited Tuxedo, I unfortunately didn’t get any pictures of the inside, as a fairly raucous party was going on (and getting rid of the tipsy party goers on the outside was a chore as well). 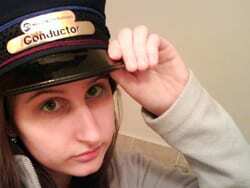 Although it made photo-taking difficult, in a way I have to think it is pretty wonderful. 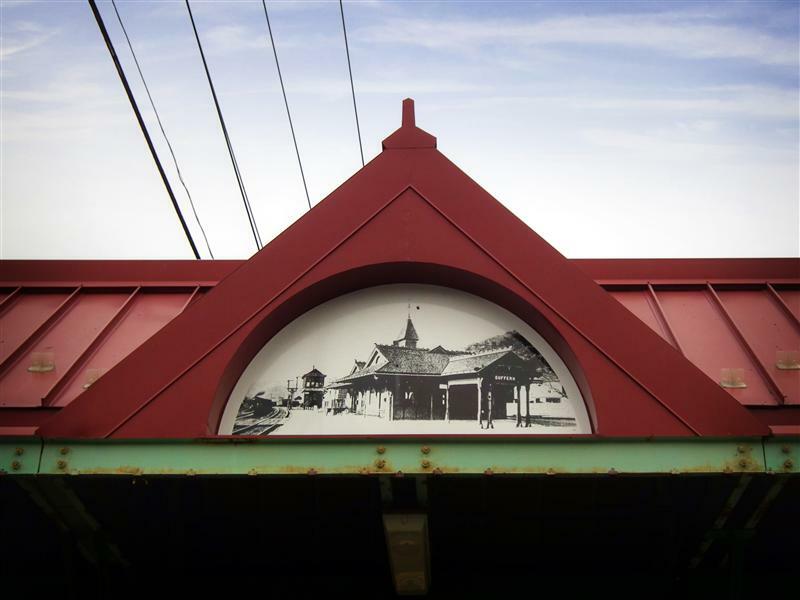 In 2009, at the cost of about a million dollars, the town restored the 1885 Tuxedo station. 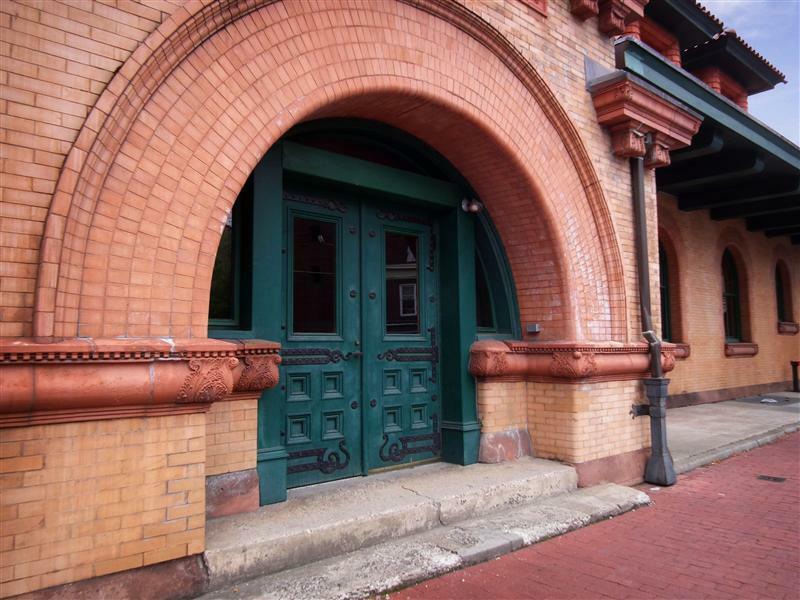 The building truly belongs to the community, as it is available for use by scout groups, or even to rent out for parties (and who wouldn’t want to get tipsy at Tuxedo?). 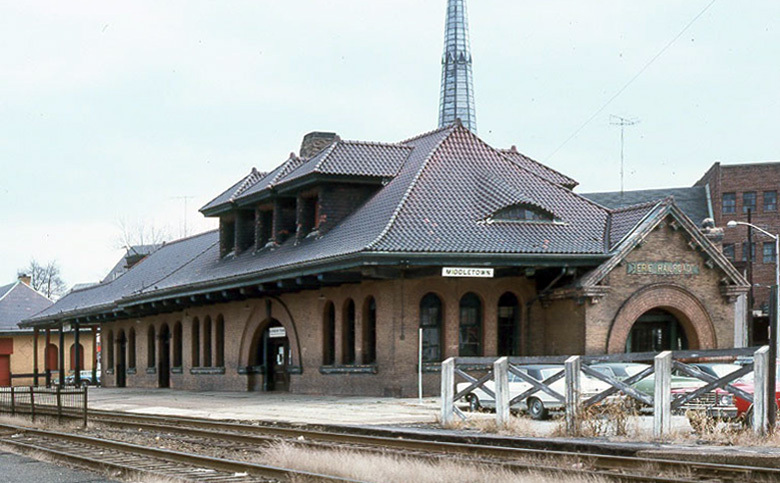 Over the years the station sported various color schemes – for a time it was even white with brown trim – but during the restoration the goal was to make the station look as it did when it was first built. 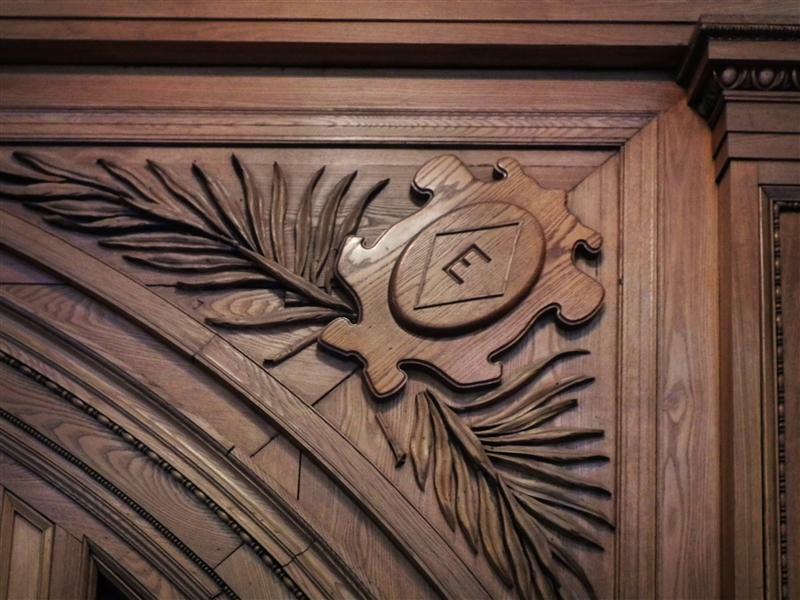 Some of the details, like the stained glass, are historians’ best guesses – either way, they look great. 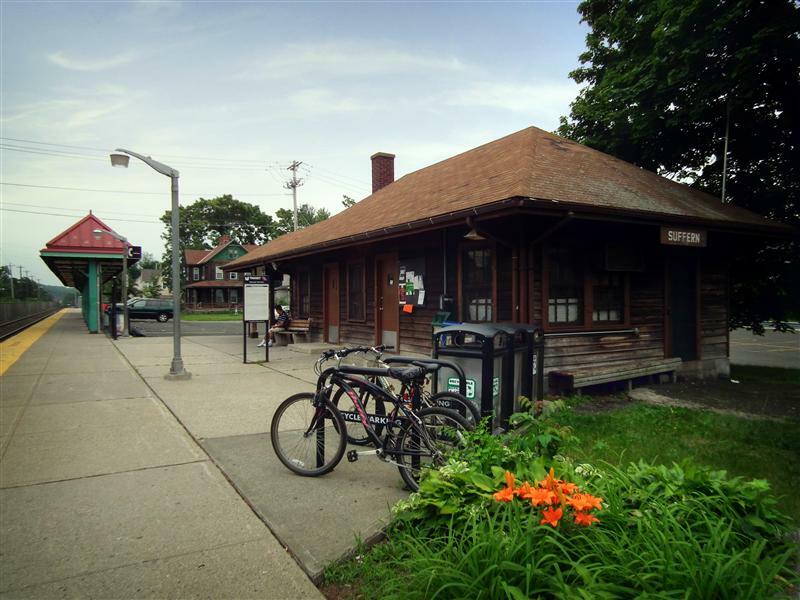 Not only is the station on the National Register of Historic Places, the village of Tuxedo Park is as well. Timetable and ticket for Tuxedo. 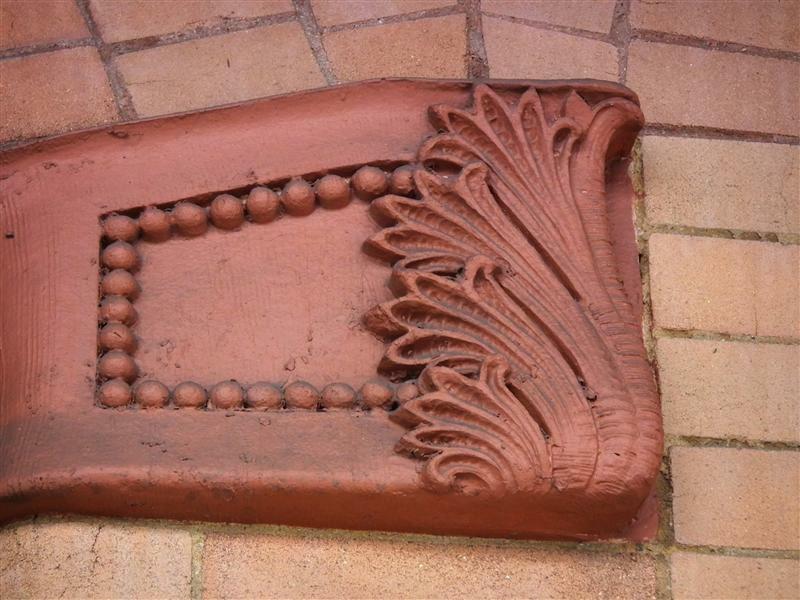 From the collection of Otto Vondrak. 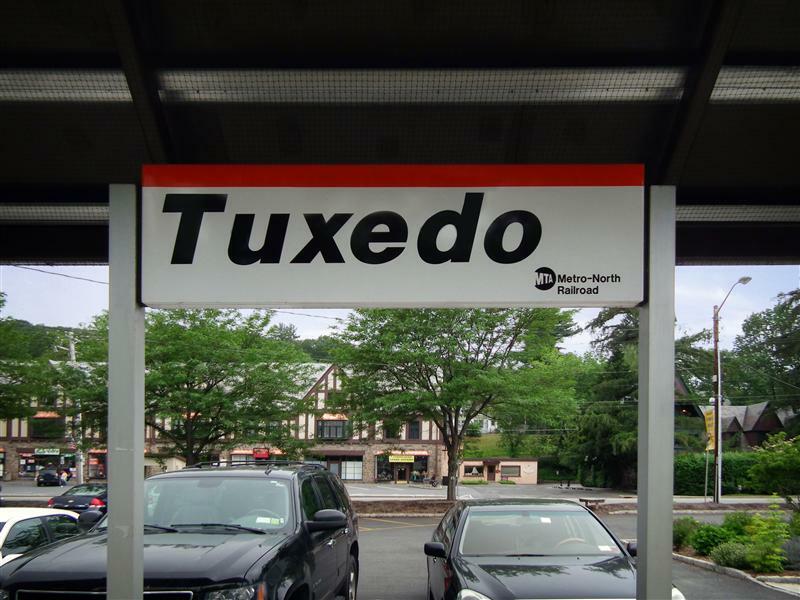 Tuxedo is 37 miles from Hoboken, which takes about an hour or more by train. 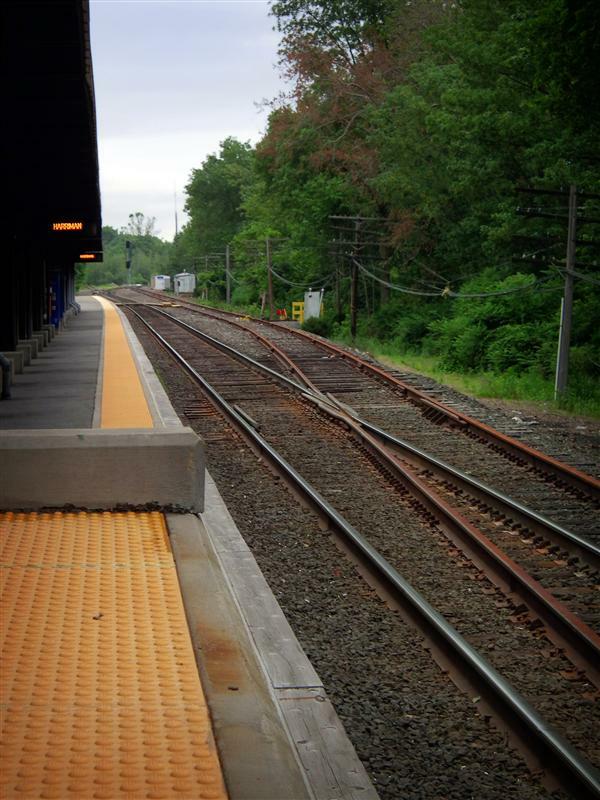 A commute to Penn Station (with a transfer at Secaucus) takes about an hour to an hour and a half. 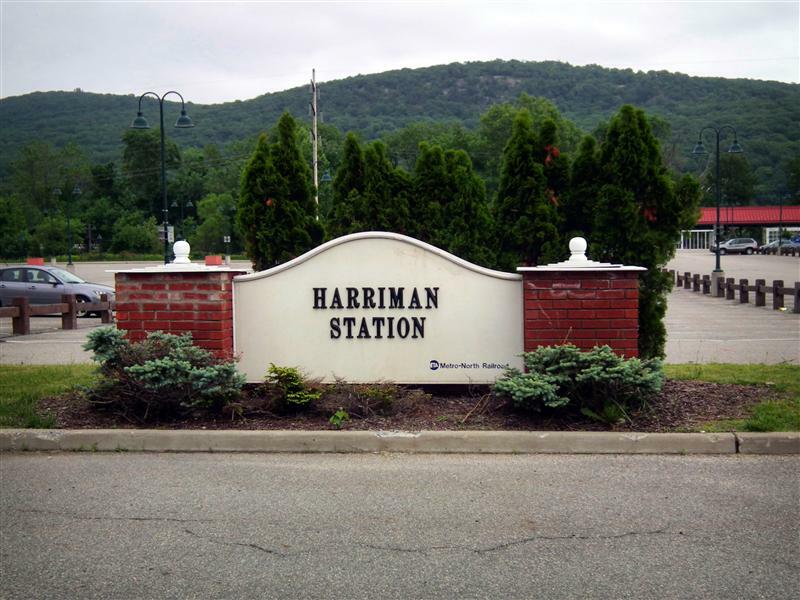 After Tuxedo we head further north, towards Harriman. 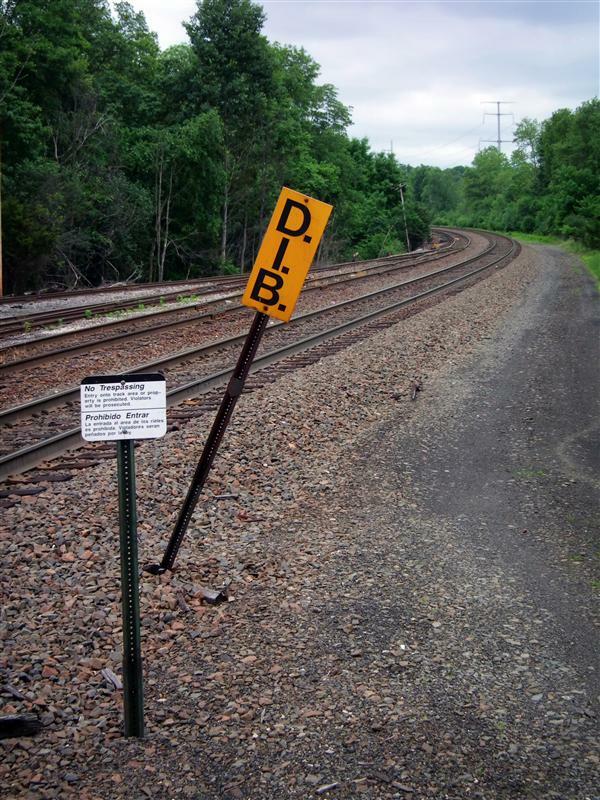 It is just ahead where the rail line diverged – branching off from the Erie main line was the Graham Line. 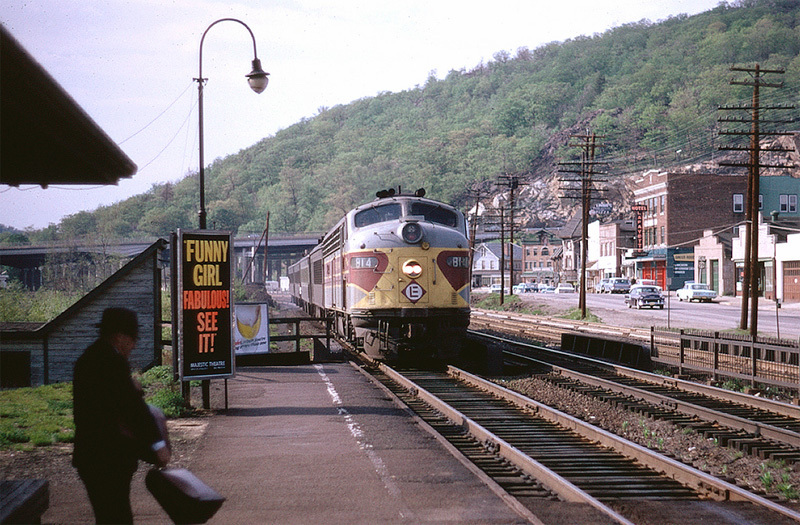 As mentioned before, that original route was abandoned in favor of the Graham Line. 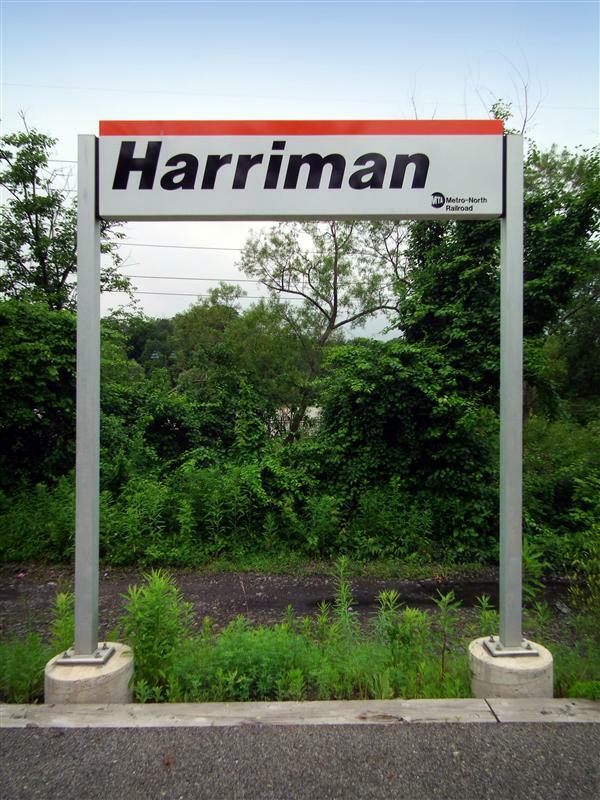 Harriman had a station on the main line, but after that abandonment Metro-North built a new station on the other – it is there we will visit next week. 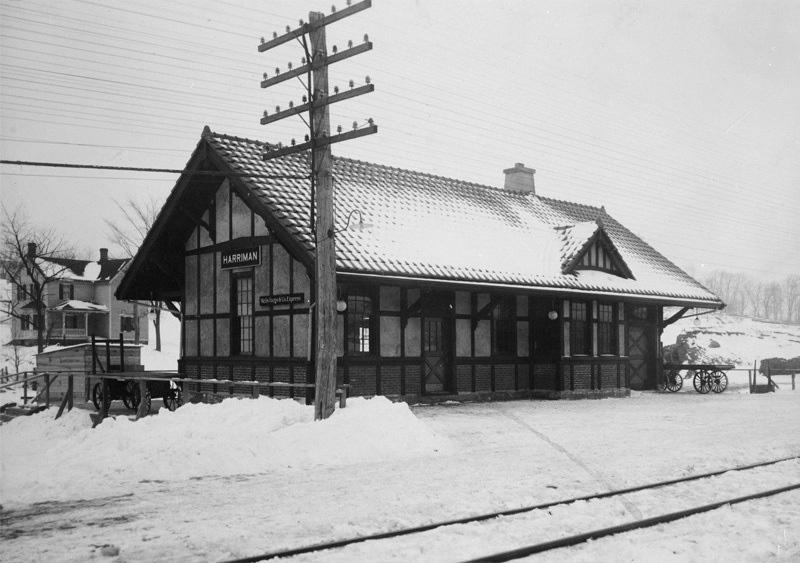 Original Erie station at Sloatsburg, which no longer exists. 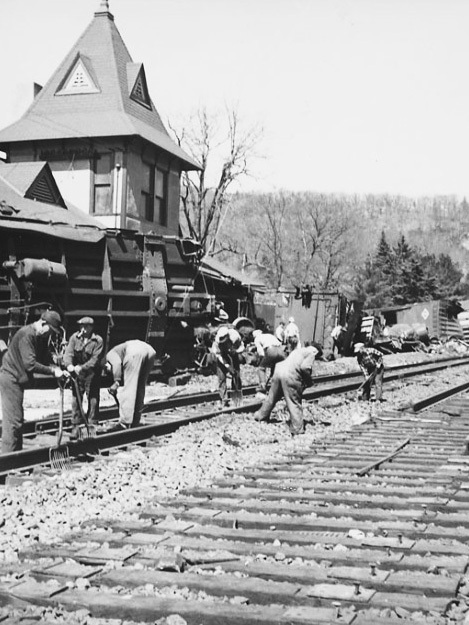 Photograph from the Sloatsburg Historical Society. 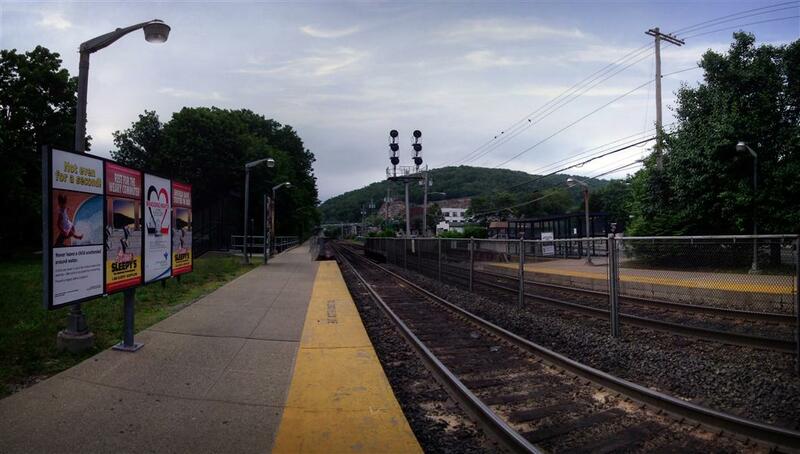 As we head further along the Port Jervis Line, the next station we come to after Suffern is Sloatsburg. 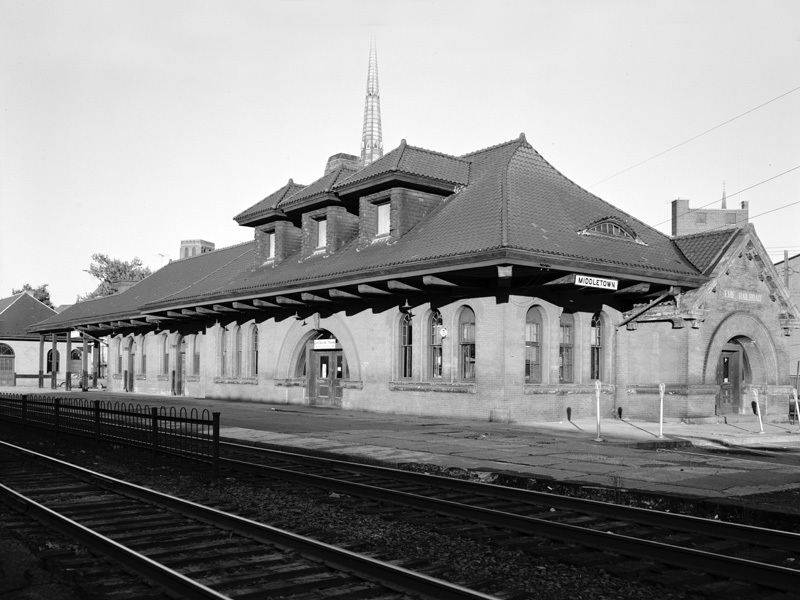 The station is about 35 miles from Hoboken, and is relatively bare-bones. 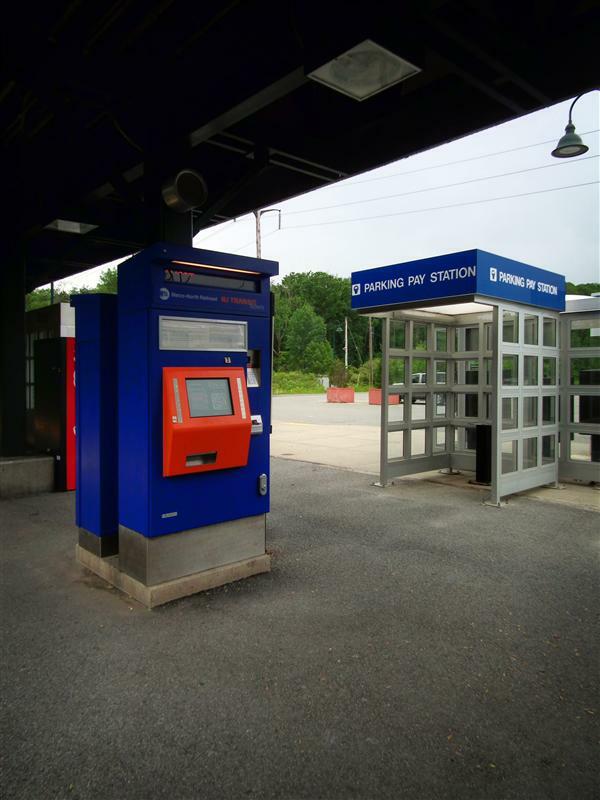 We could certainly compare it to some other stations on the east of the Hudson, like Ansonia, but it does have one difference – you will find a ticket vending machine here. 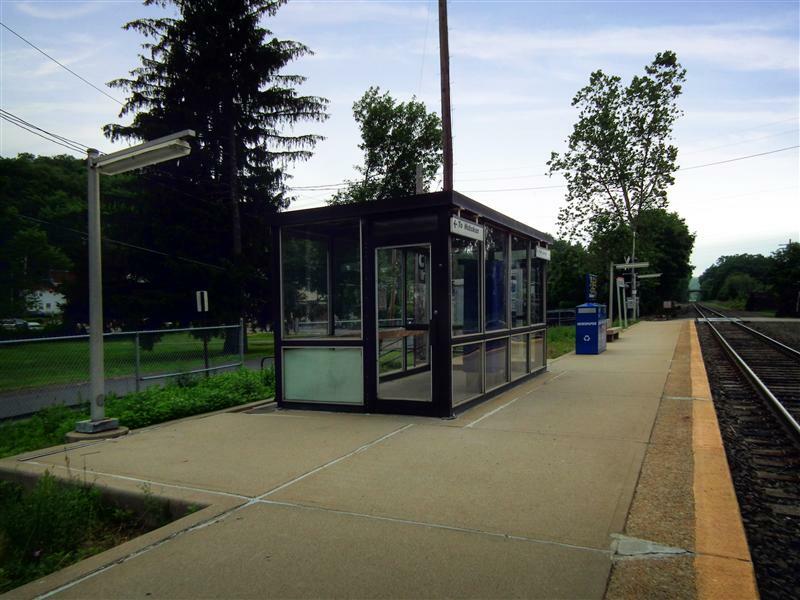 The low-level platform and the very small shelter are actually quite similar, however. 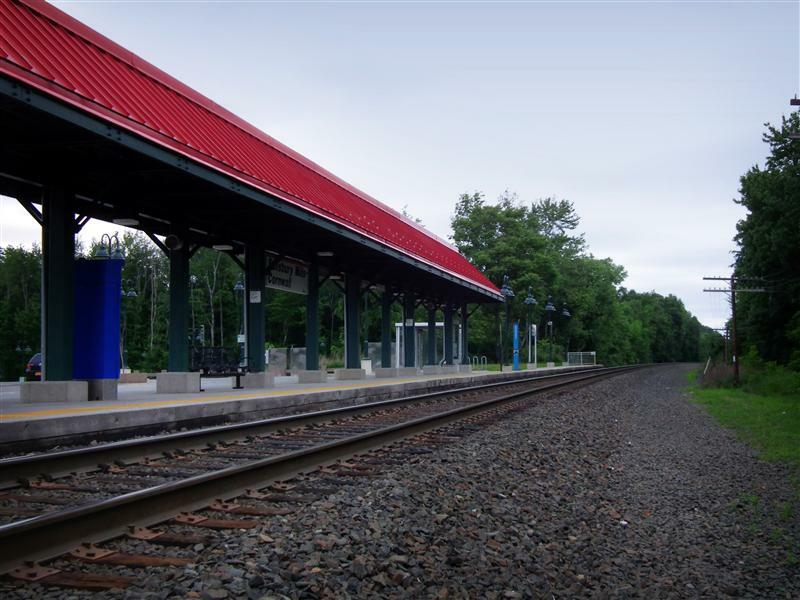 Although there had been talk about upgrading the infrastructure at the station years ago, including making it handicap-accessible, not much has been done. 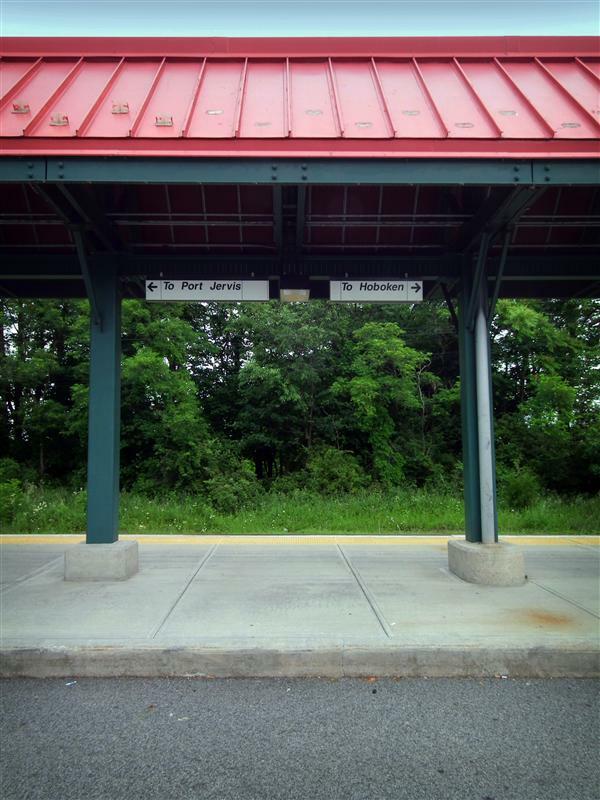 It is one of the least-used stations on the line (only Otisville gets fewer riders), which likely plays a part in that decision. 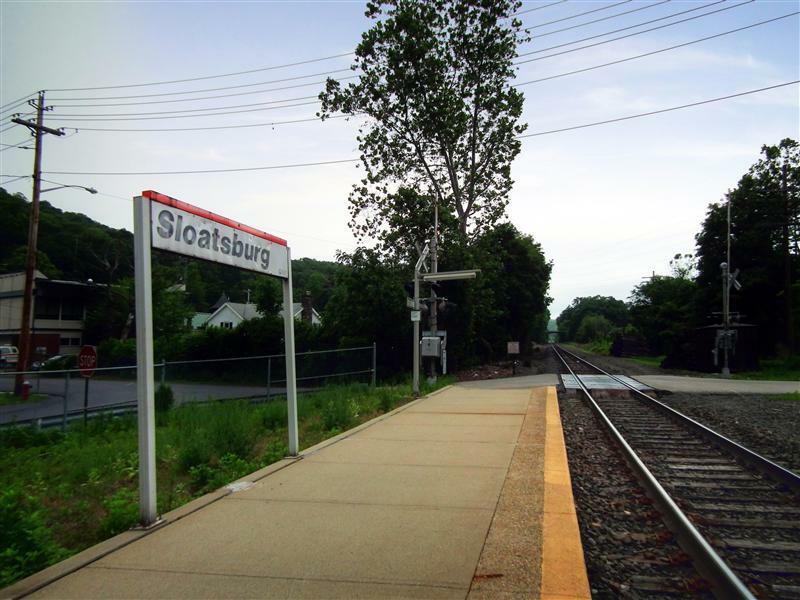 Postcard view of Sloatsburg station. 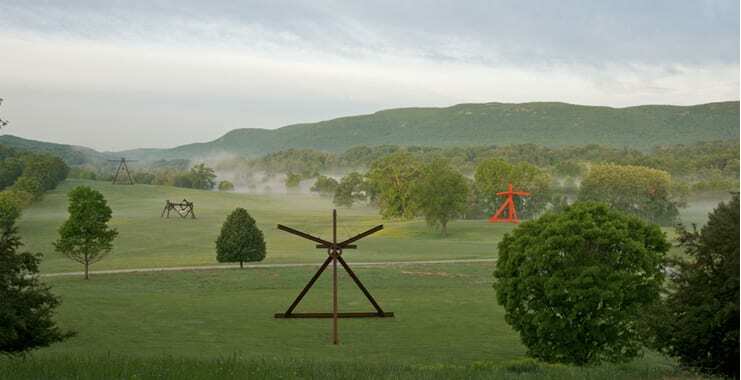 From the collection of Steve Swirsky. 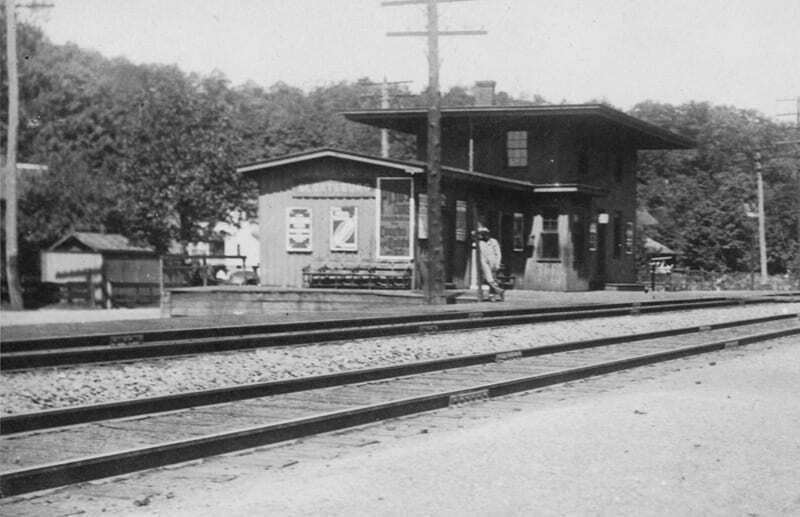 Though there isn’t much here now, Sloatsburg did have a station building in the past. 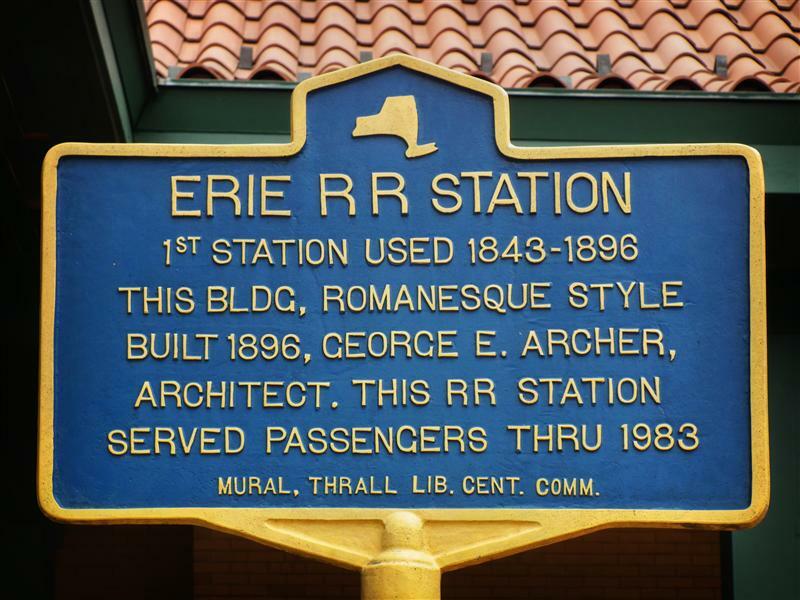 The two-story brick station was built in the mid 1800’s for the Erie Railroad. 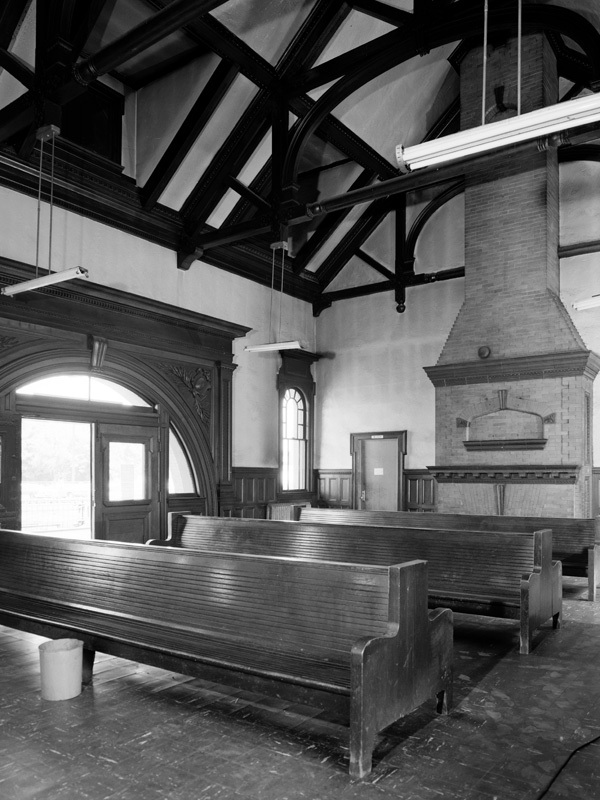 Sometime after the 1940’s, however, the building was torn down – leaving the spot relatively bare. 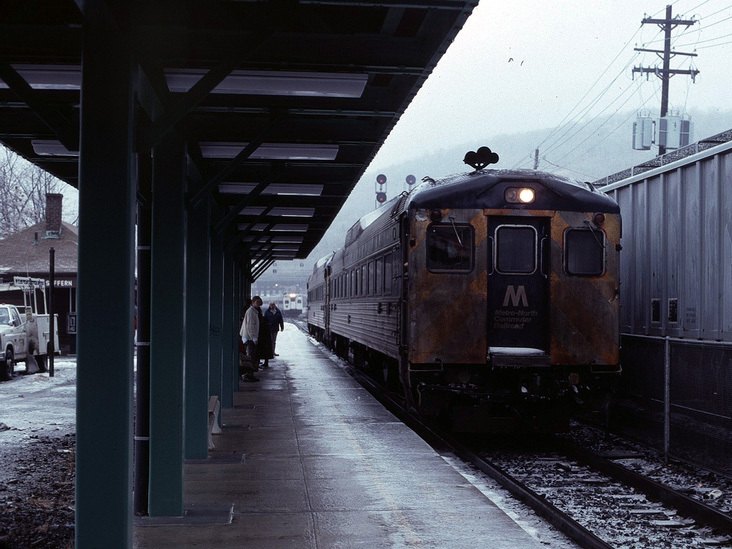 EL train at Sloatsburg in 1968. 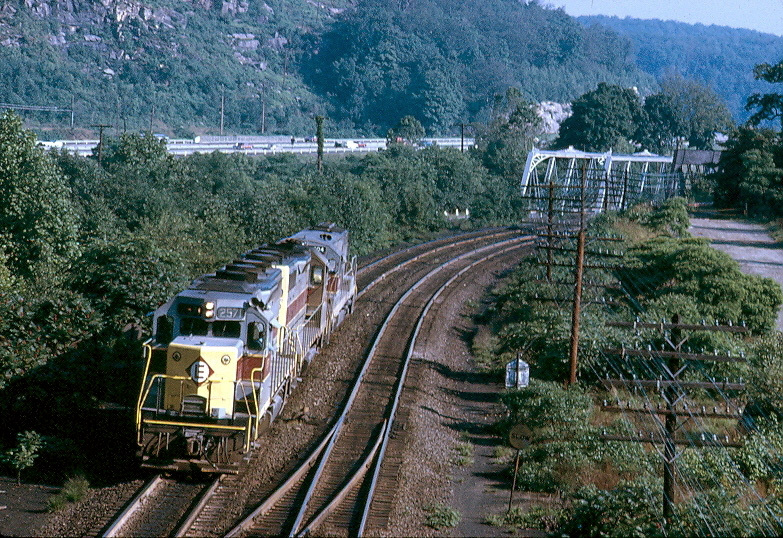 Train near Sloatsburg in 1983. 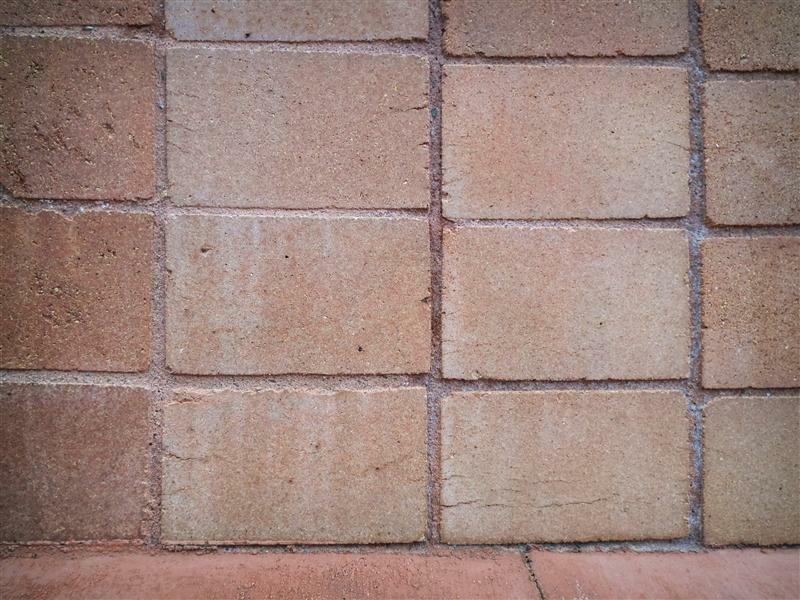 Normally I don’t include current-day photographs taken by others on the site, but I did make an exception for the one above. I think it really illustrates the small station of Sloatsburg – as it is dwarfed by the oncoming train. 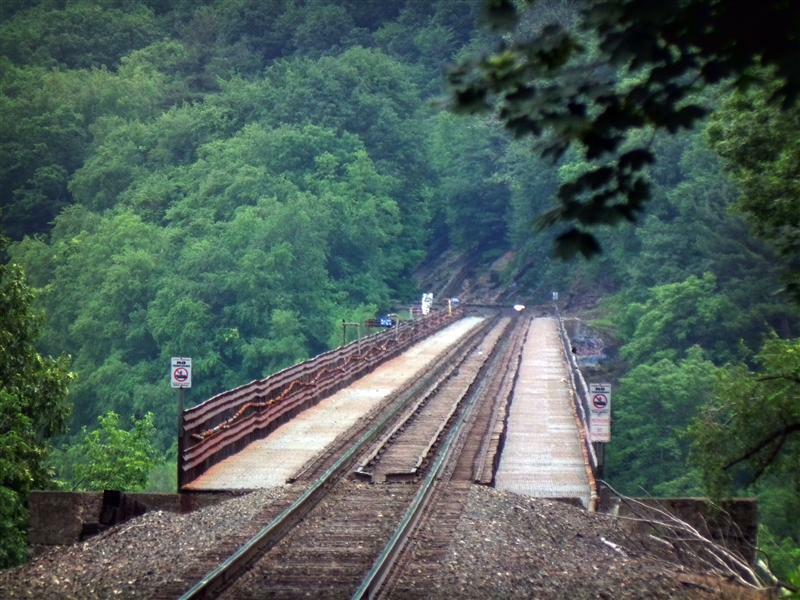 Below you will find all of the photographs I took while visiting Sloatsburg. 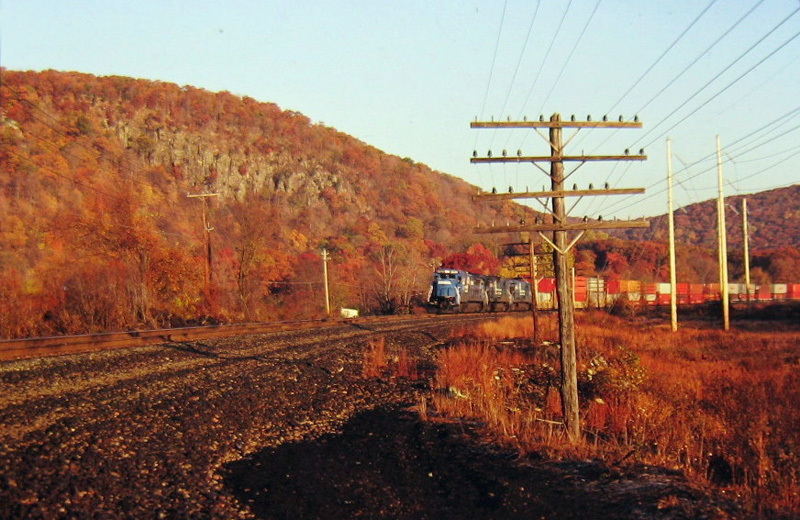 If I had the means to, I would love to go back and rephotograph the entire Port Jervis Line on a day that wasn’t so crappy looking. 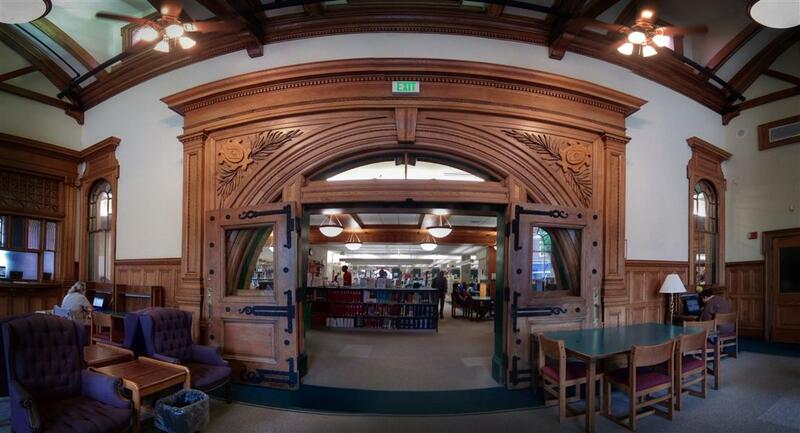 Alas, you will find many of the photos from here and the other stations rather dreary. 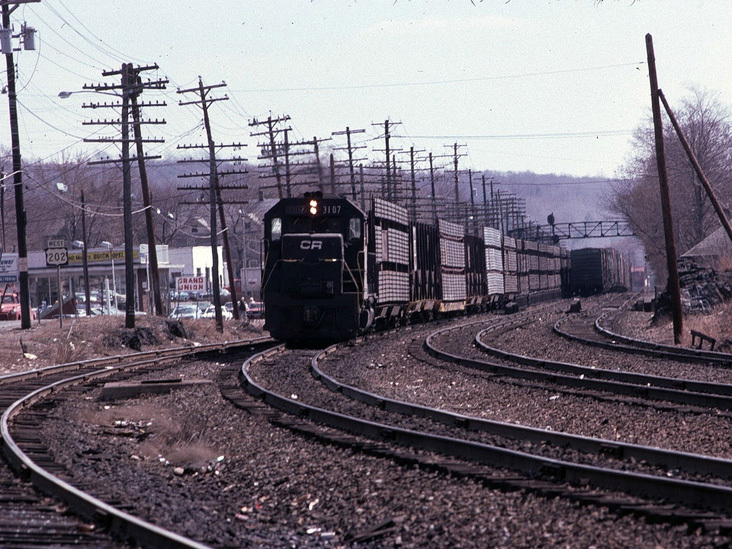 Erie-Lackawanna train at Suffern in 1966. 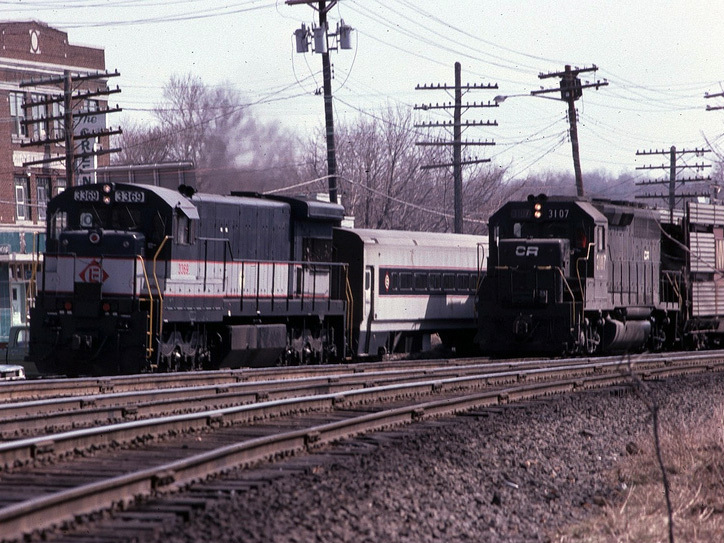 Photo by Carl R. Baldwin. 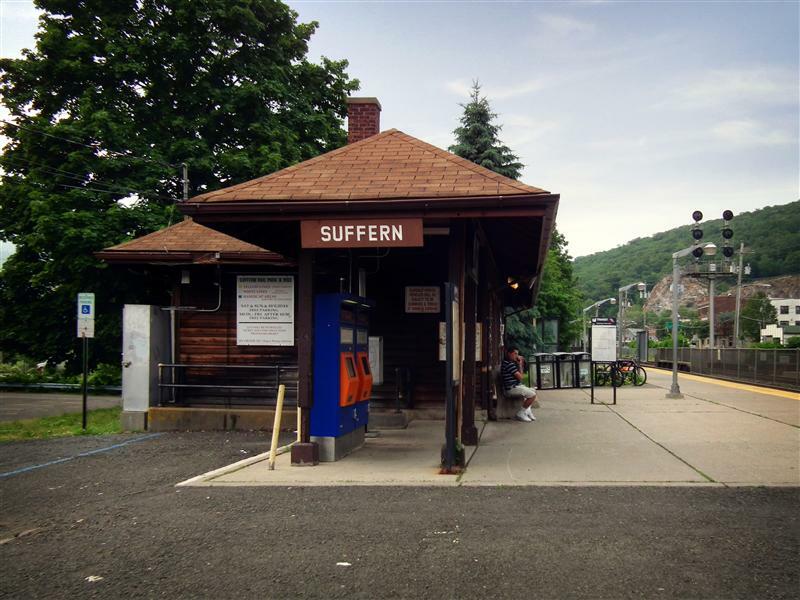 Welcome to Suffern, our first stop on our tour of the Port Jervis Line. As you are no doubt aware, the Port Jervis line is on the west side of the Hudson, its trains do not enter Grand Central, and the service is operated by New Jersey Transit. 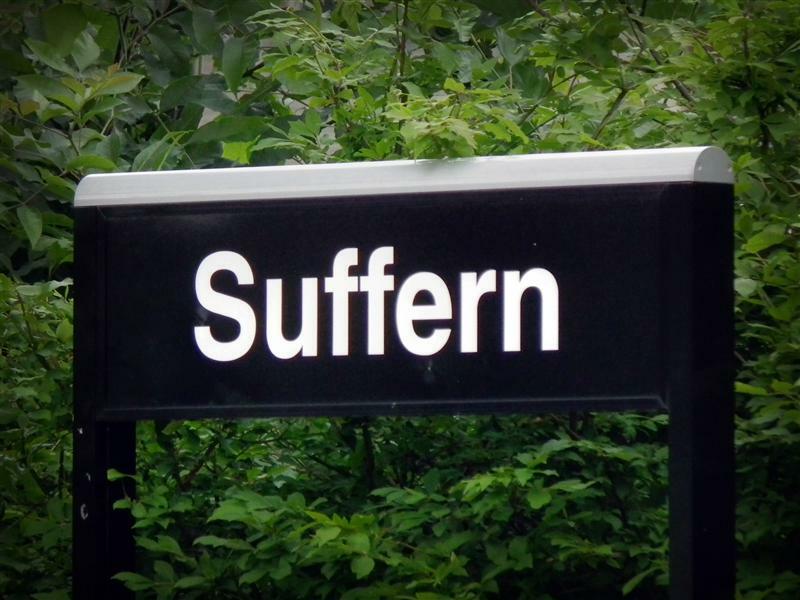 Suffern is a little bit of an island unto itself, however. 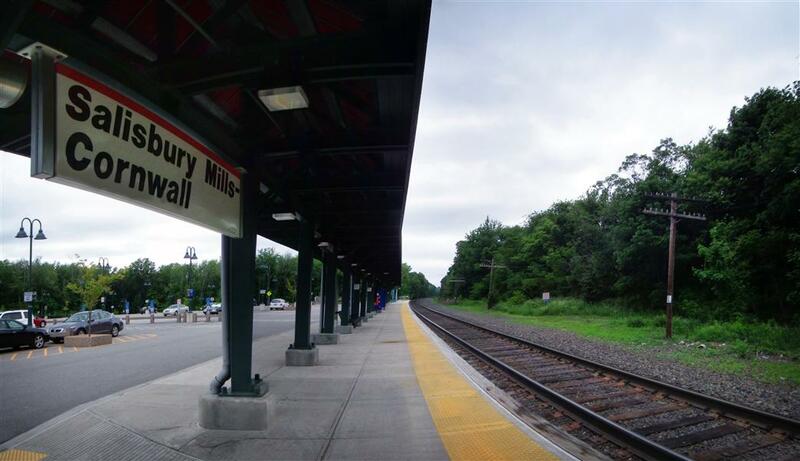 Although it is located in New York state, Suffern is for the most part a New Jersey Transit station, and is operated by NJT. 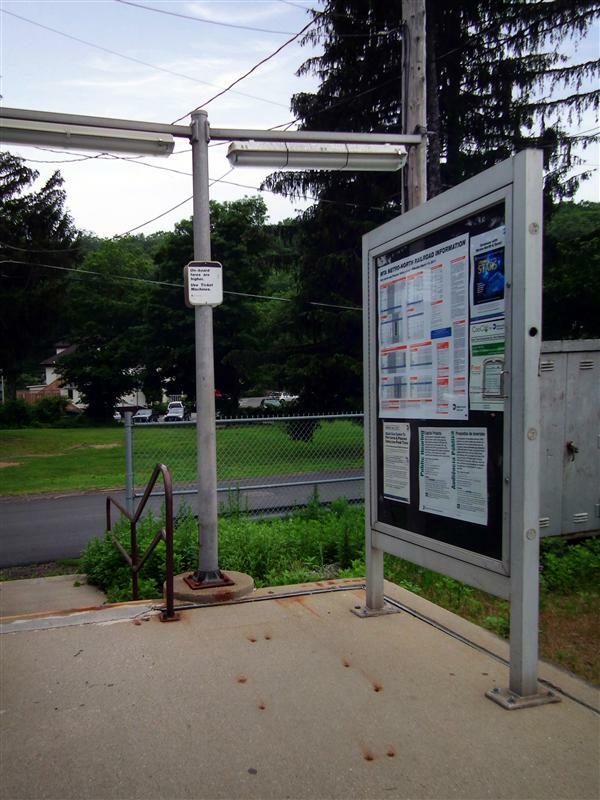 Unlike the rest of the Port Jervis Line stations, which are owned by Metro-North, the typical station signage which we are all familiar with is not present here. 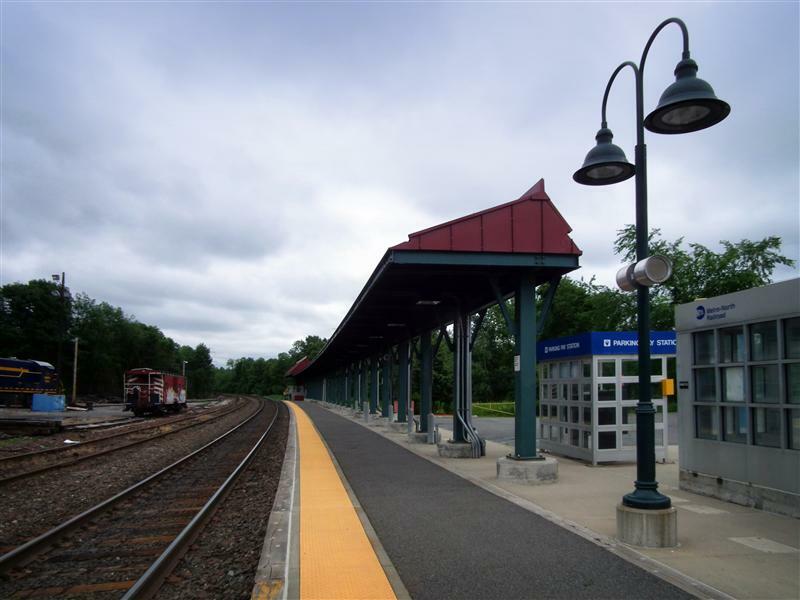 Although Metro-North keeps some ridership statistics regarding Suffern, it is generally not grouped with the rest of the Port Jervis Line stations for record keeping. 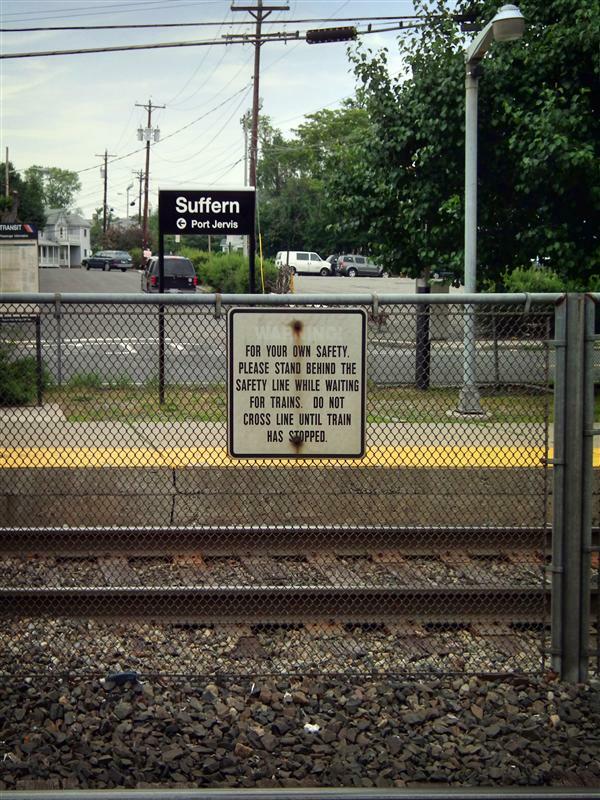 But to keep everyone confused, Suffern does appear on Metro-North timetables, and Metro-North’s website does have a station page for Suffern. 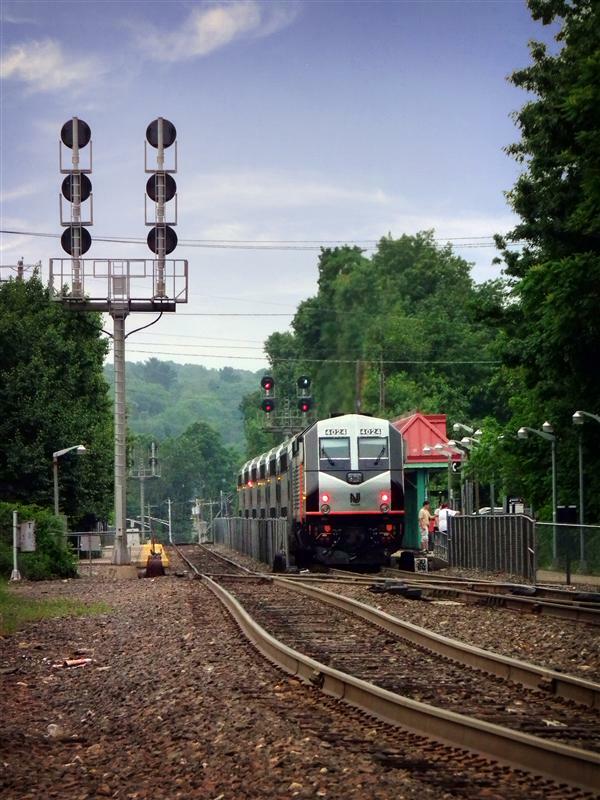 As we tour the Port Jervis line, you will notice relatively quickly some of the major differences between service on the east and the west of the Hudson. 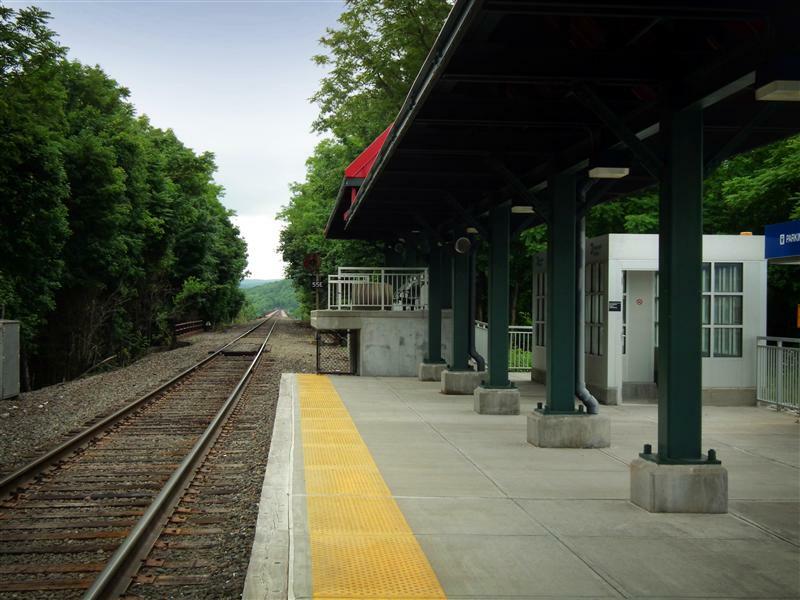 While almost all east of Hudson stations are high-level platforms, all of the stations on the west are low-level. 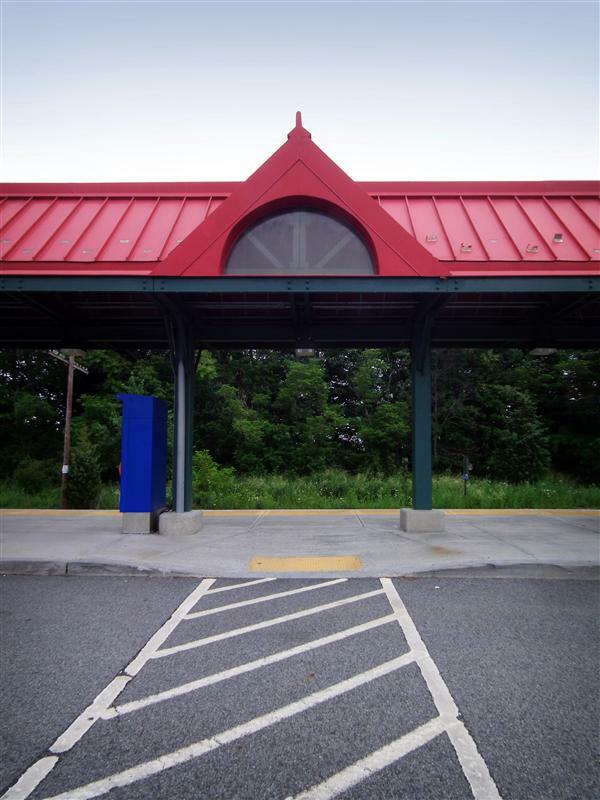 This arrangement makes things difficult for people in wheelchairs – so all handicapped-accessible stations have a small high-level portion of the platform to facilitate boarding. 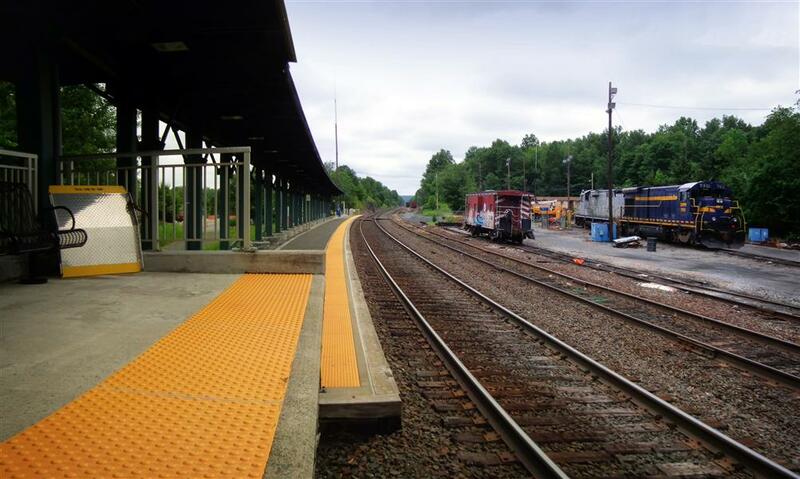 At first seeing these little platforms is strange, but when a train arrives it makes a bit more sense. 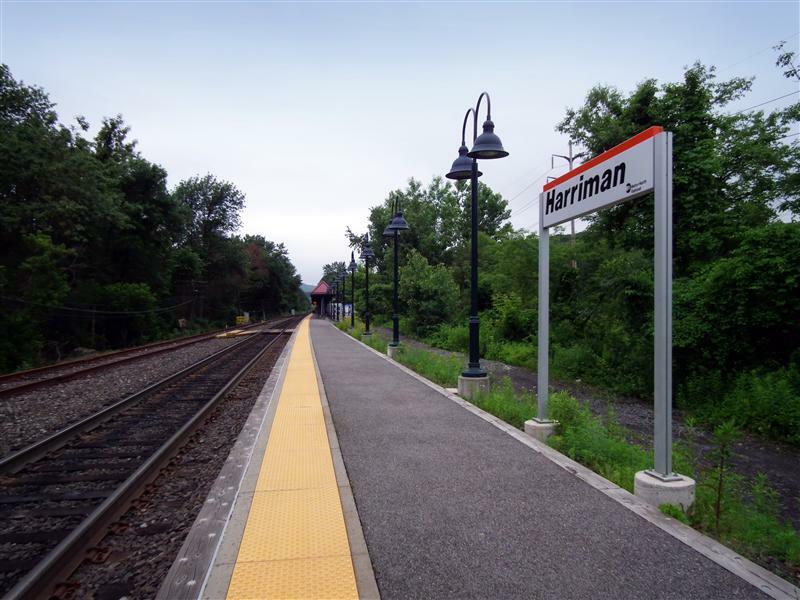 However, you will not see one of these mini platforms at Suffern – the closest handicap-accessible stations are Harriman to the north, or Ramsey Route 17 (in New Jersey) to the south (or, as Metro-North suggests, Nanuet – though it is on the Pascack Valley Line, and not the Port Jervis). 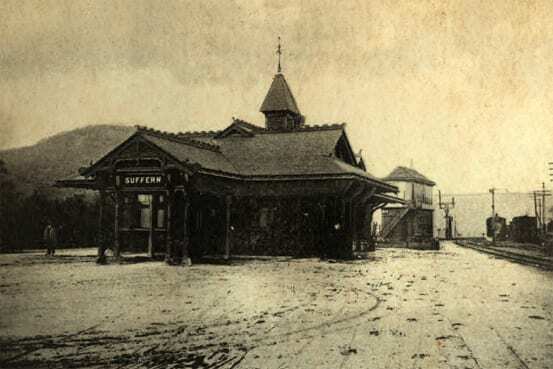 Although Suffern does have a small station building, it is a replacement that was built in 1941 – and not the original Victorian structure that dated to 1887. 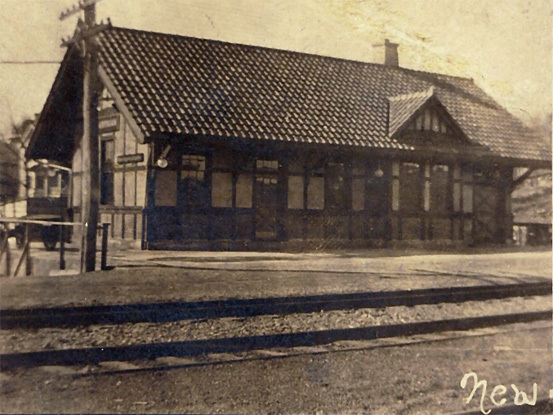 The current placement of the station is also not where it originally was – the platforms and the replacement station were erected slightly more south than before. 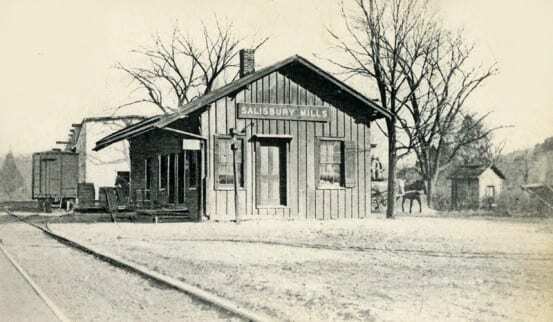 A small structure, built in 1908 and used as a Wells Fargo mail depot, sits not far from where the original station was. The building was opened as a small railroad museum in 1998. 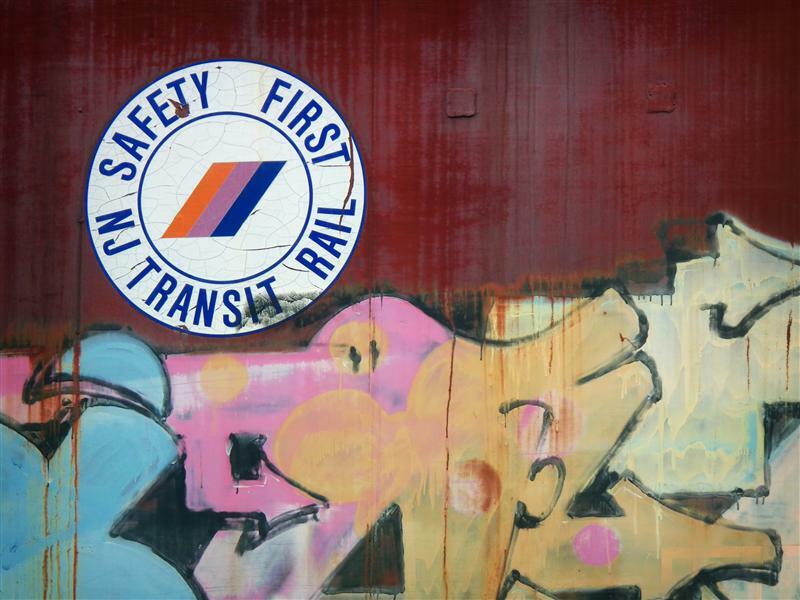 Located just past the museum is a train yard that New Jersey Transit maintains. 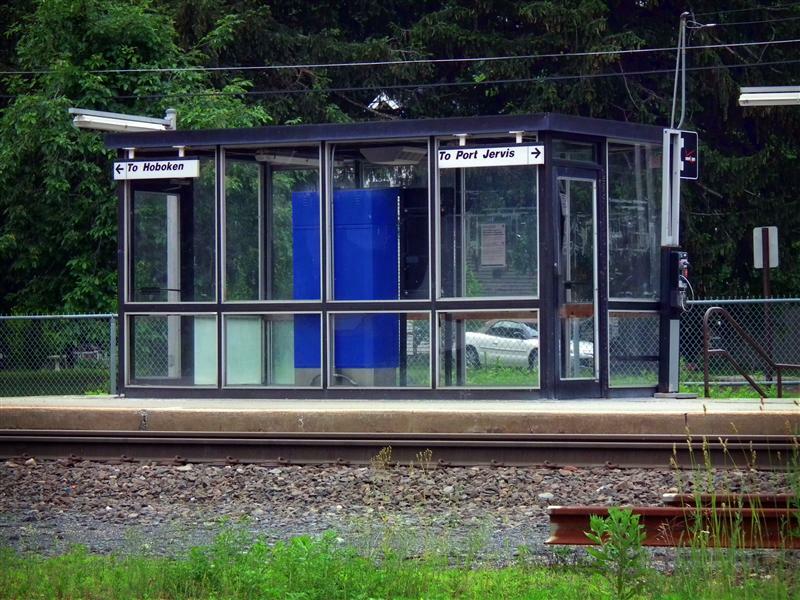 Unlike Metro-North’s other Port Jervis Line stations, Suffern has two tracks. 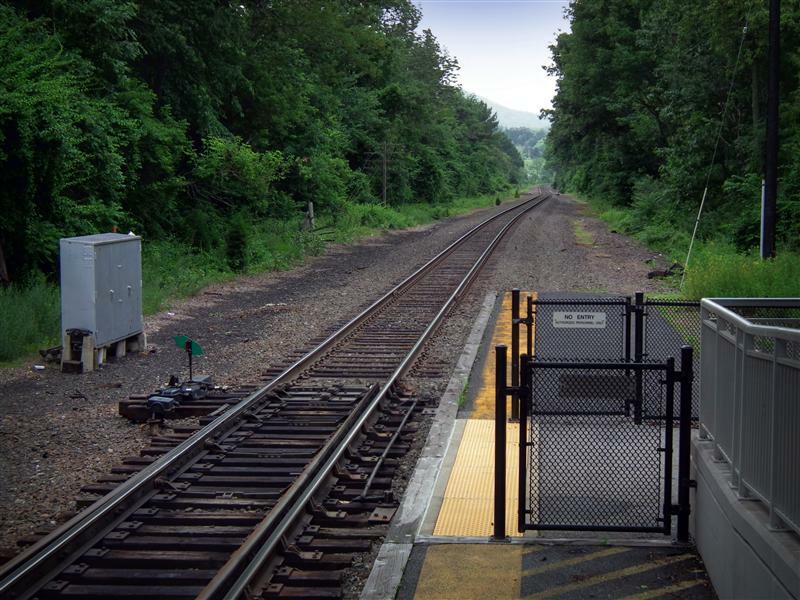 Because the platforms are low-level there is a fence in-between the tracks to deter people from crossing over to the other side that way. 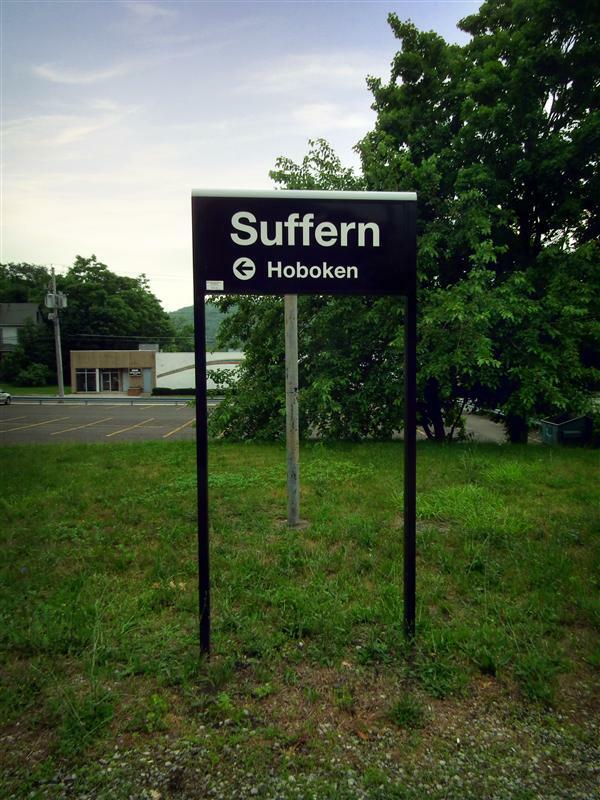 The usual destinations for commuters from Suffern are Secaucus and Hoboken. 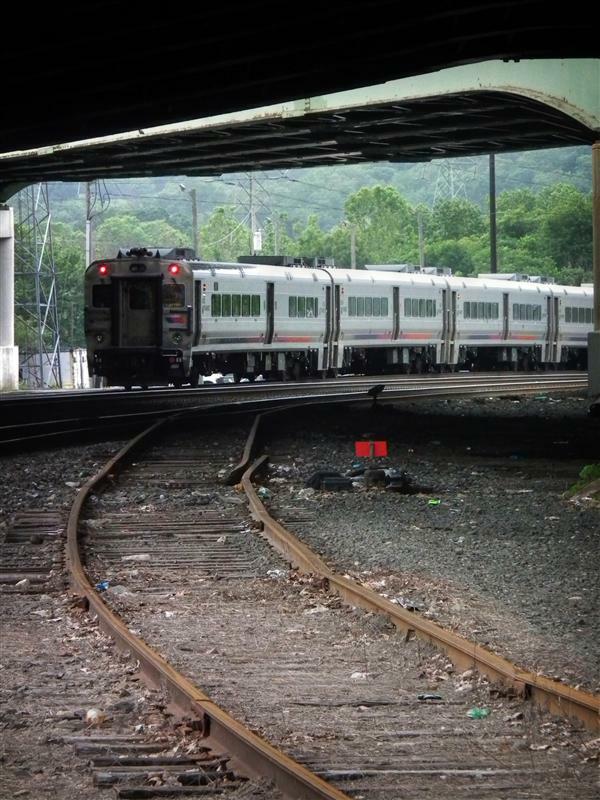 A trip to Hoboken ranges from 45 to 70+ minutes, and a trip to Secaucus 35 to 50+ minutes. 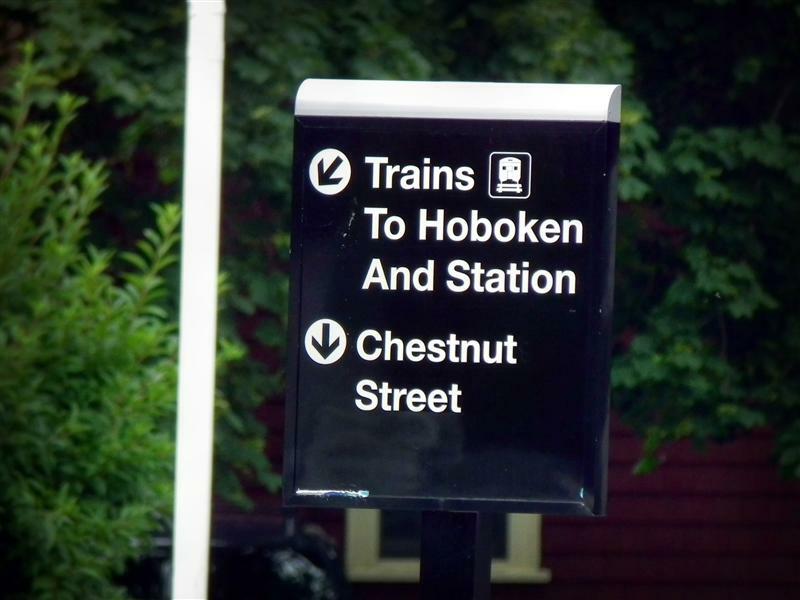 Riders can transfer at Secacus to get to Penn Station, or at Hoboken to get to the World Trade Center. 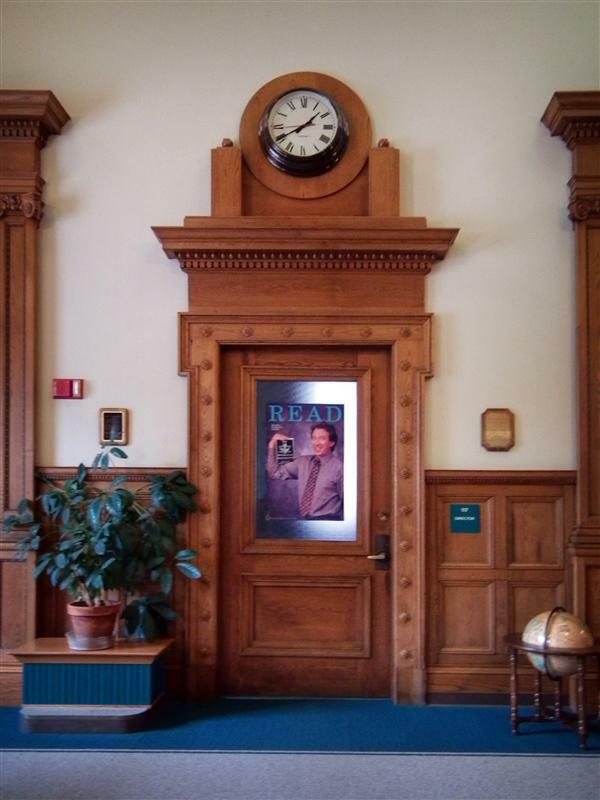 Last December I posted some photos from Briarcliff Manor, a station that was along the now-defunct Putnam Division, and how it has since been converted into a library. 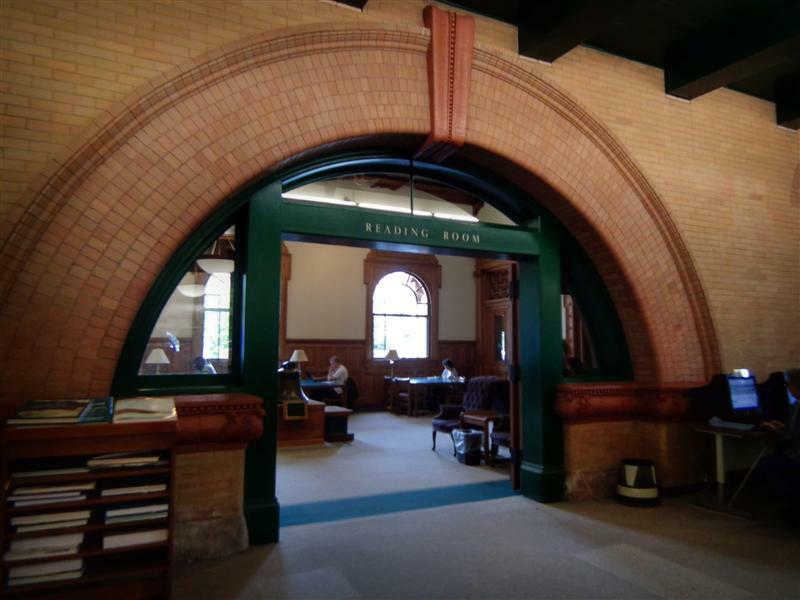 I’ve always thought it seems appropriate for an old train station to live a second life as a home to history and literature in the form of a library. 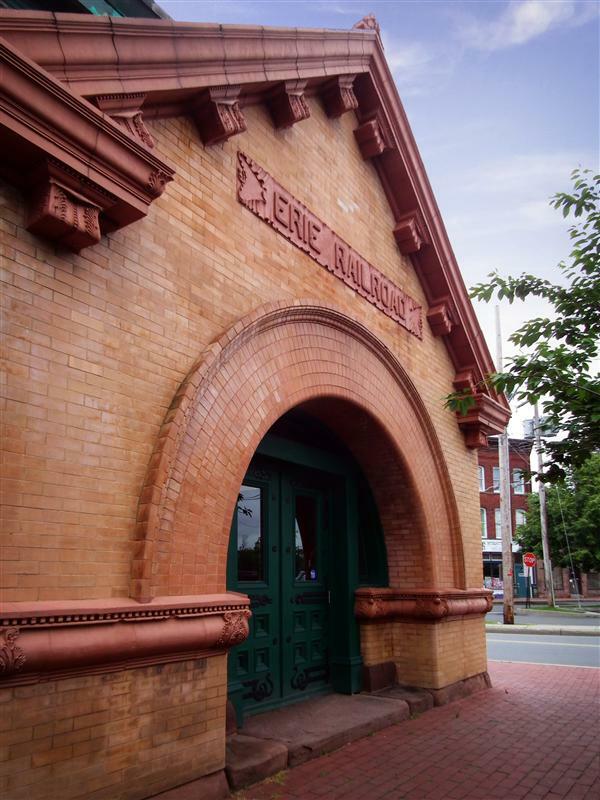 There are several such places in New York state alone, but one of my favorites is in Middletown, NY. 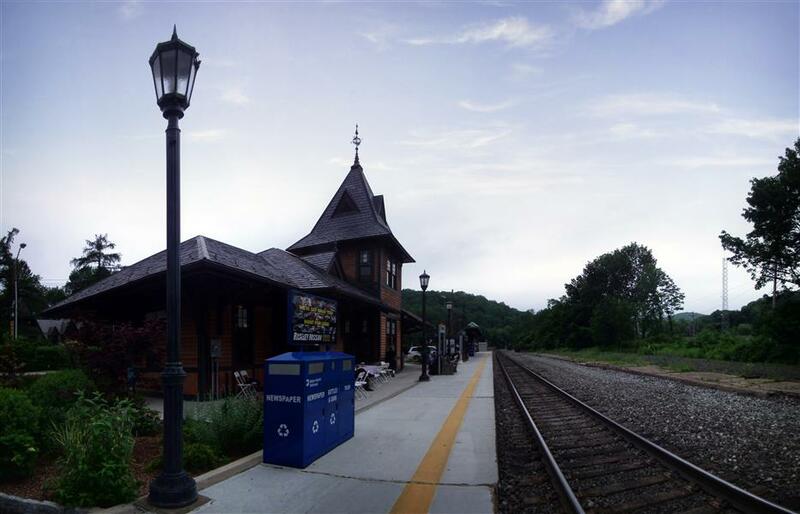 Since we’ve now turned our attention to Metro-North’s west-of-Hudson service and will spend the next few Tuesdays visiting the stations of the Port Jervis line, I thought it would be appropriate to also check out some of the former stations. 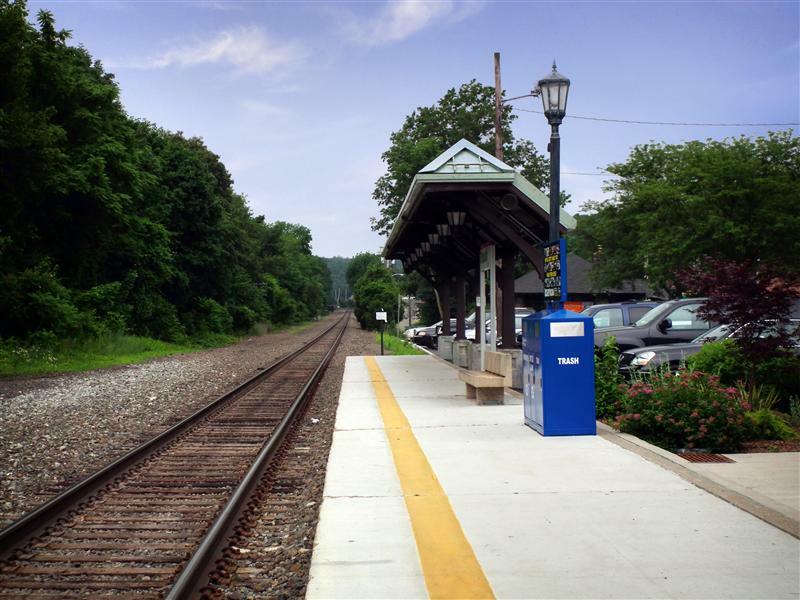 Middletown is likely one of the most beautiful of the extant stations to fall under that category. 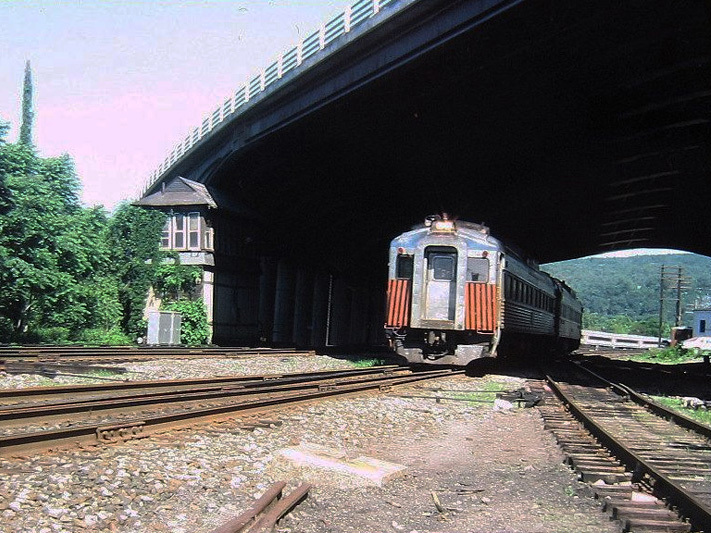 As I mentioned earlier this week, the current Port Jervis line follows a slightly different route than the original passenger line operated by the Erie railroad. 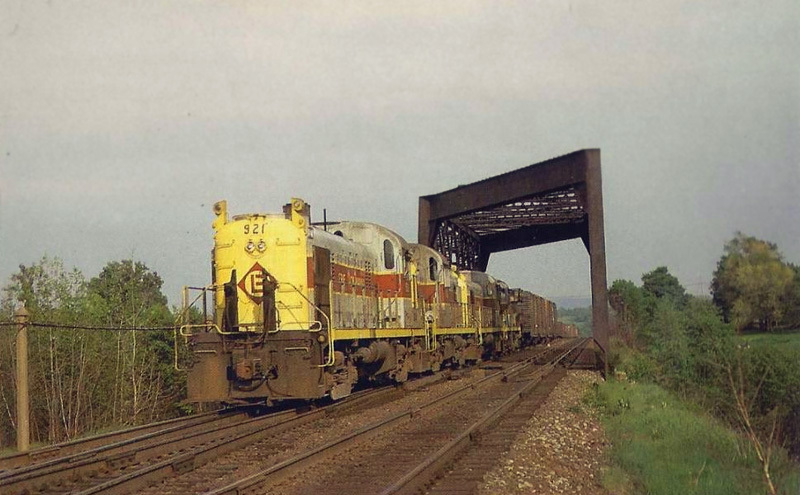 A portion of the Erie main line was abandoned, and trains were rerouted along the freight Graham Line in the 80’s. 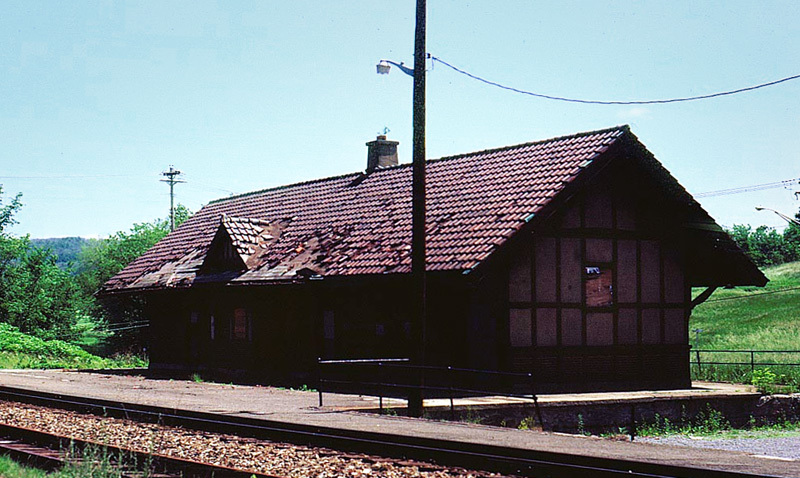 The tracks that ran through the center of Middletown, and past this Erie depot, were part of the section that was abandoned. 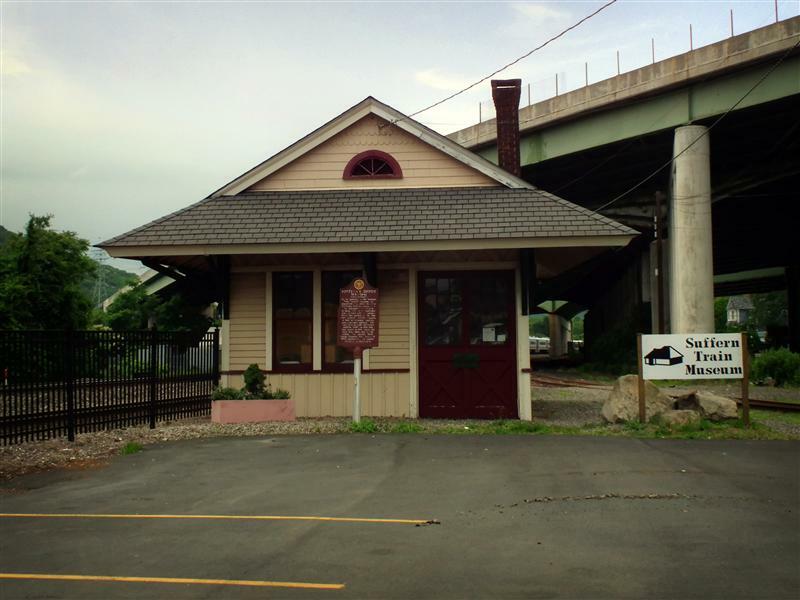 When the old tracks were removed, Middletown’s historic Erie depot became just an old building surrounded by asphalt and automobiles. 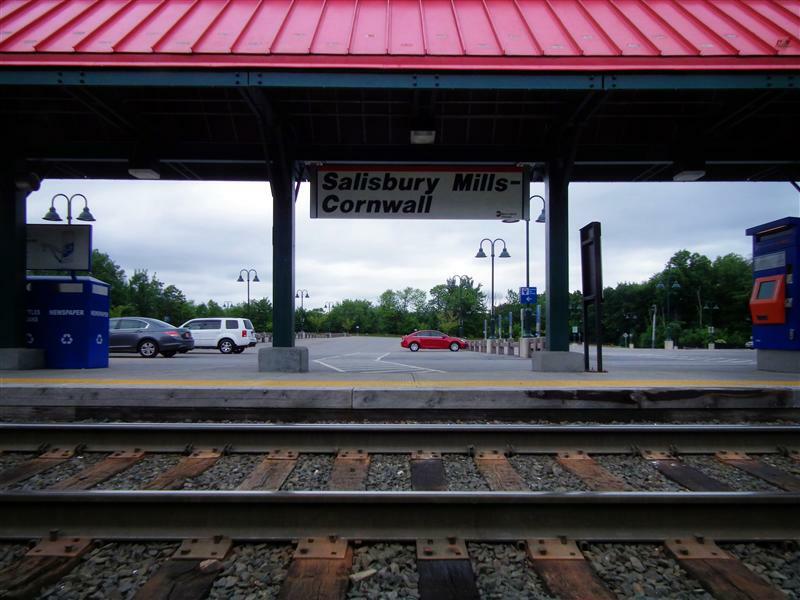 Its life as a venue for rail travel had come to an end. 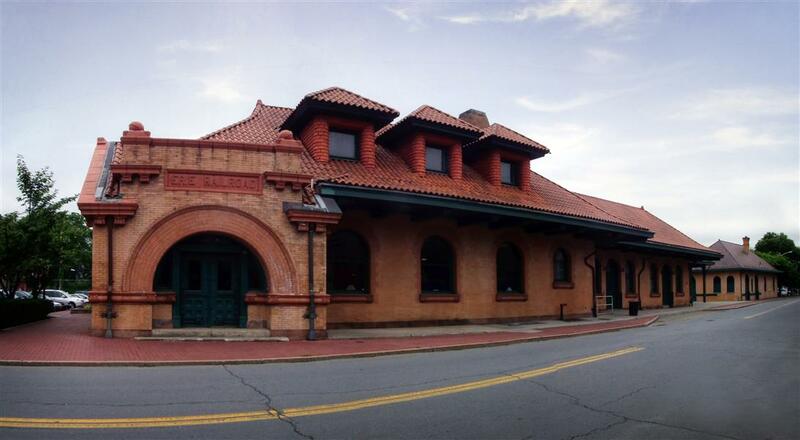 Built in 1896, the beautiful Romanesque-style Erie depot was designed by architect George Archer. 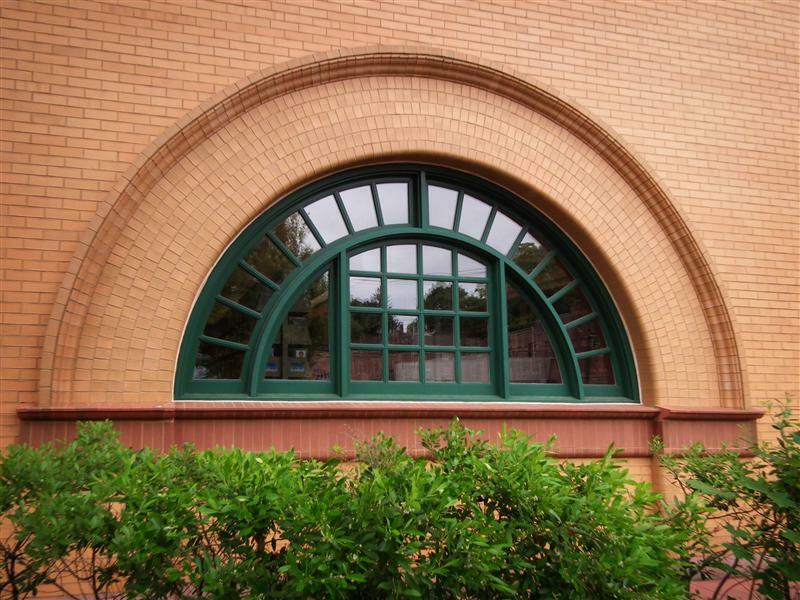 Archer was a native of Maryland and a graduate of Princeton University. 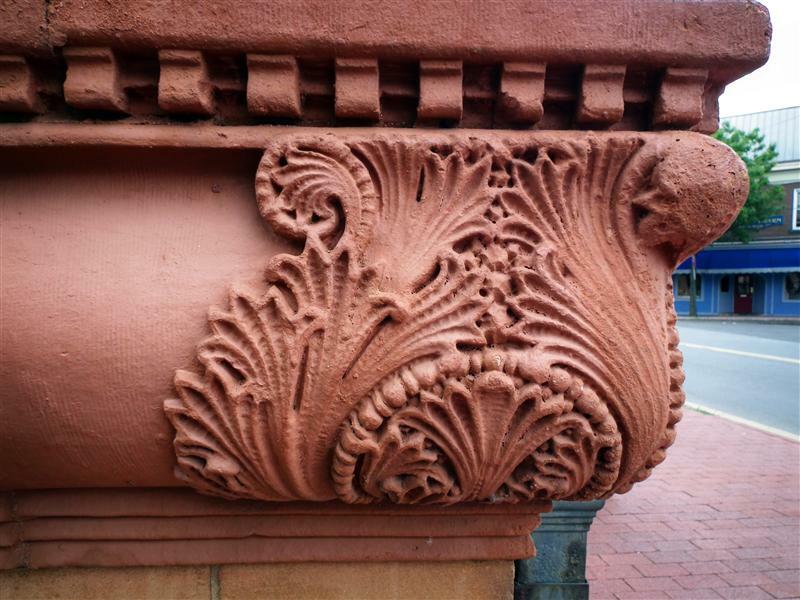 He designed several churches, banks, and other buildings in the mid-Atlantic area of the US, and in varying styles. 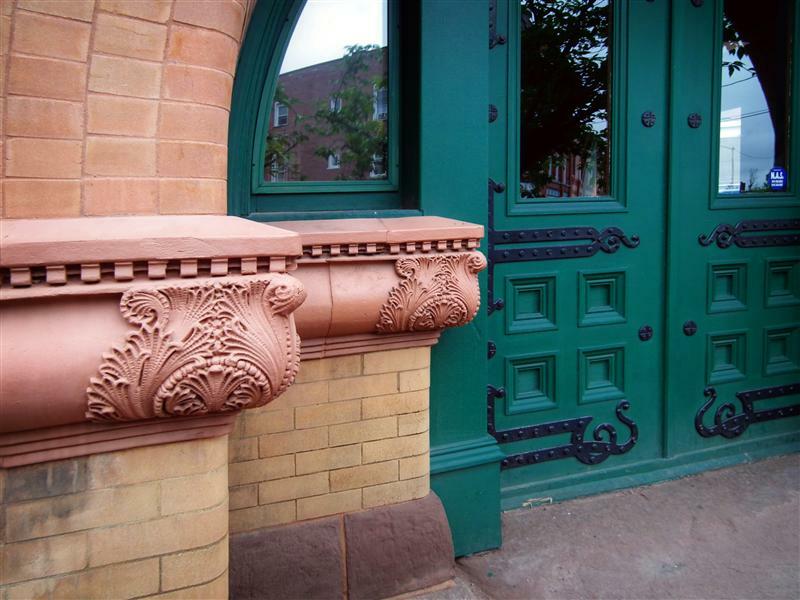 As I’ve mentioned before, the Romanesque style is definitely my favorite, and was popular in the US in the 1880’s and 1890’s. 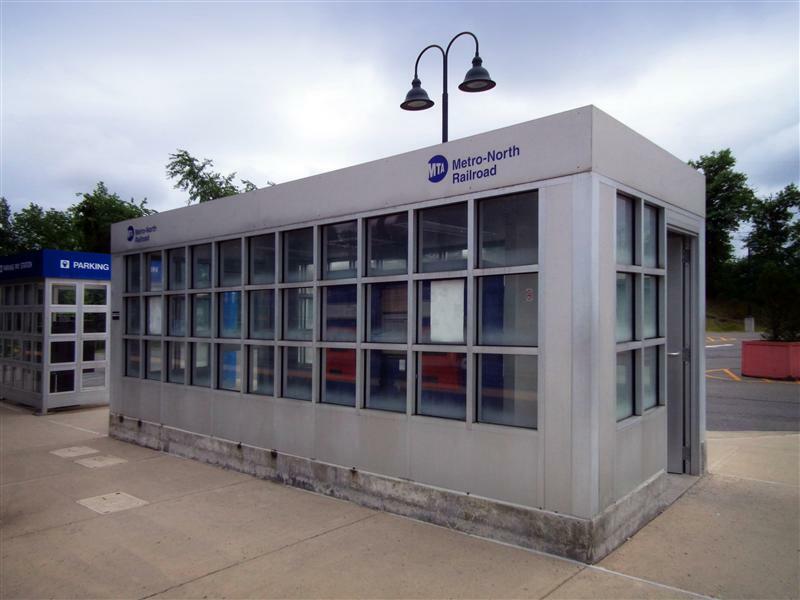 Chatham and Mamaroneck are other examples of stations designed in similar style which I’ve featured before. 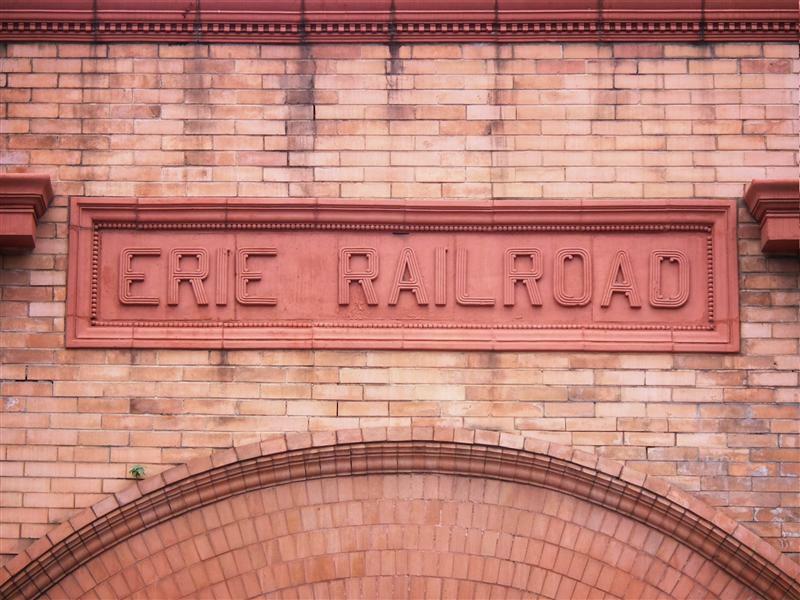 Though the name “Erie Railroad” is prominently emblazoned on the outside of the building, the station did in fact outlive that railroad. 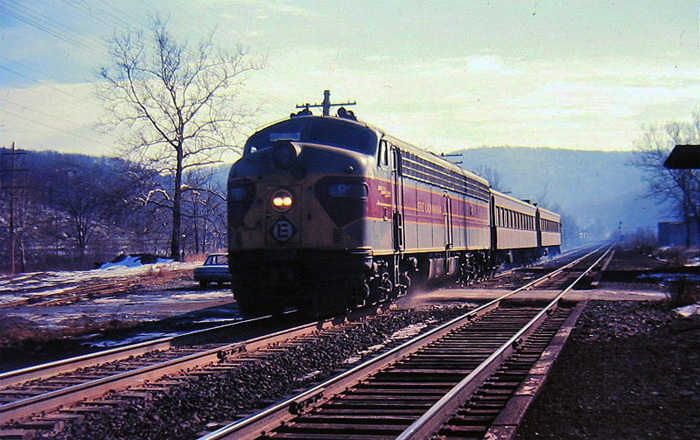 In 1960 the cash-strapped Erie, and the Delaware, Lackawanna and Western Railroads combined to form the Erie Lackawanna Railroad. 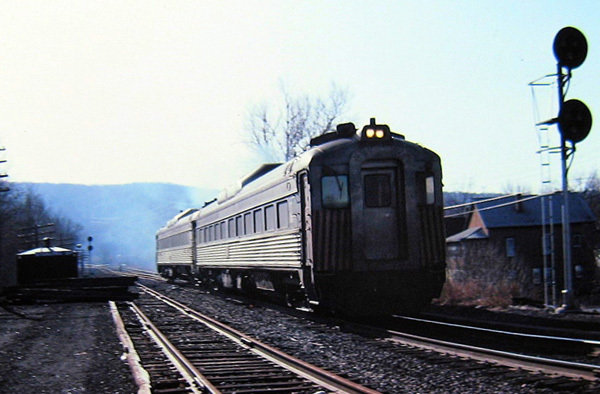 Similar to the fate of the Penn Central, the Erie Lackawanna eventually declared bankruptcy and was ultimately merged into Conrail. 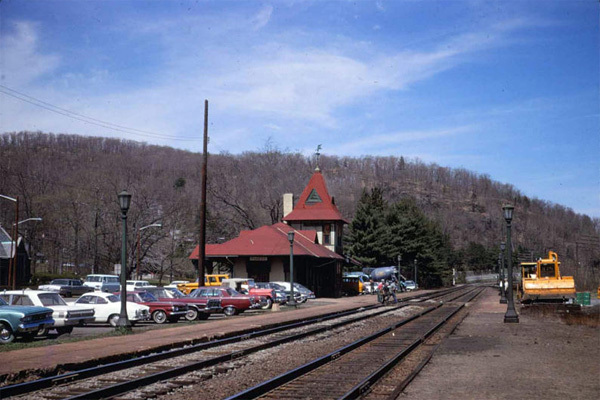 The station survived all of these changes, and stood watch as the final passenger train arrived at Middletown at 6 PM on April 16th, 1983. 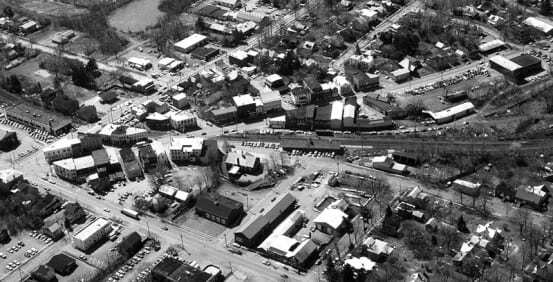 Photos of Middletown in the 1970’s, from the collection of Michael Jensen. 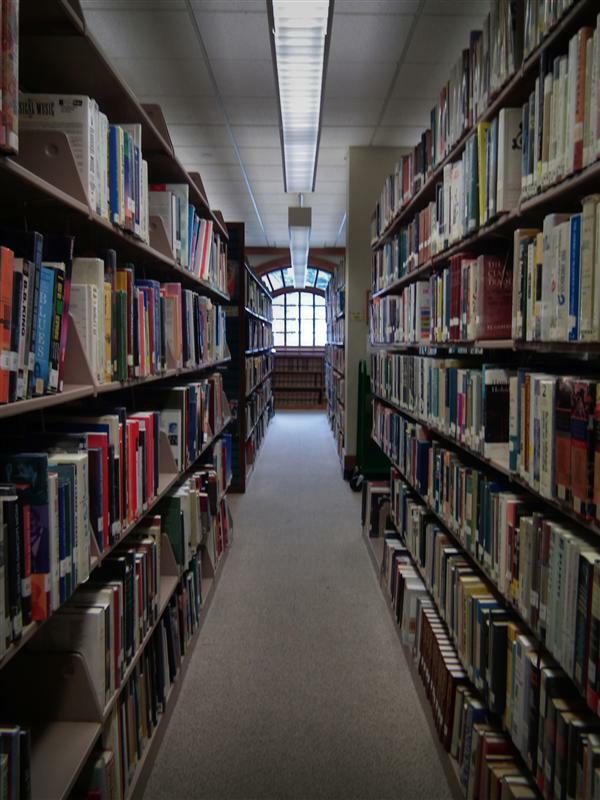 Fortunately, the story doesn’t end there. 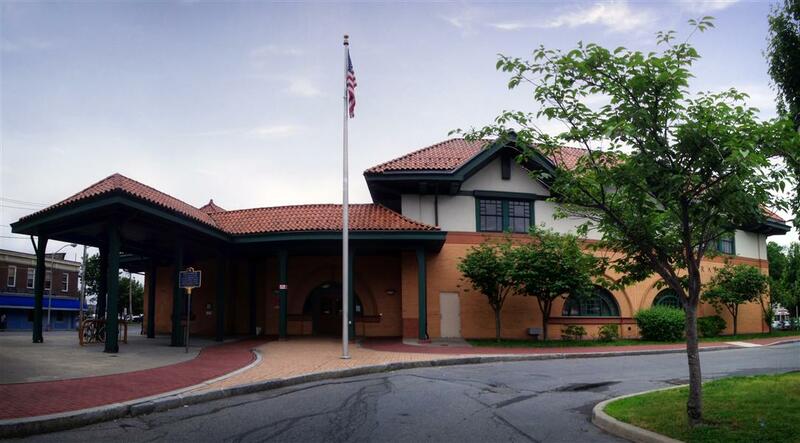 By the 1980’s, the Middletown Thrall Library began to run into a difficult, yet obvious problem – the building in which they were housed was too small. 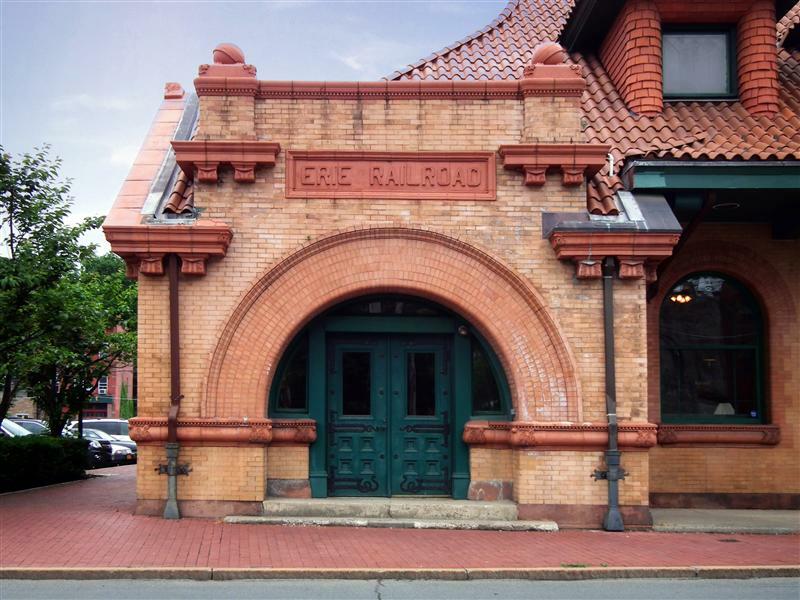 By 1991 a solution had been found – expanding and moving into the old Erie depot. 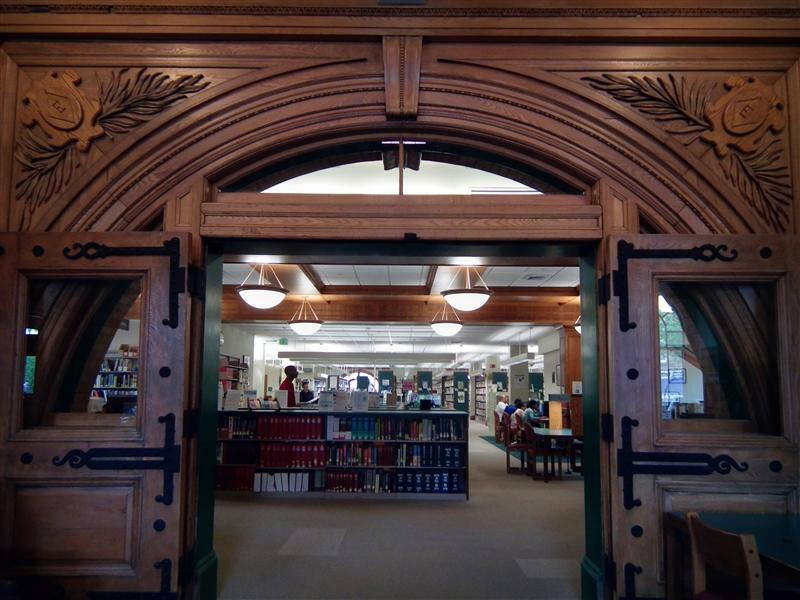 Construction began in October of 1993, and the library finally opened in its new home on February 13, 1995. 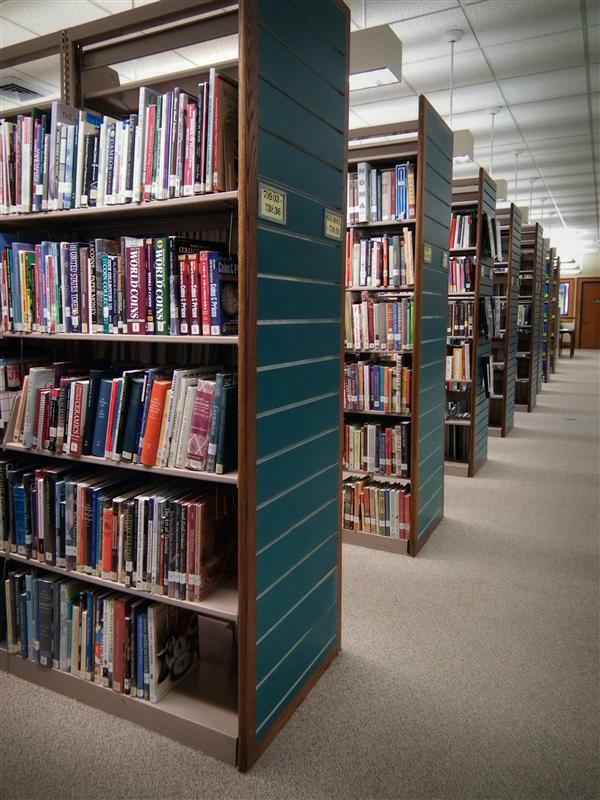 The new library cost a total of $5.3 million, and was now 30,000 square feet – much larger than its previous building. 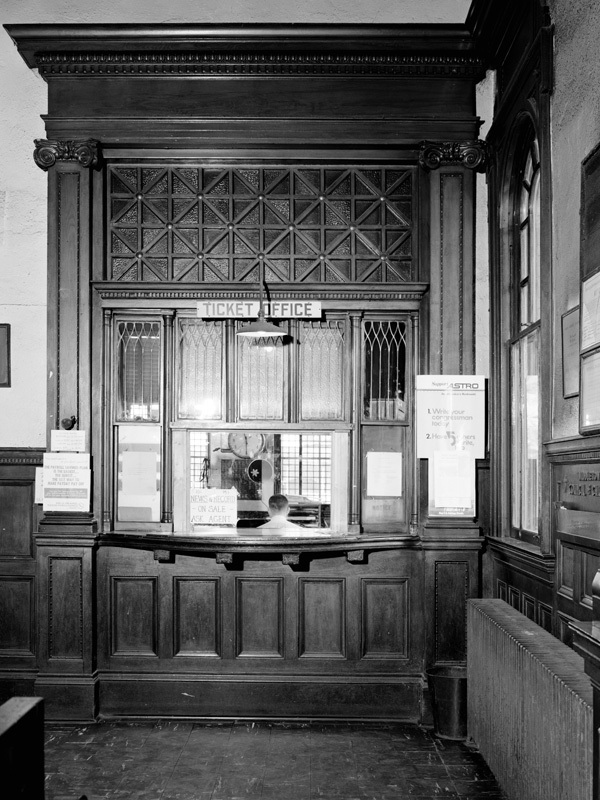 The library’s reading room is in what was the original station, and the director’s office was the original ticket booth. 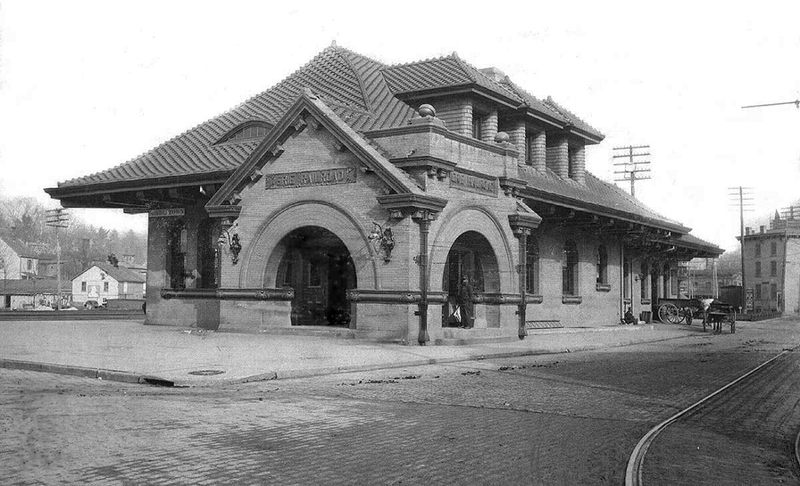 The rest of the building is modern, but made to mimic the style of the original station. 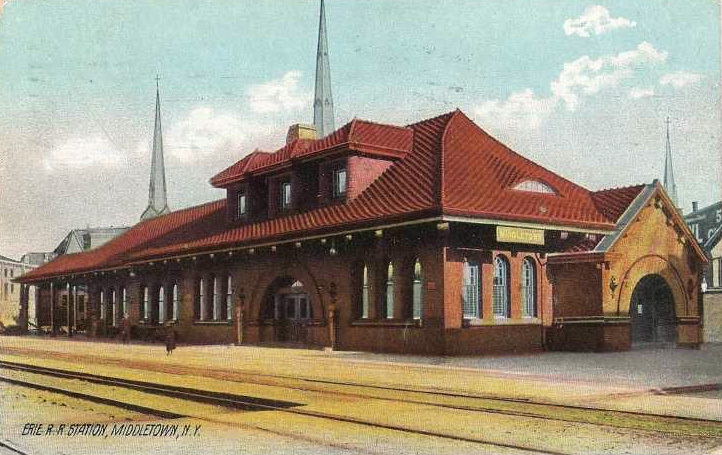 In several weeks we will visit Middletown’s replacement station on the Port Jervis Line on our Tuesday Tour, but suffice it to say, it pales in comparison to this beautiful building. 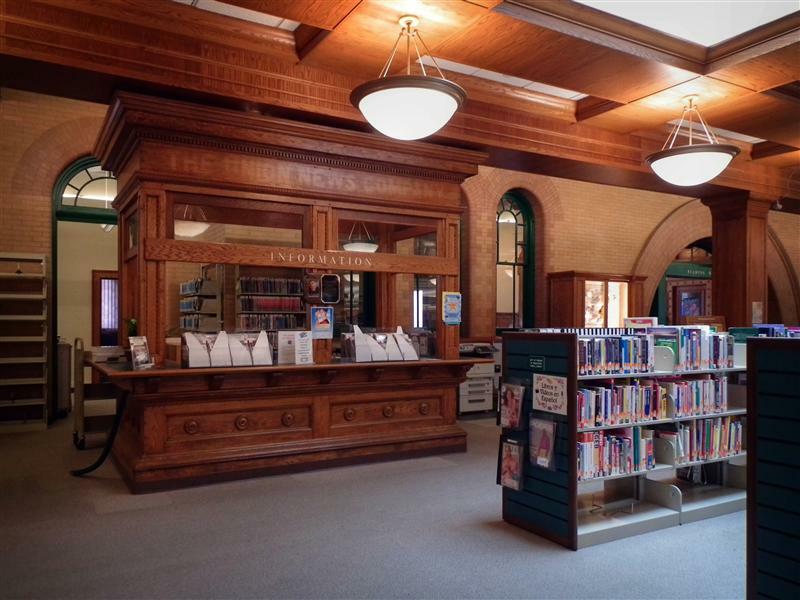 But I don’t think anyone can really complain – the former Erie depot makes a fine library. 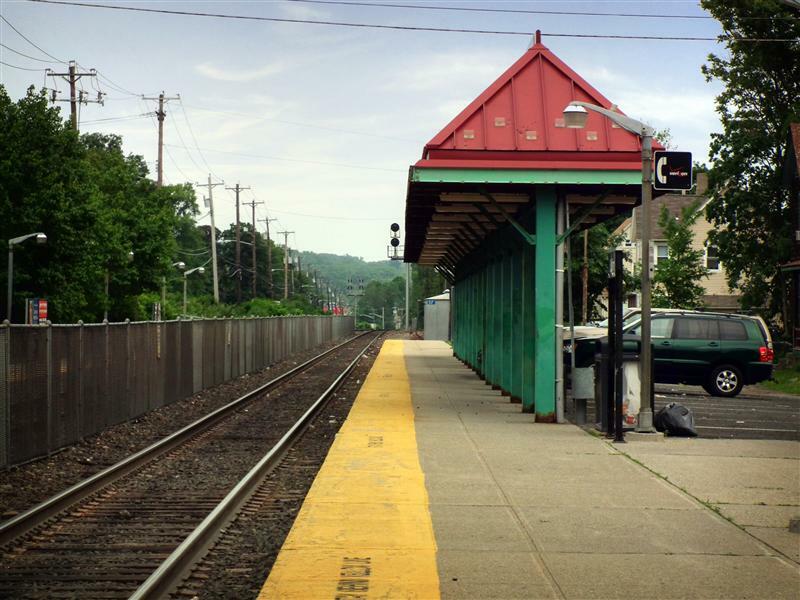 For the past two years, just about every Tuesday we’ve explored a new Metro-North station. 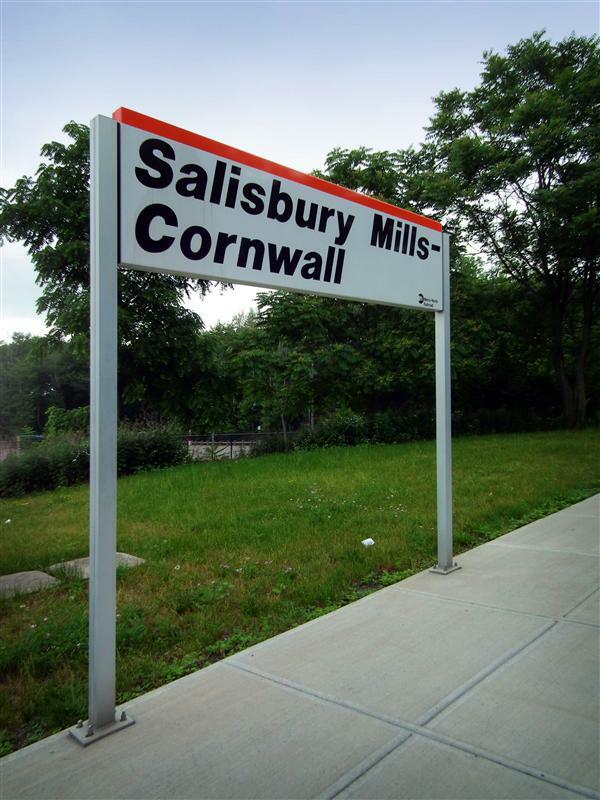 For the most part, these have been stations that you may have heard of before, but perhaps never visited. 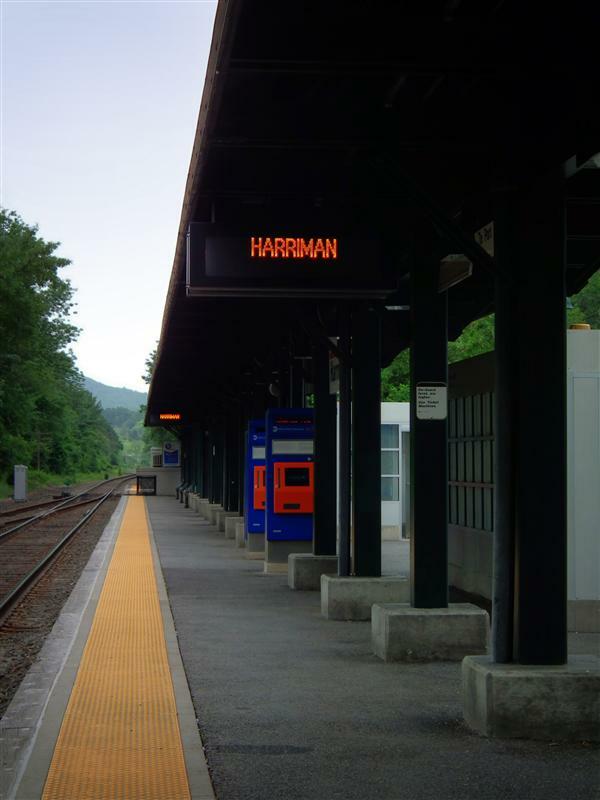 Most regular commuters are familiar with the three main Metro-North lines that terminate in Grand Central: the Harlem Line, the New Haven Line, and the Hudson Line. 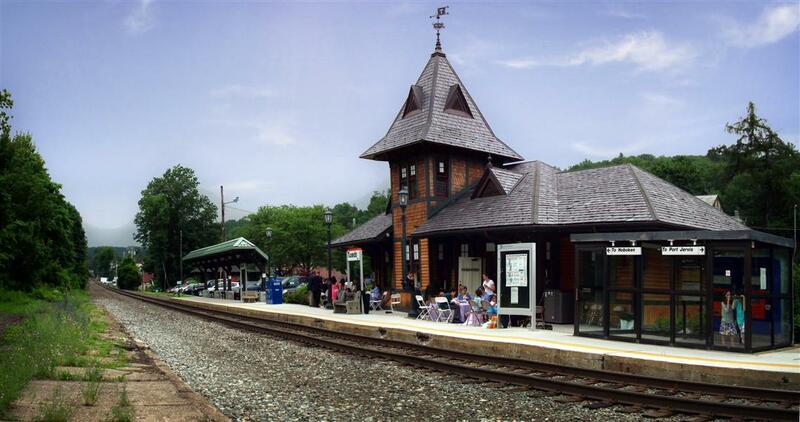 However, Metro-North owns the stations and funds the operation for two other lines, on the west of the Hudson River. 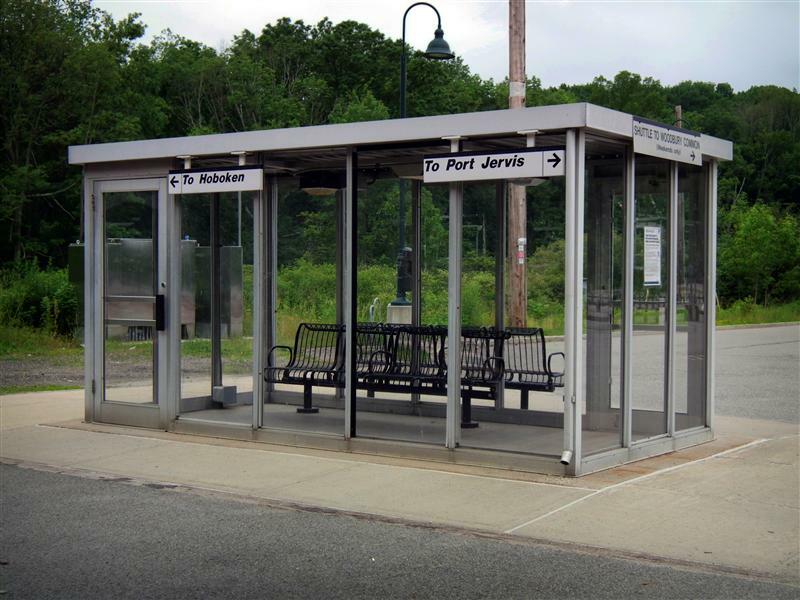 It is there that we will now point our attention, starting with the Port Jervis Line. 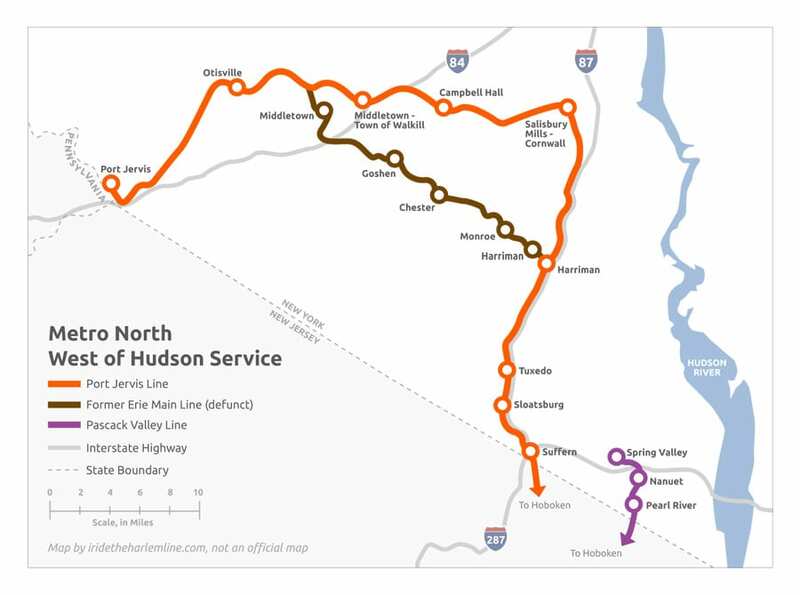 Map of the west-of-Hudson lines, including the former Erie main line that was abandoned in favor of the freight Graham Line. 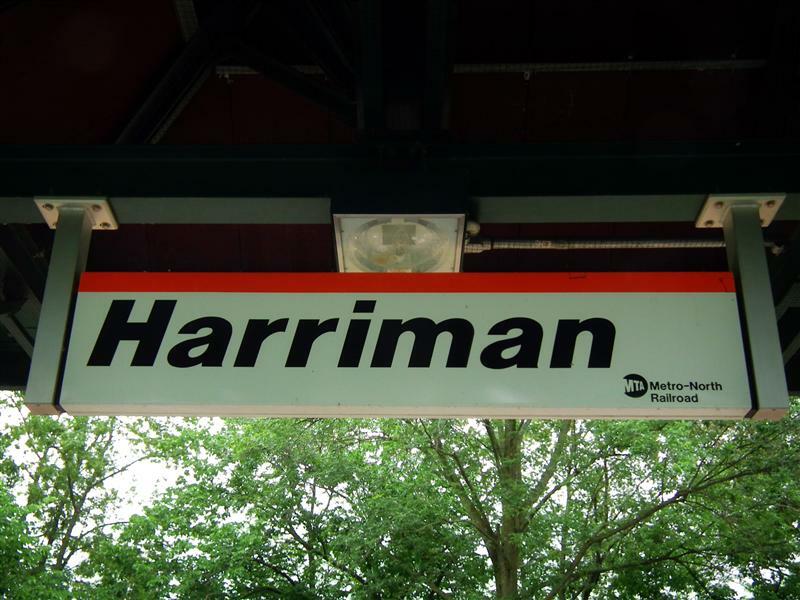 Though us commuters on the east side of the Hudson don’t purposely try to forget our fellows over on the west, it is at times easy to ignore them. 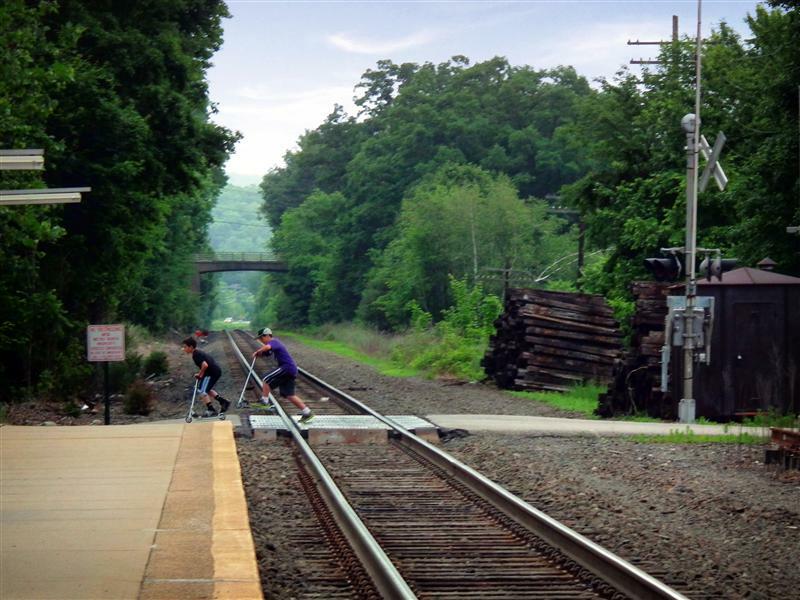 One pretty big reason is that their trains don’t run into Grand Central. 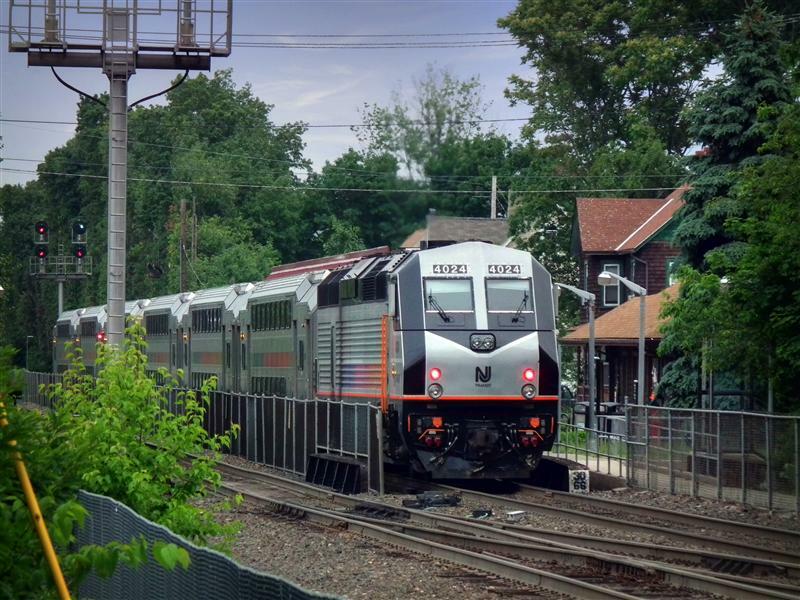 Another reason is that the service is operated by New Jersey Transit. 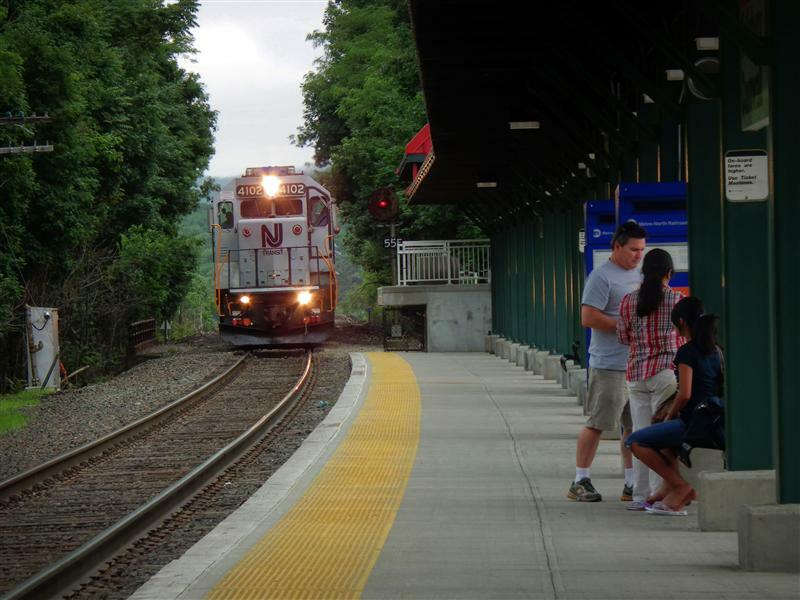 Although the stations are owned by Metro-North, and the railcars usually say Metro-North on the outside, the conductor you give your ticket to is a NJ Transit employee (and you probably bought that ticket from a NJ Transit TVM). 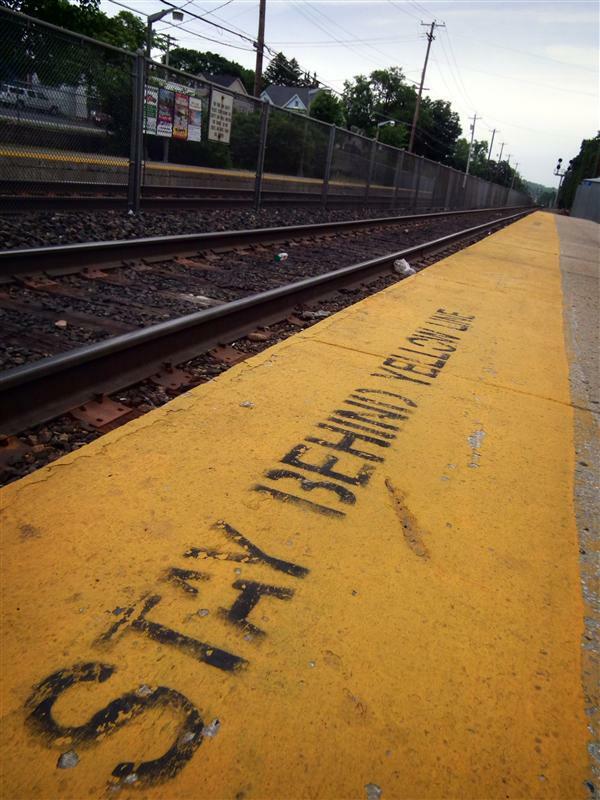 The lines may end in New York state, but they begin in New Jersey. 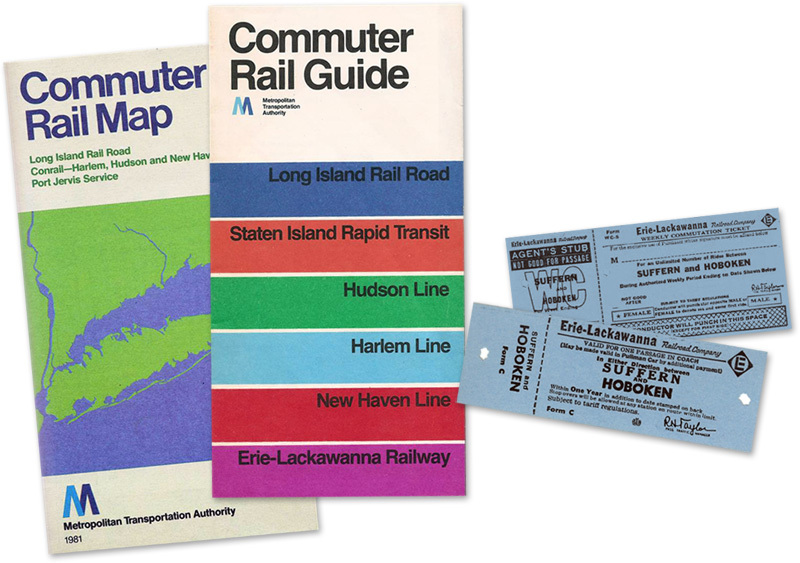 Ridership diagram of the west-of-Hudson lines, based on the number of rides to and from each station in an average week. 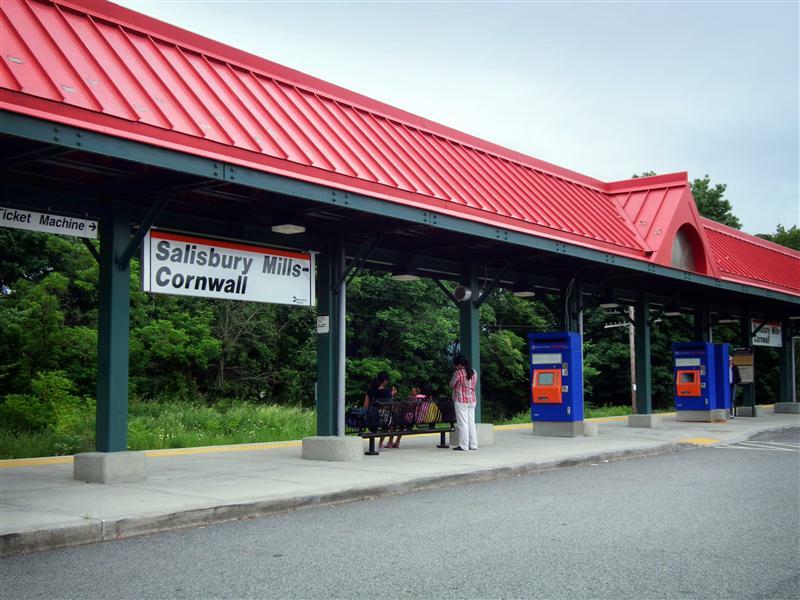 Larger station names designate more rides. 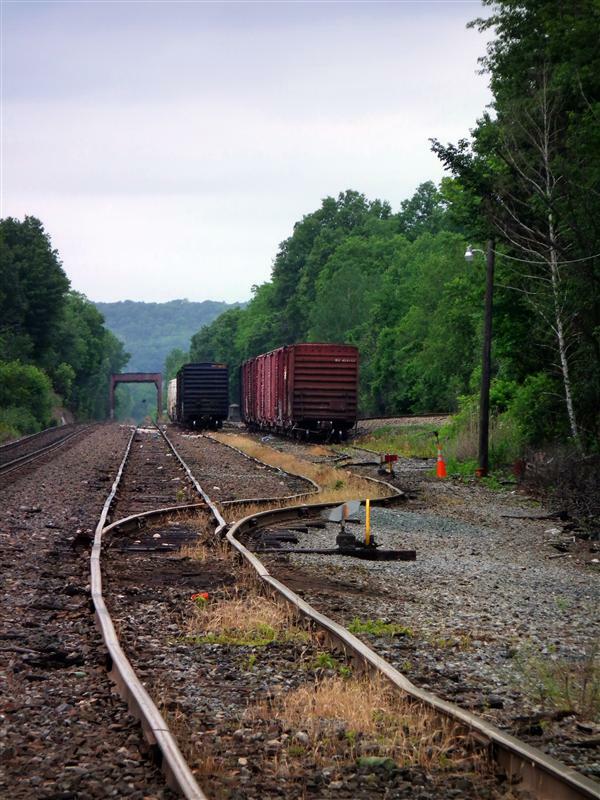 However, one event in the past year has unfortunately brought news of the west-of-Hudson lines to the forefront. 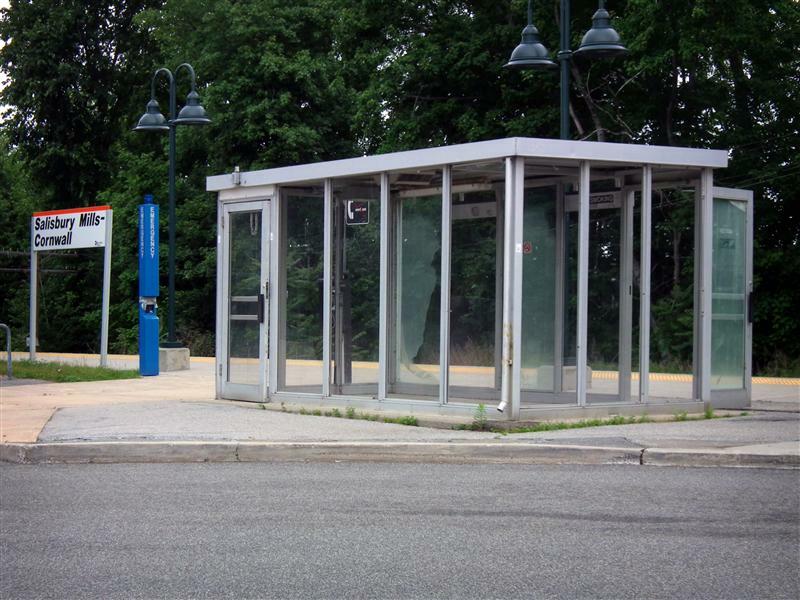 Last August’s impending Hurricane Irene led to an unprecedented shutdown of the entire MTA system, and although this helped significantly in mitigating damages, there were some places where it was unavoidable. 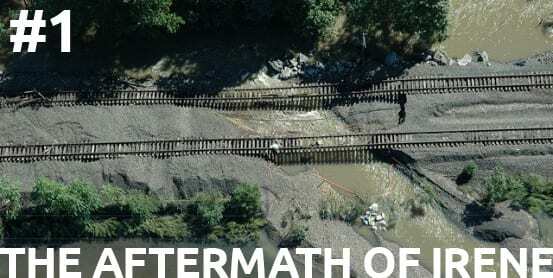 After the storm had passed and the damage was surveyed, Metro-North was likely the worst hit, compared with the other MTA agencies. Although there was flooding at stations along the Harlem and Hudson Lines, it was the Port Jervis that bore the brunt of the storm’s fury. 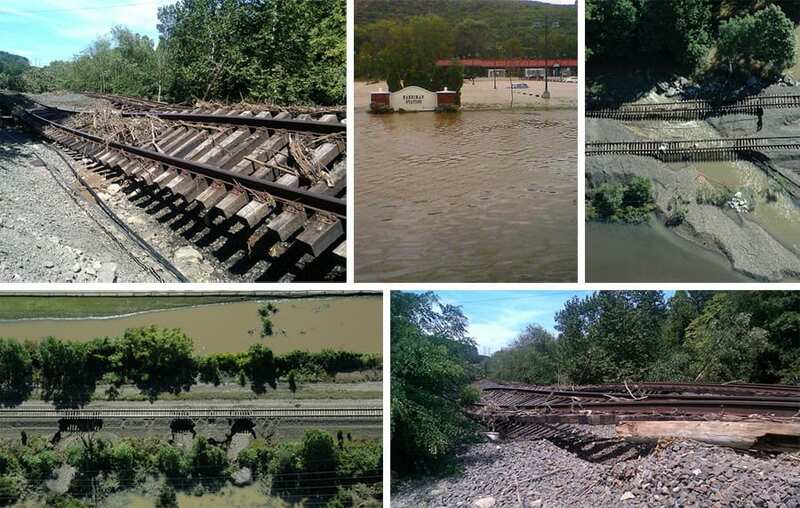 Service on the line was suspended indefinitely as washouts completely destroyed the track in some places, and entire parking lots were flooded. 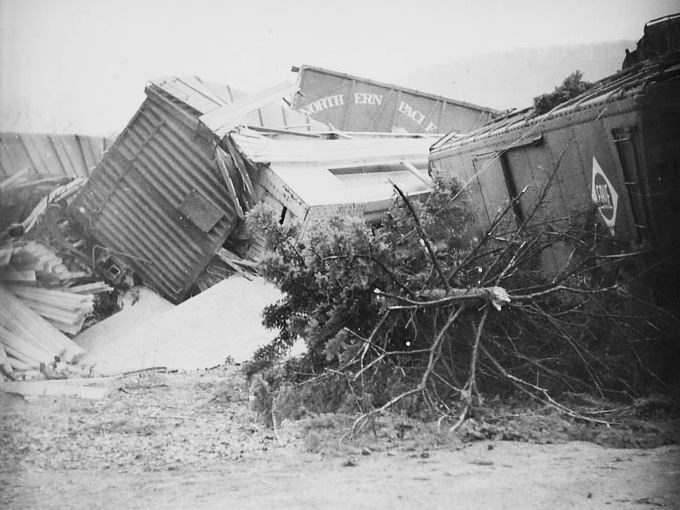 Photos of the damage became front page news – the Port Jervis Line had our attention – but for all the wrong reasons. Selection of photographs showing the damage on the Port Jervis Line after Hurricane Irene. 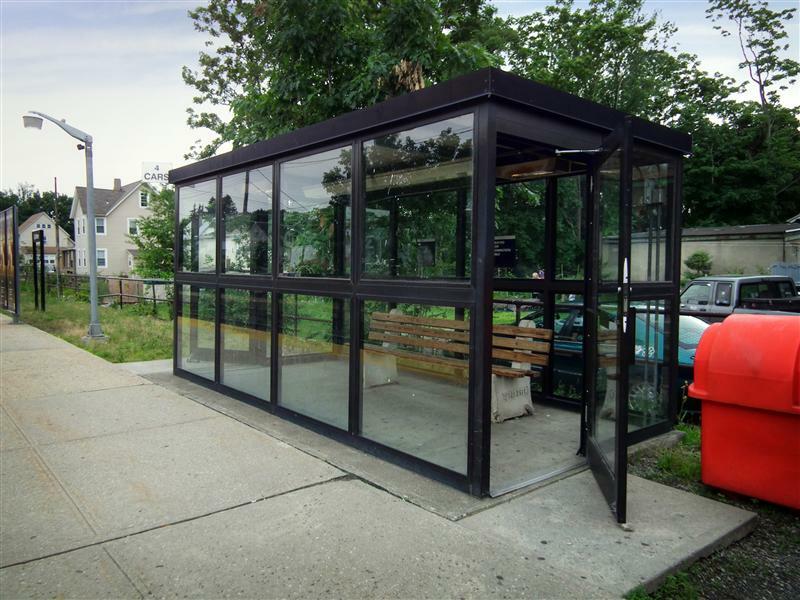 All photos from the MTA. 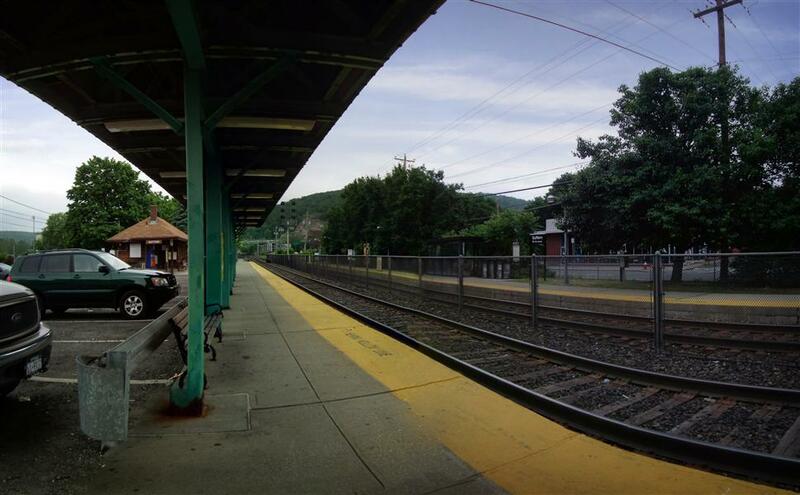 Aside from all that, the Port Jervis Line isn’t that bad a place. 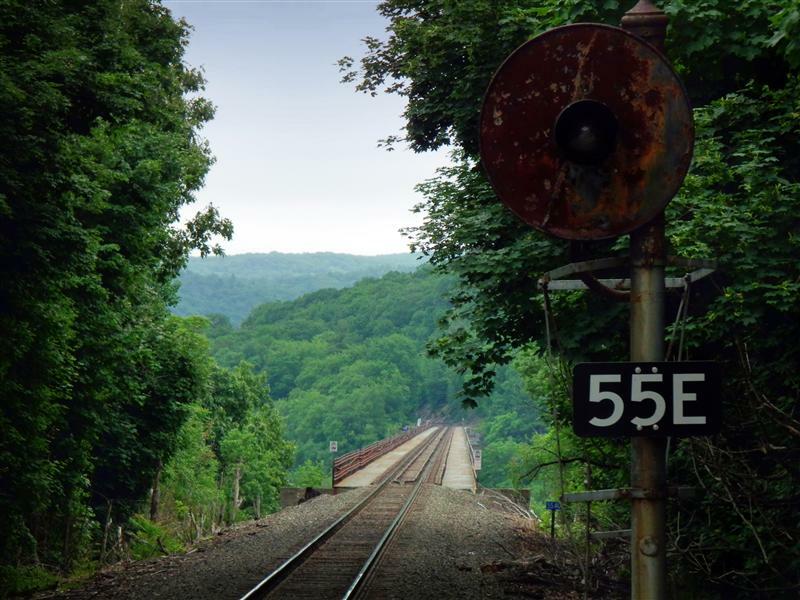 It is some of the most rural country on all of Metro-North’s territory, and riding a train through it all can be quite beautiful. 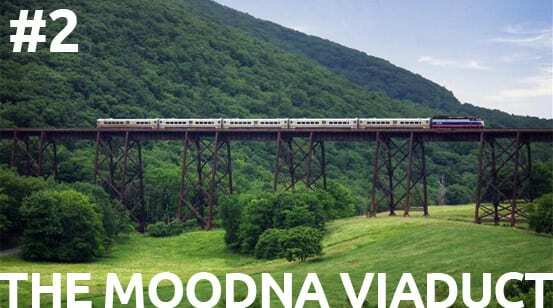 My favorite part of the line, the Moodna Viaduct, I featured on the site several months ago. 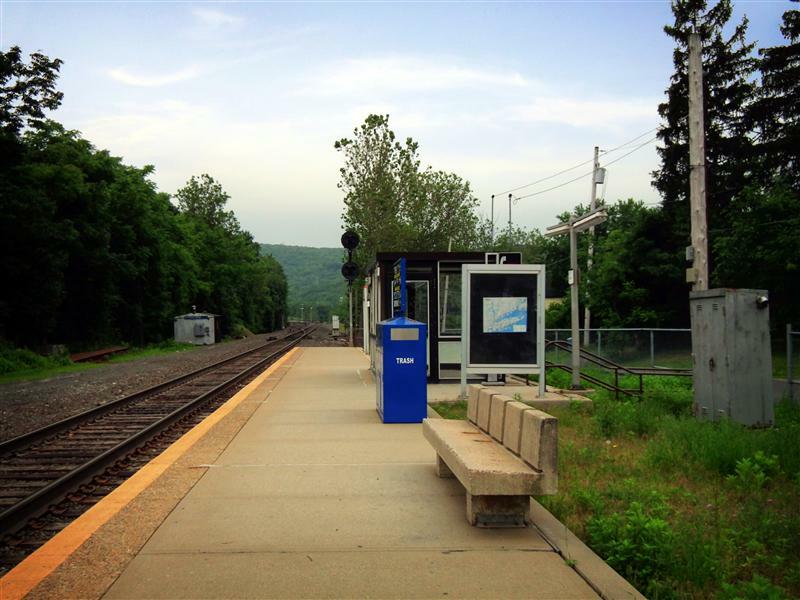 Most of the stations really aren’t much to write home about, but there are several former stations – like Middletown, and Port Jervis – which I also plan on showing you all. 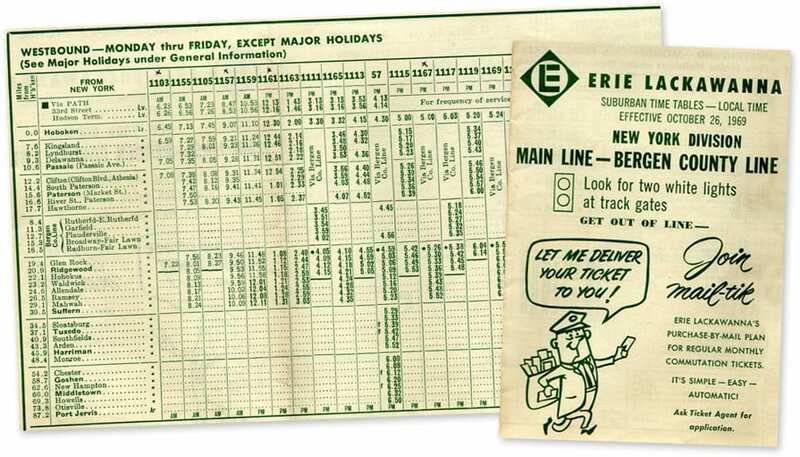 1969 Port Jervis main line timetable, which includes the line’s original passenger stations, until that part of the line was abandoned in the 80’s. 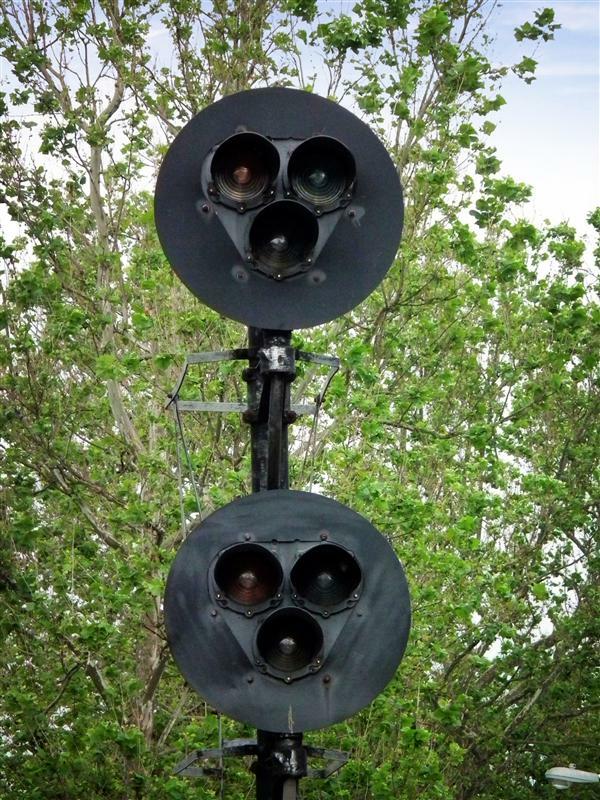 From the collection of Michael Jensen. 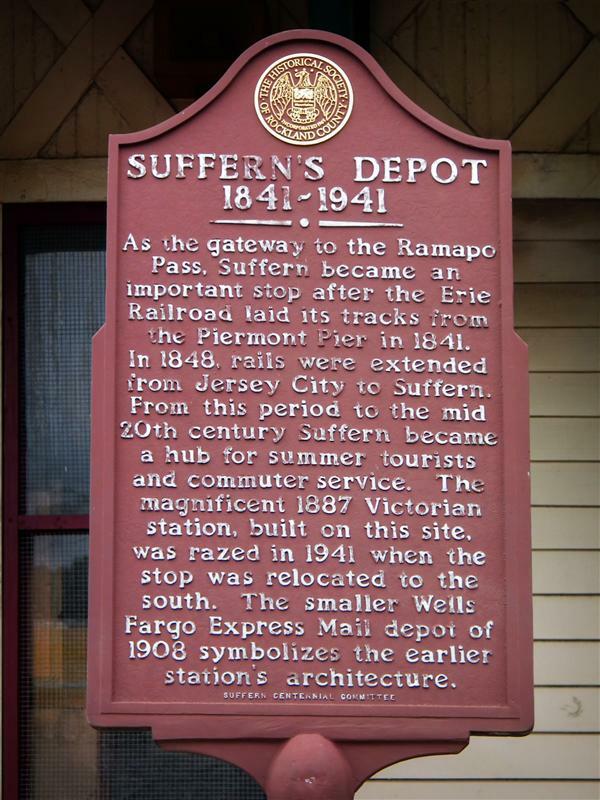 Before we begin the tour next Tuesday with Suffern, I thought it would be good to mention a little bit of back story regarding the line. As I mentioned previously, none of the current stations (with perhaps the exception of Tuxedo) are really noteworthy – part of this is because the route the Port Jervis line now follows was not the original route for passengers. 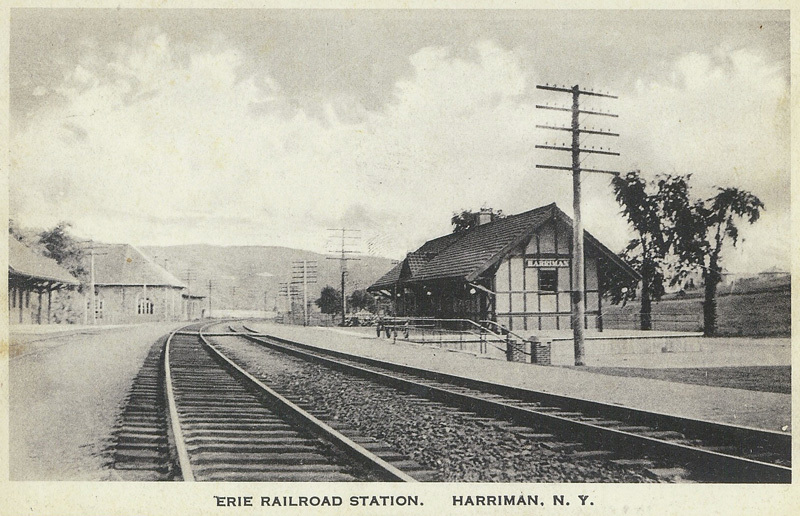 The original Erie main-line diverted west just after Harriman, and passed through Monroe, Chester, and Goshen, before meeting back up with what is the current line just after Middletown. Aerial view of the Erie main line running through the town of Goshen. 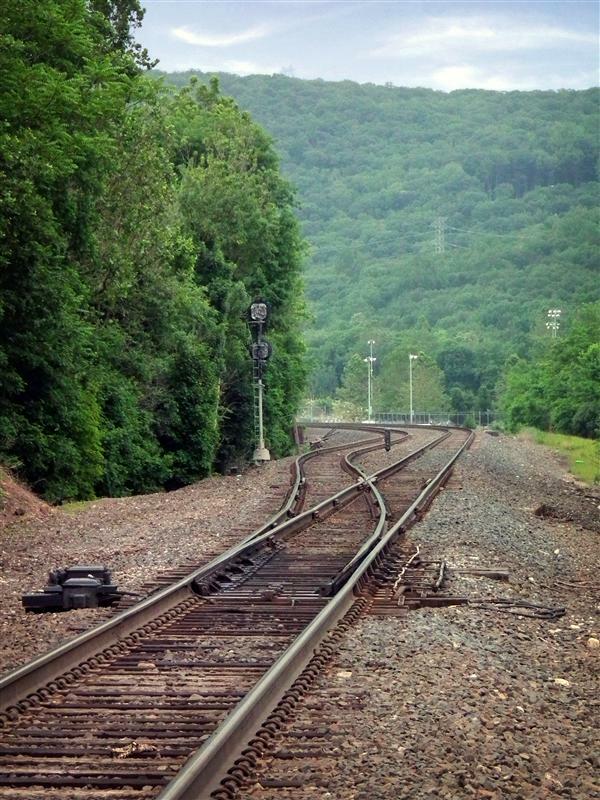 This portion of the rail line was removed in the 80’s. 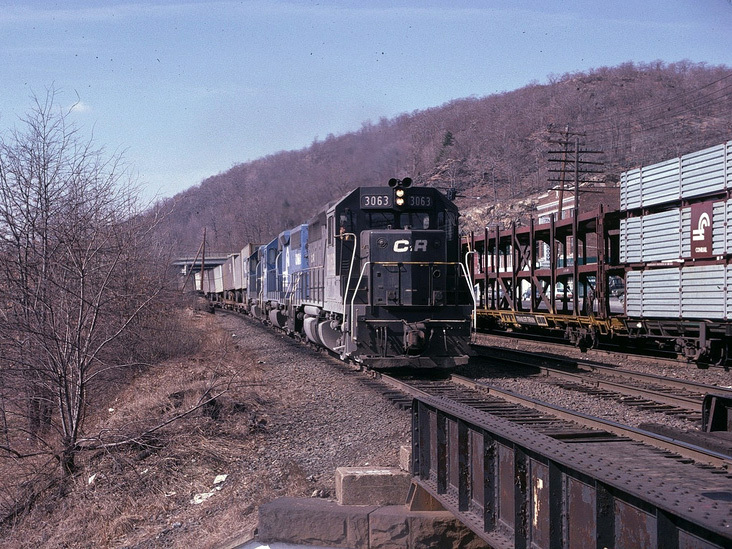 The route the trains now follow was called the Graham Line, and was used mostly for freight. 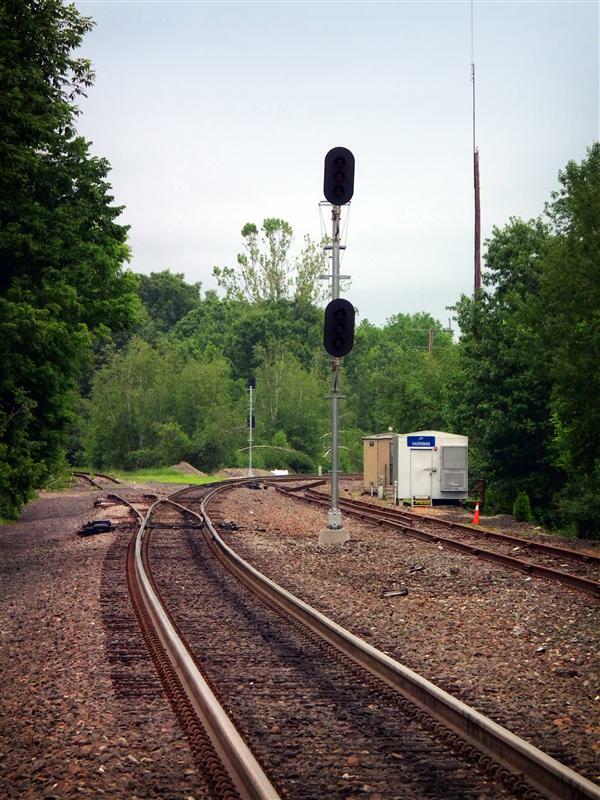 Instead of having to maintain two sets of tracks in roughly the same geographical area, a portion of the main line was abandoned in favor of the better-maintained Graham Line. 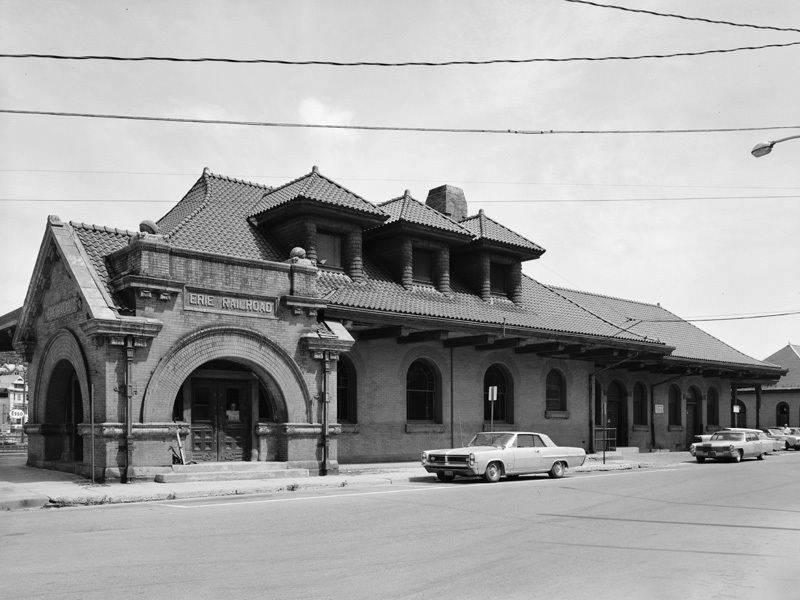 This also meant abandoning several historical passenger stations (like the beautiful Erie depot in Middletown, now a library), and building new, relatively utilitarian, facilities on the former freight line. 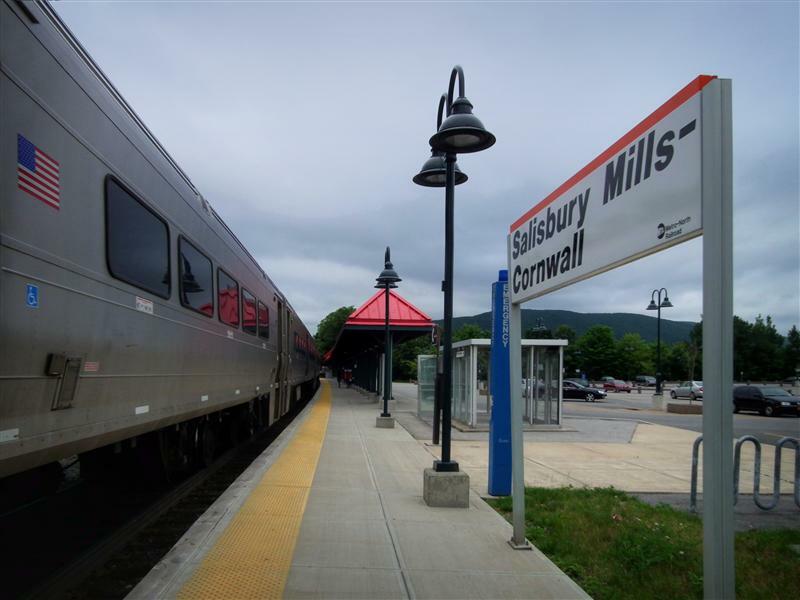 And instead of running right through the center of several towns, trains run on a more circuitous route outside of heavily populated areas. 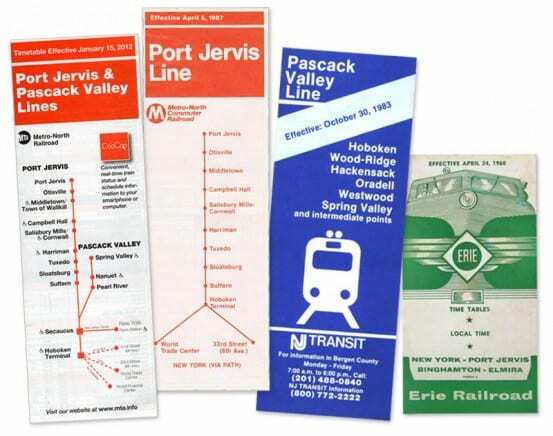 Other various area timetables, including the current combined Port Jervis and Pascack Valley timetable. 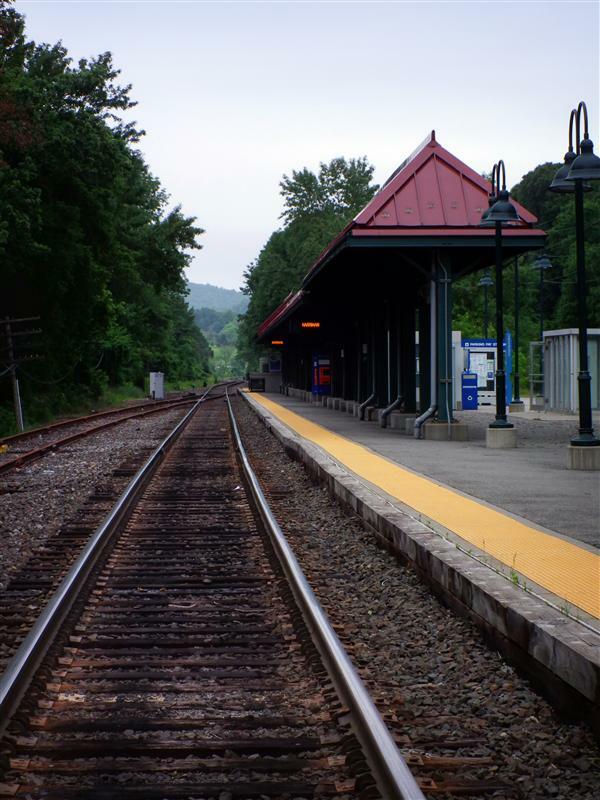 Since I have all of the Port Jervis stations photographed, I thought it might be nice to actually travel the line in order, starting with Suffern (which is really more of a New Jersey Transit station, though in New York state). 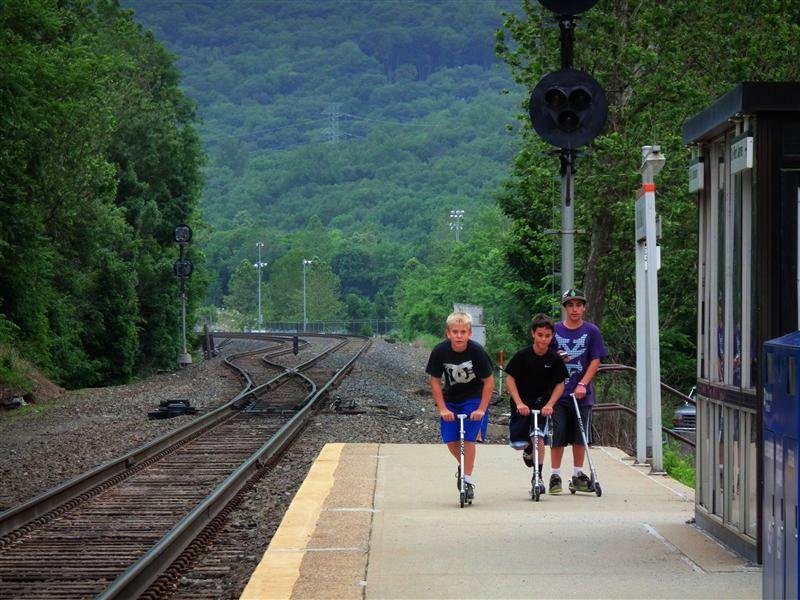 Look for the Tuesday Tour of the Port Jervis Line, starting next week. 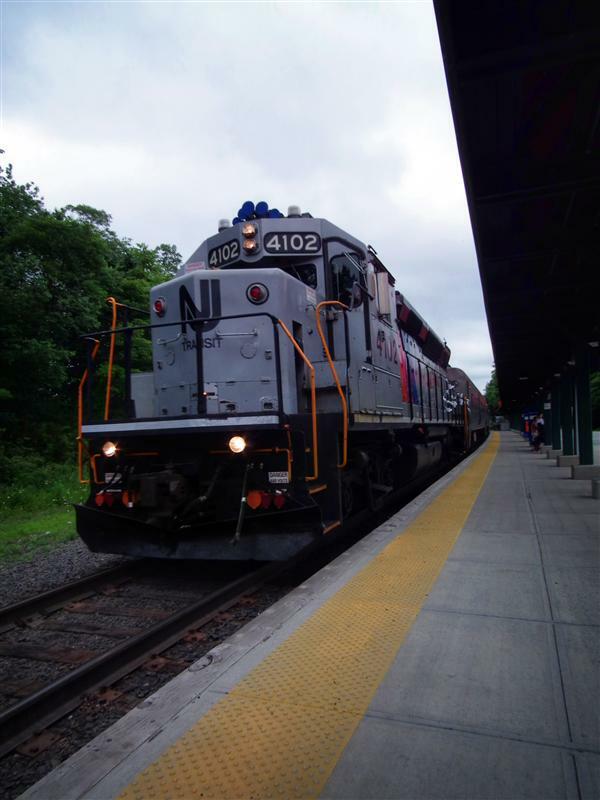 Metro-North will of course be offering additional trains for the upcoming holiday, starting on Friday afternoon and continuing on Saturday and Sunday. 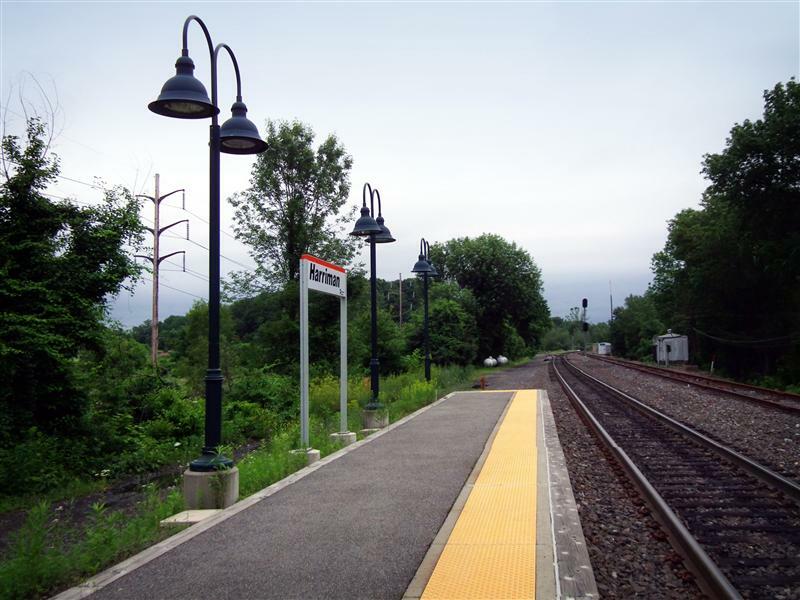 Metro-North President Howard Permut was the railroad’s Vice President of Planning before landing his current gig… so he’s got a pretty good sense of where and how things ought to be improved. 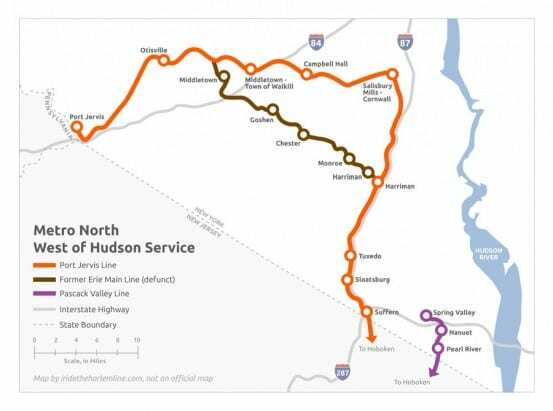 Not only is he eyeing the New Haven Line for big improvements, but he’s also looking at service West of the Hudson. 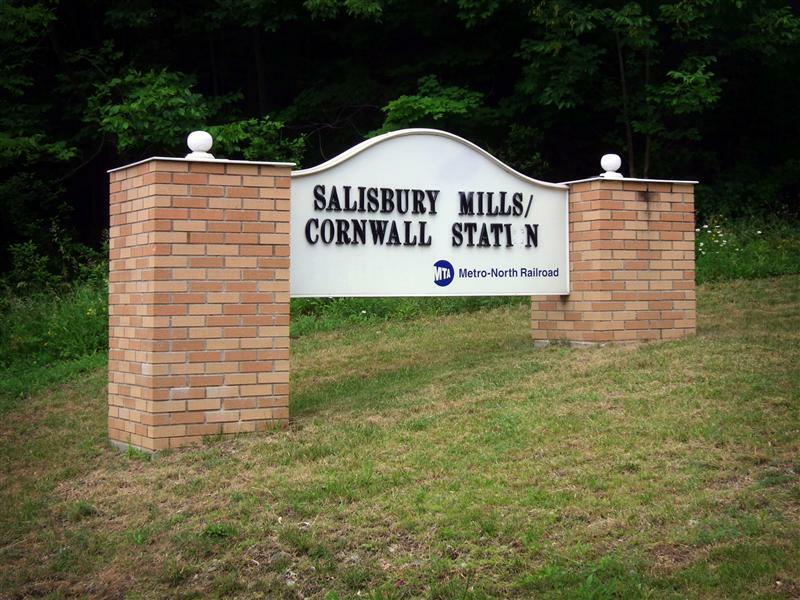 On his wish list is a second track on the Port Jervis Line, and a connection to Stewart Airport. 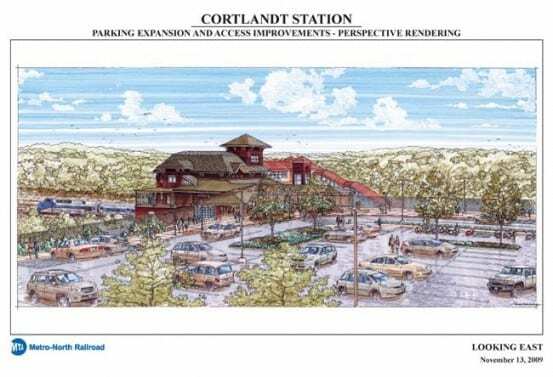 The train station upgrades at Cortlandt, which included new parking and amenities, are almost done – though slightly behind schedule. 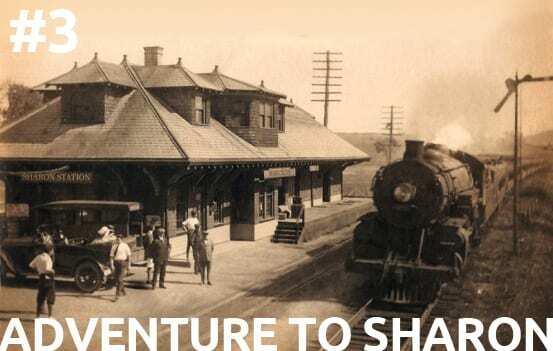 This week the city of Mount Vernon released a new comprehensive plan with suggestions for improvement. 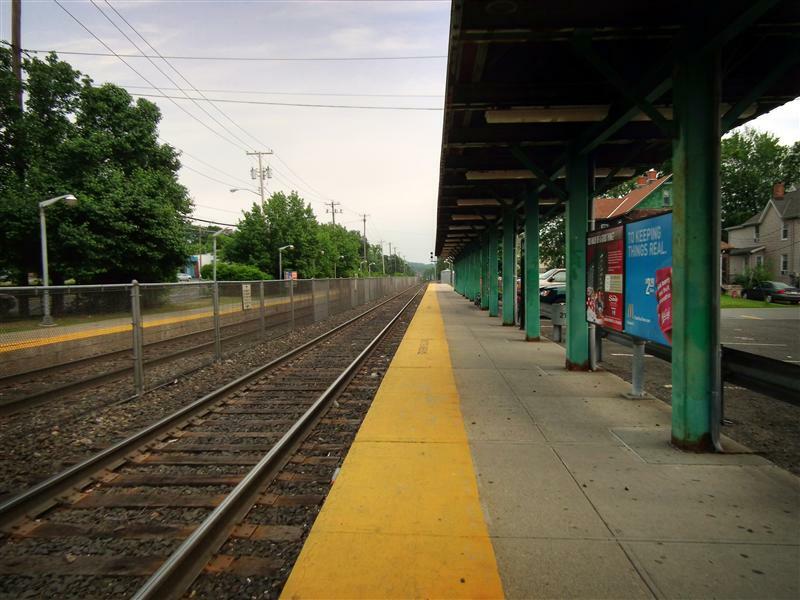 Suggestions included expanding Bee Line Bus service in the city, and further developing the areas surrounding the Mount Vernon East and West stations. 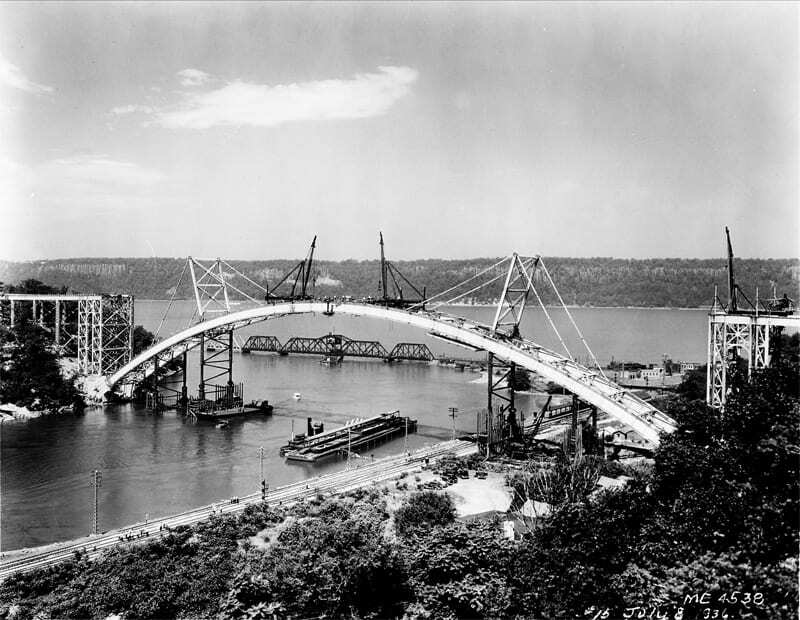 On Thursday the Henry Hudson Bridge turned 75 years old… and there was no way I could resist posting that old construction photo from 1936! 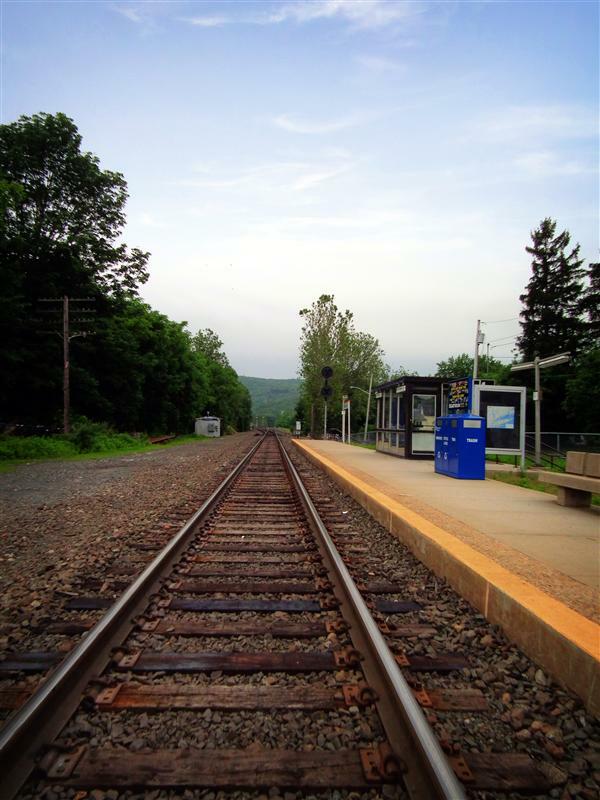 Progressive Railroader has an interesting piece on thoughts for passenger rail in 2012, with thoughts on various transit systems across the country, including Metro-North. 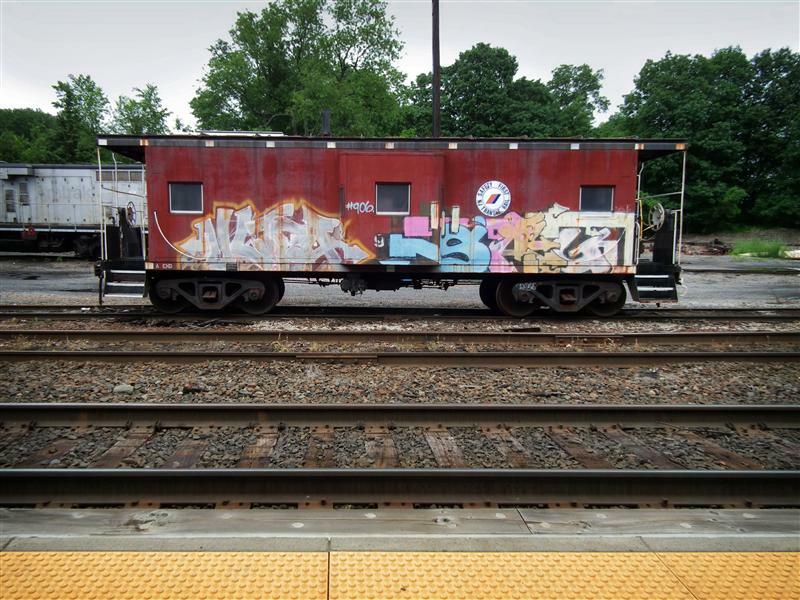 Kent Patterson worked for Metro-North for 37 years as a yard and train master, but in retirement has turned back to an old love – painting. 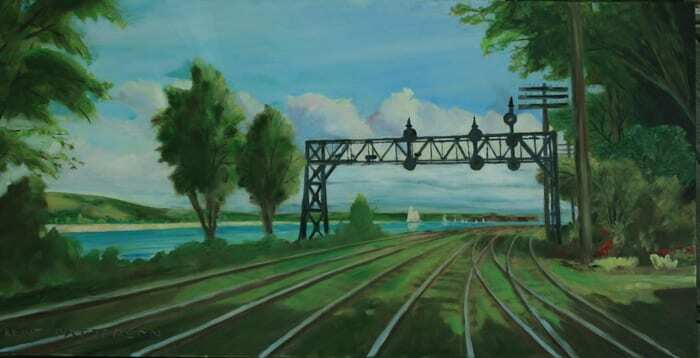 Prominent in his work are the trains and scenery he worked with for so many years. 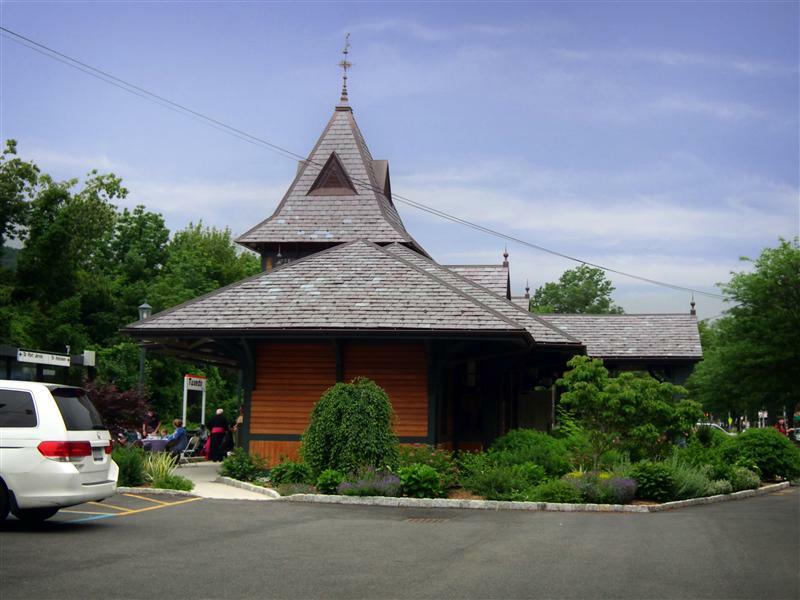 His paintings will be on display in Briarcliff Manor, and are certainly worth checking out. 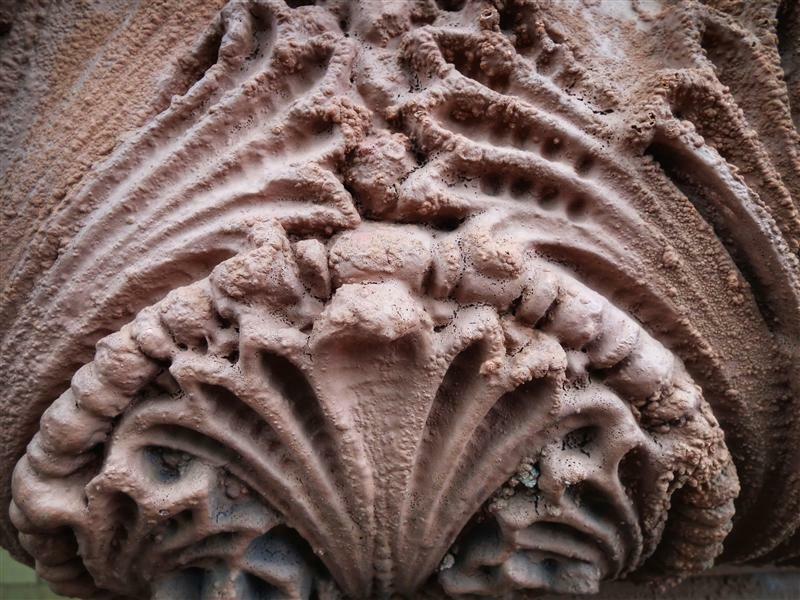 Buzzfeed has an amusing collection of 22 photos from NYC’s Santacon, which was last weekend. 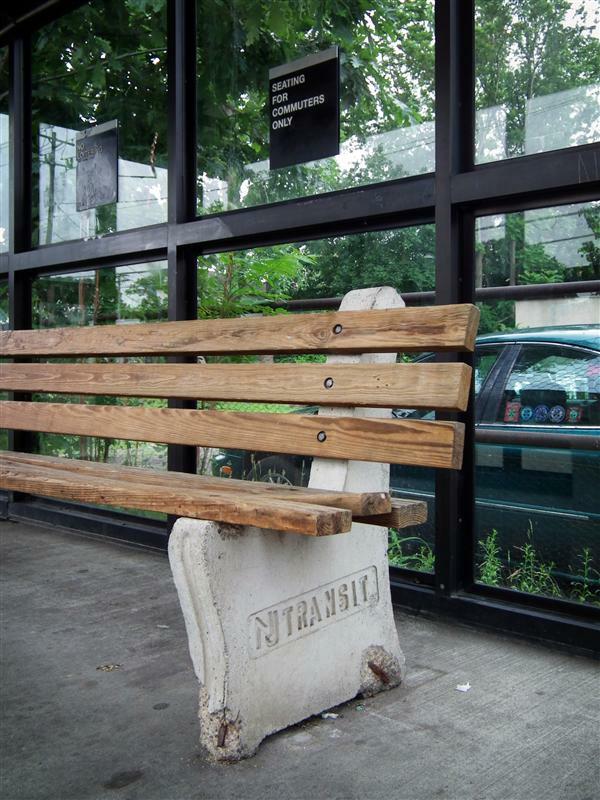 And of course since it was in New York City, some mode of public transportation is involved. 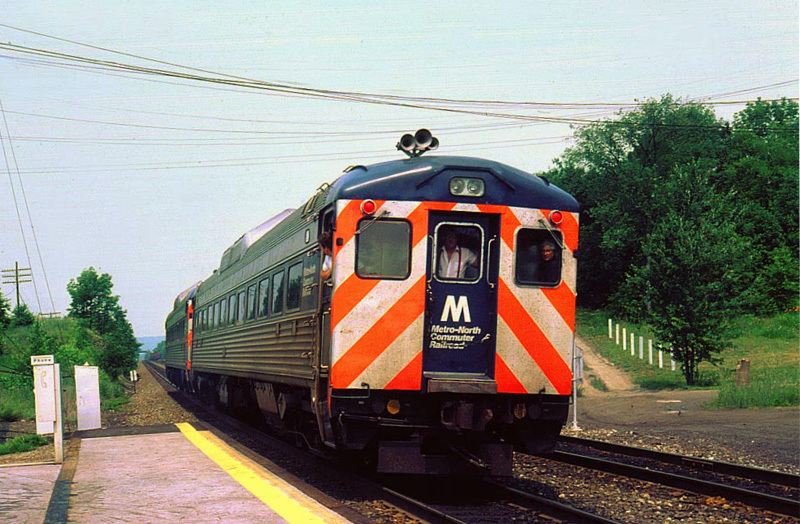 Who knew that Santa rode Metro-North?